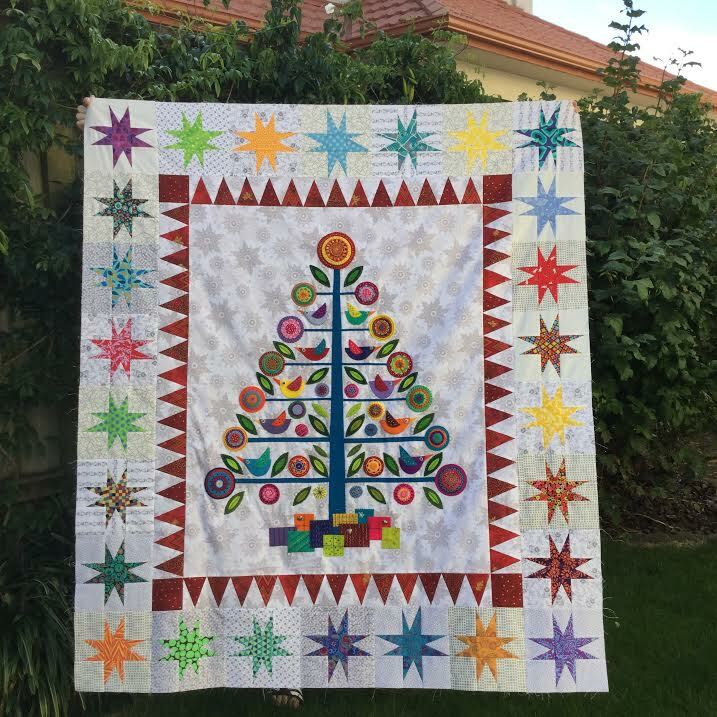 Posted on July 19, 2016 by Elizabeth E.
Today is Step 7 — the final step — of our Oh Christmas Tree Quilt-a-Long (#ohchristmastreeqal), following a pattern by Wendy of FlyingFishKits and which was published in Simply Moderne issue #3, by QuiltMania. 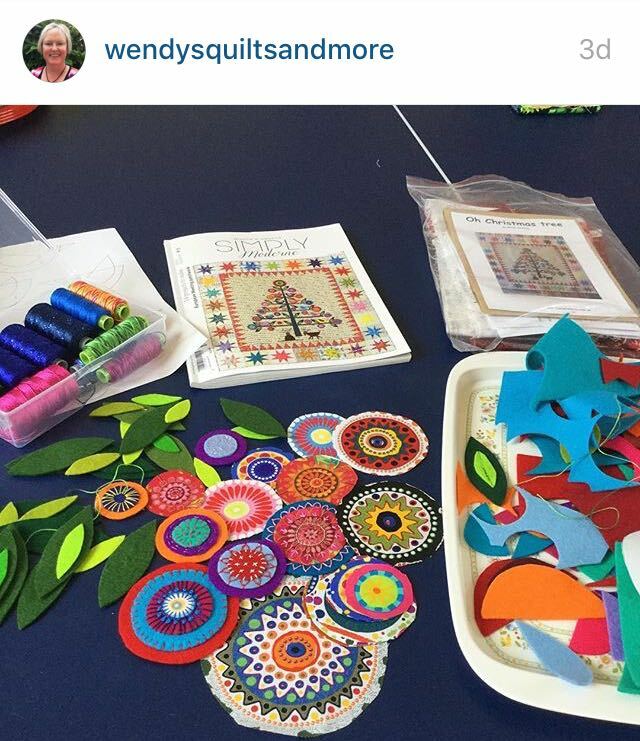 As always, we have an assist from Wendy of Wendy’s Quilts and More (blog) and wendyquiltsandmore (IG). 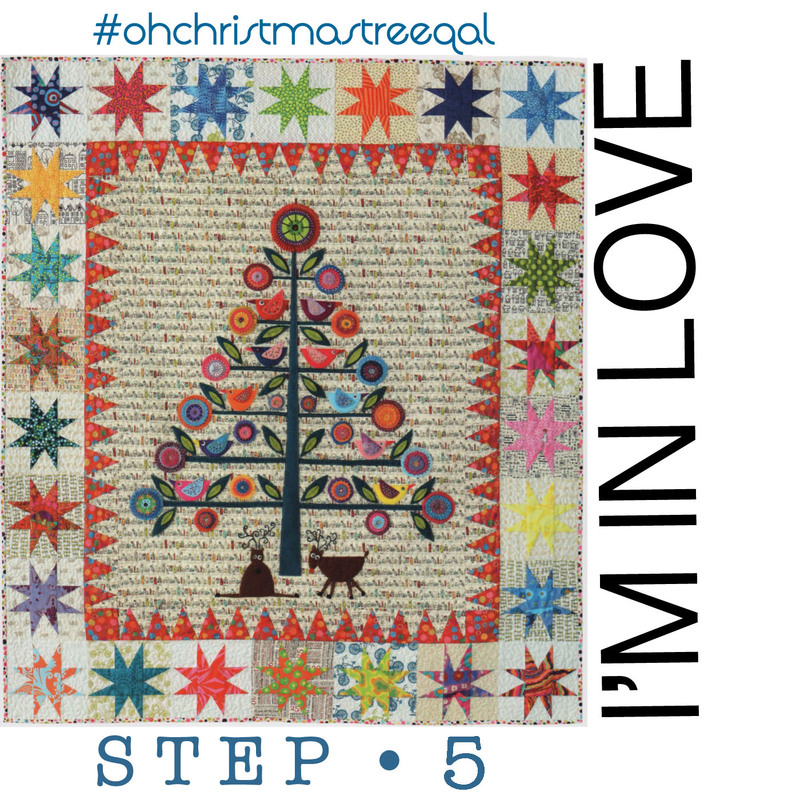 Our hashtag on Instagram is #ohchristmastreeqal so look there for more ideas. 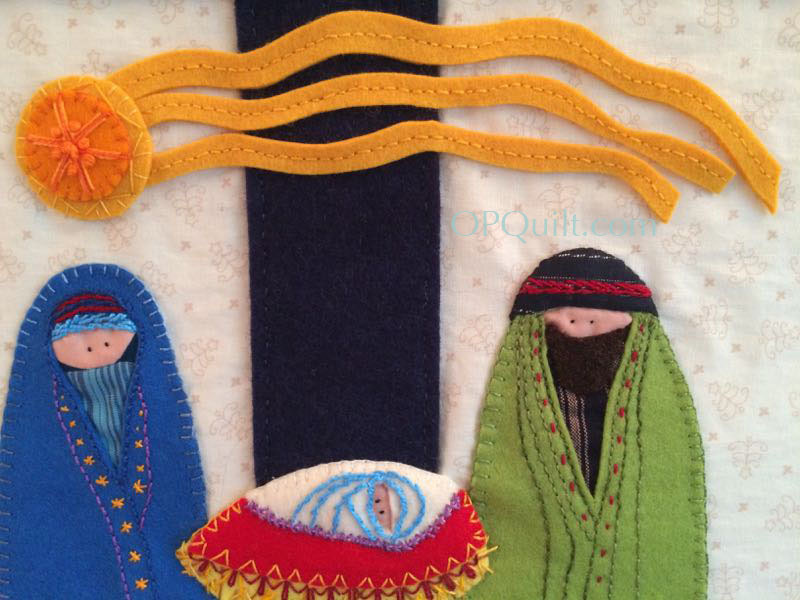 Yes, today we are wishing upon a star, the final part of this quilt. We started this journey 7 months ago in January 2016, right after the magazine came out, and today we’ll finish it up. Your tree should have the red triangle borders on. See earlier post for how to get them on. 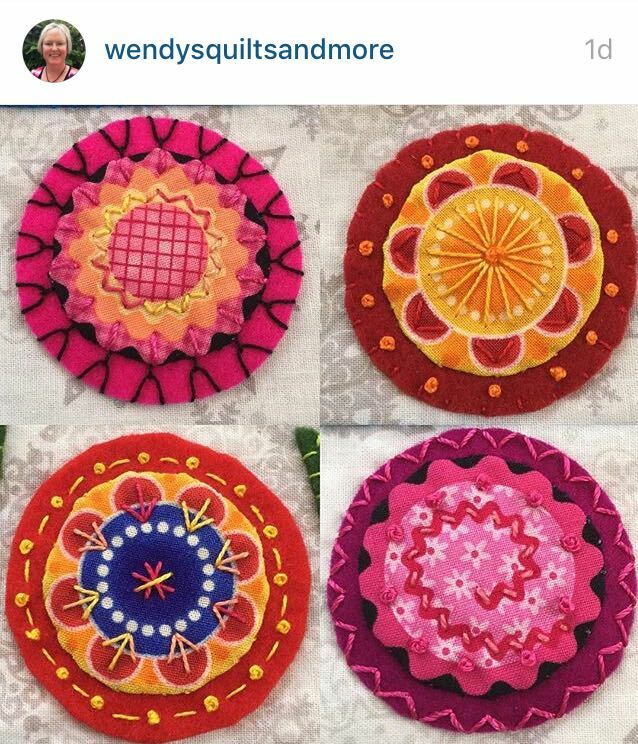 Wendy has laid out several fabrics for her stars, above. I thought I wanted to go with traditional Christmas colors of red and green, but realized quickly that I should go with colors that coordinated with the flowers and birds. In other words, be bold in your star colors. 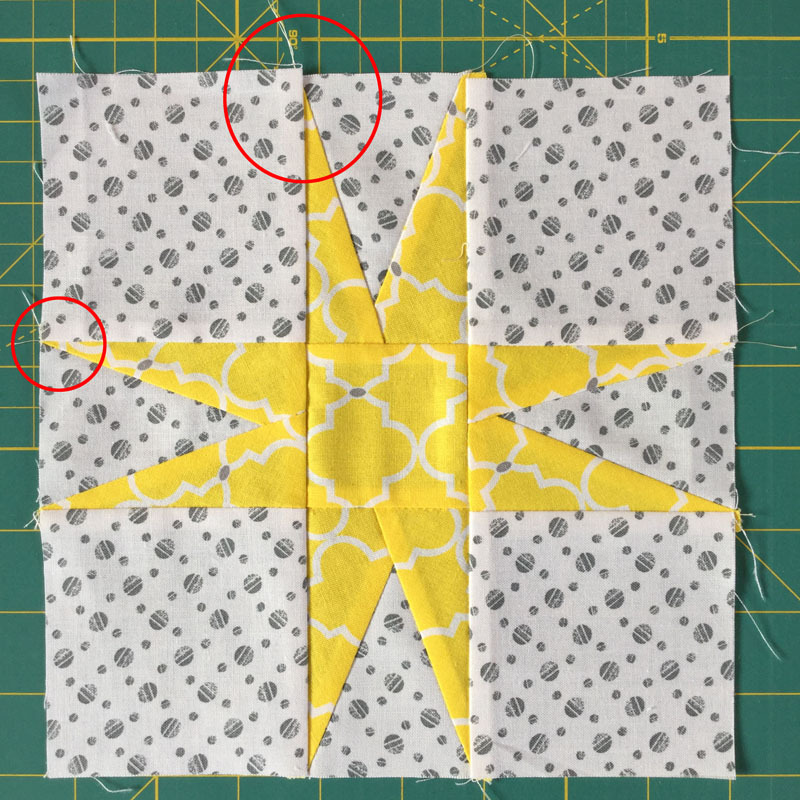 With your fabrics chosen, now it’s time to make the stars, but before you start, one issue with wonky stars is getting the star points too close to the edge.As Wendy writes: “Yellow star is what NOT to do. 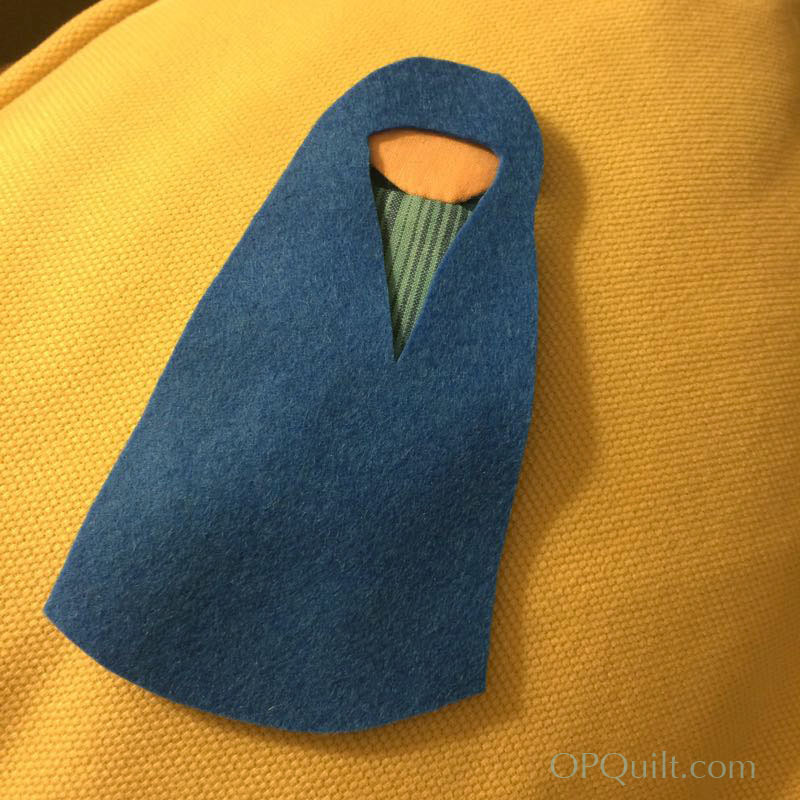 Points are at the edge and will be cut off during trimming, or lost in seam allowance. 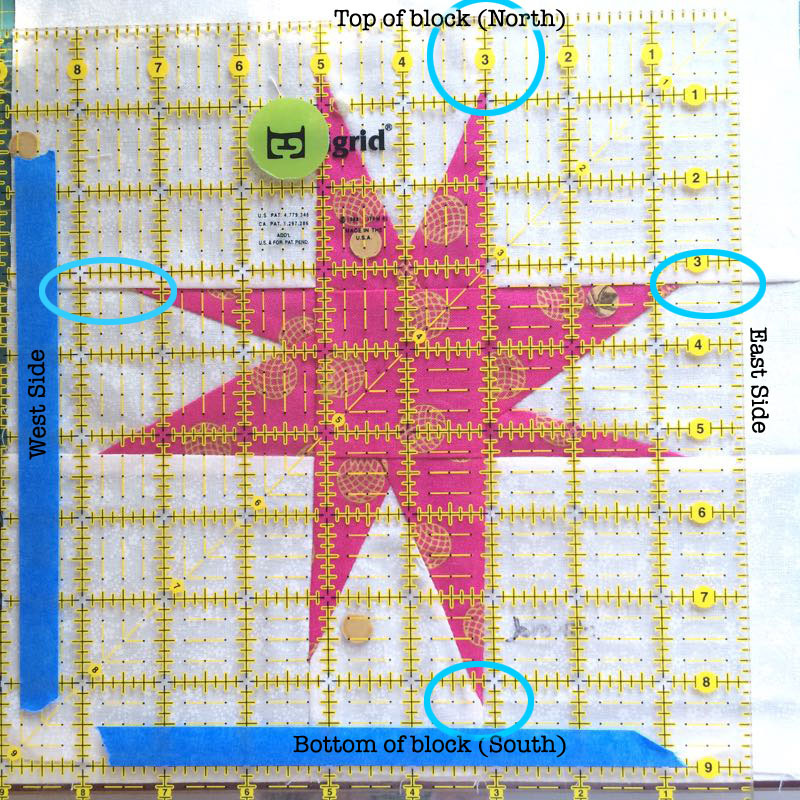 Star points need to finish further down the sides.” I’ve circled them in red, so you’ll recognize this when it happens. It happened to Wendy (that’s her block), it happened to me. Consider that your Training Wheels Block. Now one way to be aware of this is to cut all your blocks a bit larger than they ask for, and to slice the diagonal a bit differently as well. And here’s your roadmap/key to the letters. I put the “f” in lowercase and italicized it, as everything was getting a bit overwhelming with that alphabet floating around. You’ll notice on the chart I mention to cut the f-triangles “skewed.” Cut them like the above shows, so there is a chunky bit on one end. 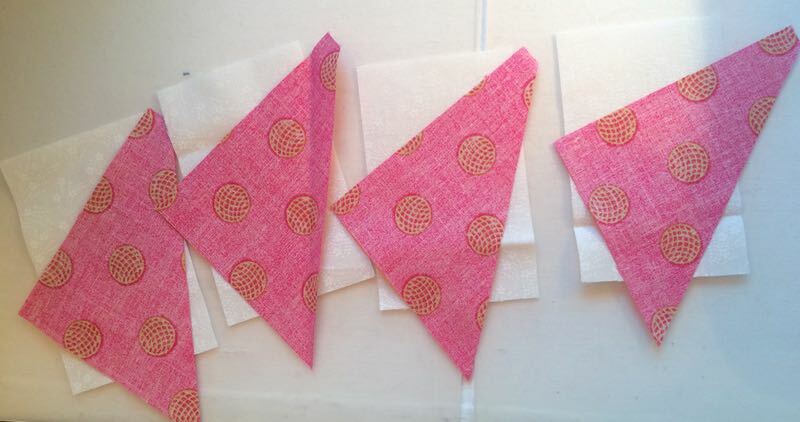 If you haven’t made wonky stars before, you can try it first by cutting it on a strict diagonal, and after some construction, see which one you like. I like this way because I feel like it gives me a good angle and I’m less inclined to get the star points too close to the edge. Find the narrower center piece, “E” and lay them out. Layer four f-triangles on top, with the chunky top down from the top edge, as shown. 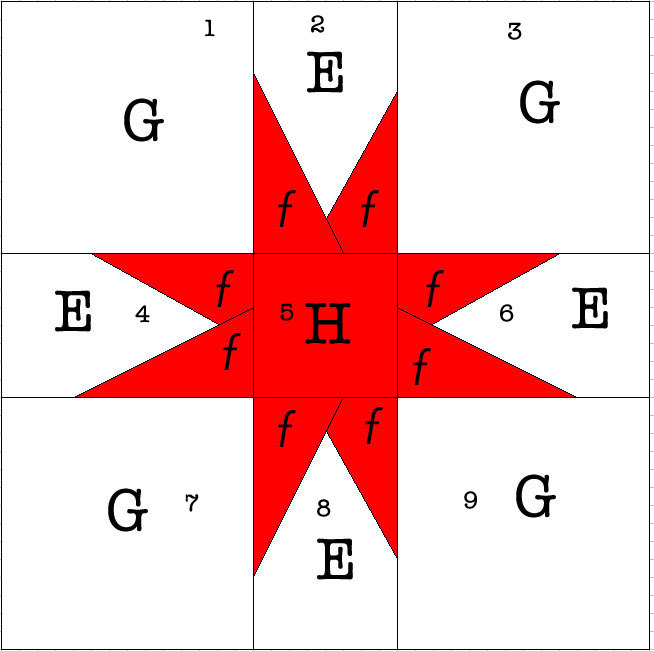 Try to have the lower pointy edge near the middle of the lower bottom edge of the E piece. I often finger-crease a little mark in that bottom edge of the E-rectangle so I know what I’m aiming for. See the next photo. On this piece, I’ve got a pretty good start. What counts is the seam line. So at the top right, it’s down about 1″ to 1-1/2″ and the seamline is about midline, or just a bit to the side of it. As long as you are in the ballpark of the red X at the bottom, you’re fine. Now line up the next set. Yes, they are all upside down, as that’s how I’m going to sew them. Again, the chunky tip is near the top edge, and the pointy edge overlaps the first wonky start point. 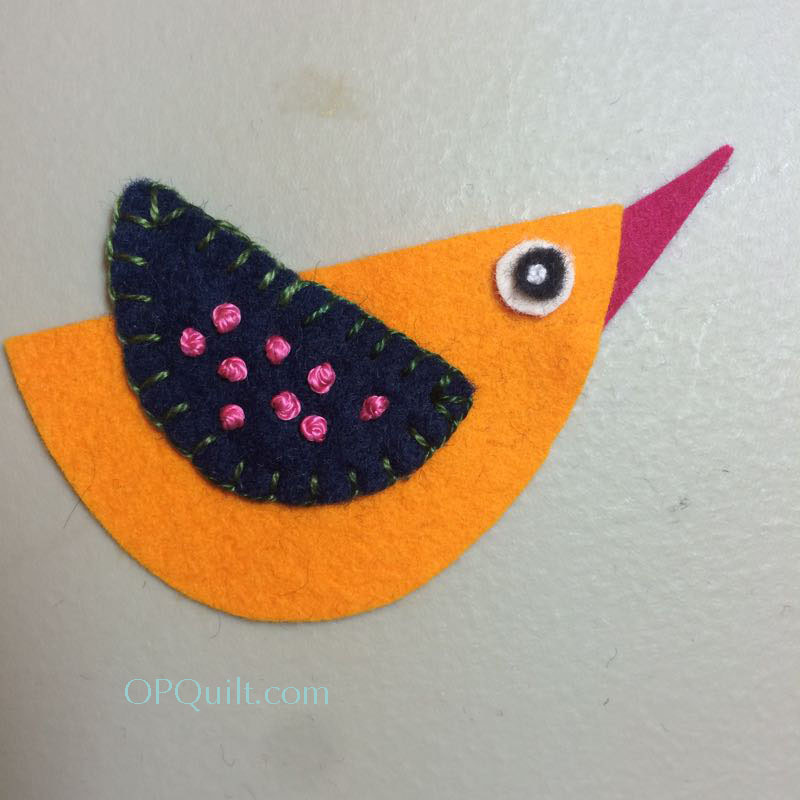 Stitch, press and turn. 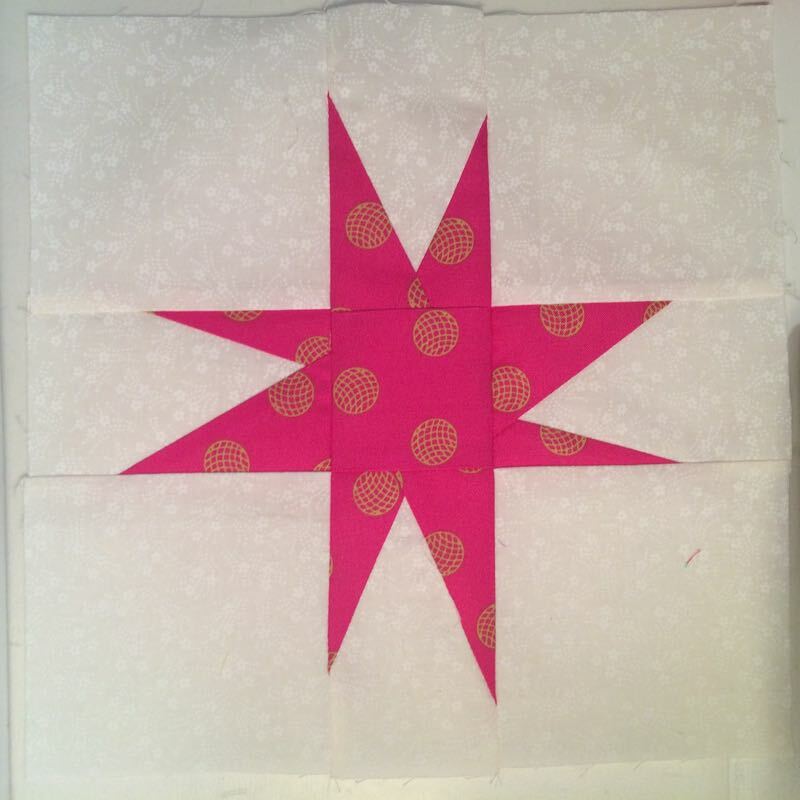 If you are worried, check it before you stitch it by folding it back to make sure your star point fabric covers the background E piece all the way on those two lower corners. 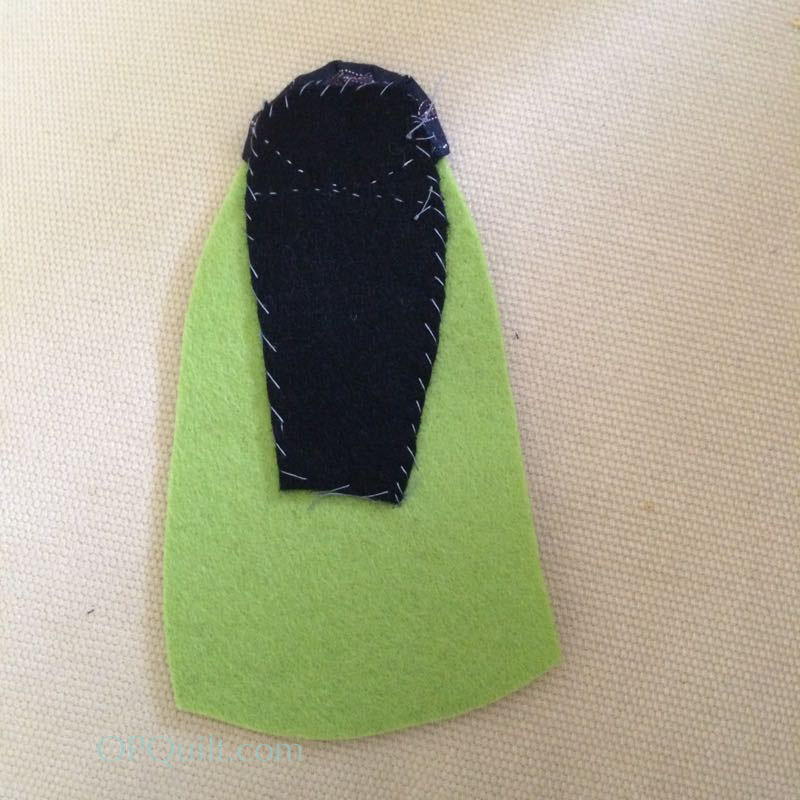 Now trim it up to 2 -1/2″ by 4.” In the photo above, I laid my ruler on the outline of the E piece for placement. Now trim off that underneath piece. Done with one! Repeat three more times for one star block. Don’t try to get all the points the same–let them be different lengths and placement, as your block will be more interesting. DO make sure you are not too close to the outer edge–you’ll need that extra space for trimming. Now line them up as shown, with the H-piece in the center and the four corner G-pieces in their place. 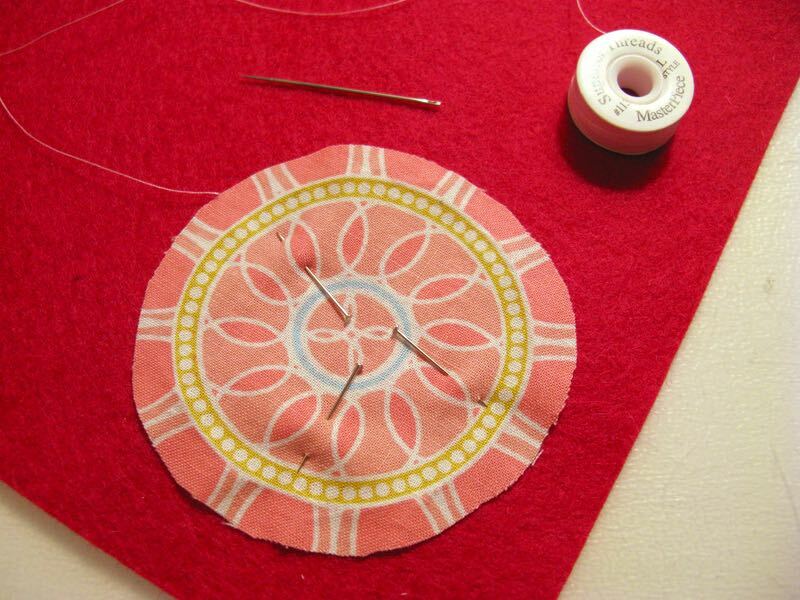 Now you are going to make a “web” of thread, as you sew the pieces into rows. Keep reading. Unit #3: I stitched G-7 to E-8. Stitch Unit #3 to G-9. If you can get the hang of this, you can keep all your star points together and really crank through them. Here, I’ve circled the bit of connecting “web” threads. Press as shown: the center row has the seams pressed to the center, and the top/bottom rows have the seams pressed towards the G-piece (outer corner block). 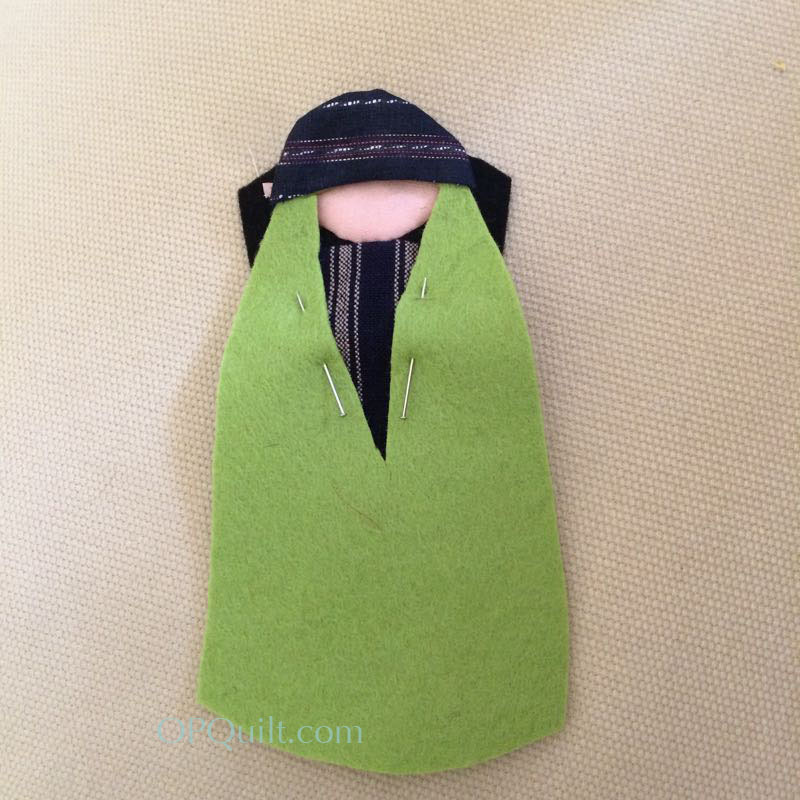 I’ve sewn them, pressed them, and now I can stack them, ready to sew the rows together. 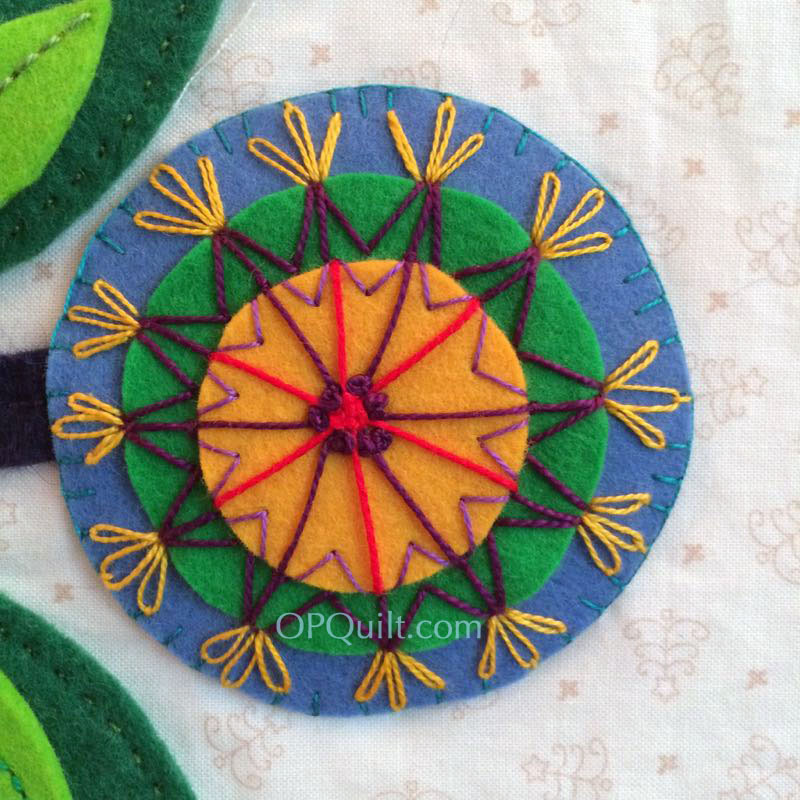 Because of the thread-web, I won’t get a piece turned around, or upside down. There’s no magic, just press them how you like them, but I do always believe a seam will generally indicate which is the easiest way for it to fall. In this case, it was away from the center. Arrange your stars around the tree how you think you’ll like them. Take a photo, re-arrange if you want. In my case, I ended up making some brighter, bolder stars, and shuffling several times. It also helps if you go get some lunch, or fold a batch of laundry, or maybe snack on some chocolate. Anything to take a break so you can bring some fresh eyes to the process. Do this until you are happy with how they look. Now for some measuring fun. You know that each corner of this quilt will have a star. And generally, the finished measurement is 8″, or trimmed to 8-1/2.” Both Wendy and I caution that you need to make VERY SURE that your H-block is centered in your trimming. Pay attention to the diagonal line and make sure it’s running through the center of the H-piece. Trim FOUR blocks only, and set aside. What you see above is me making sure that the middle row of my stars would line up when they were placed next to each other. I took my time trimming. If you don’t have the middle of the star lined up, you can fudge it a bit, but not by much. 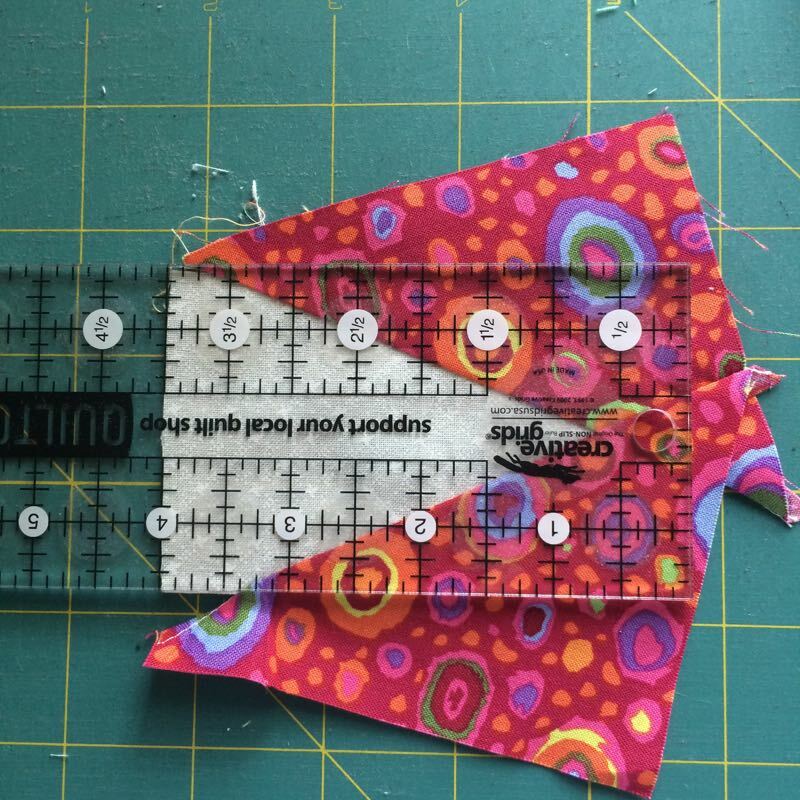 Take a measurement across the top of Border #1 (triangle-border). 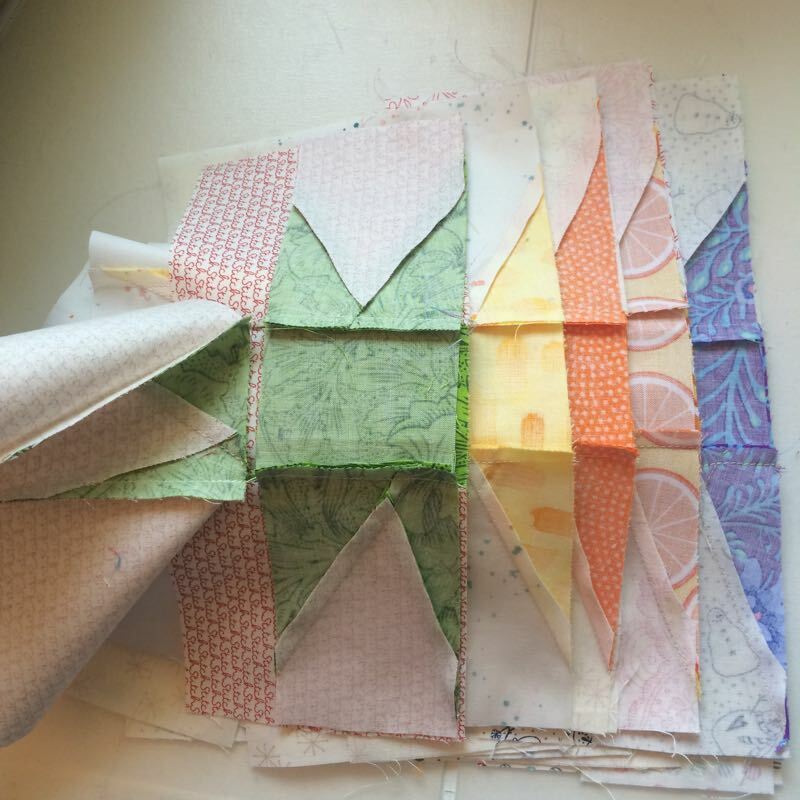 Mine was just over 39.” I called it close enough to 40″ as that would fit five star blocks nicely (8″ blocks x 5= 40″); I can also sew a seam or two with a bit bigger seam allowance to get it closer to my measurement (yes, there are all sorts of ways to make our Zen Quilt behave). 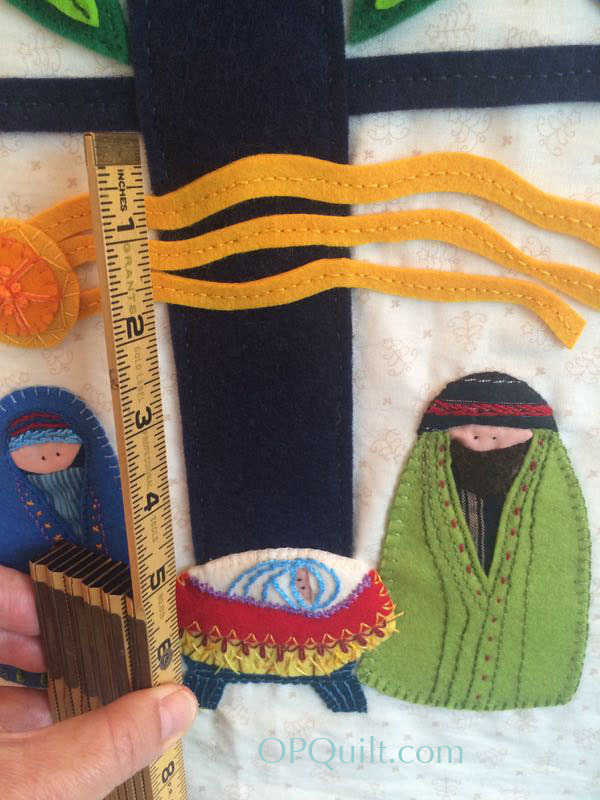 In my case, I trimmed them to 8 1/2″ so they finish at 8″ when they are sewn in. Once you get that figured it, trim up TEN blocks. 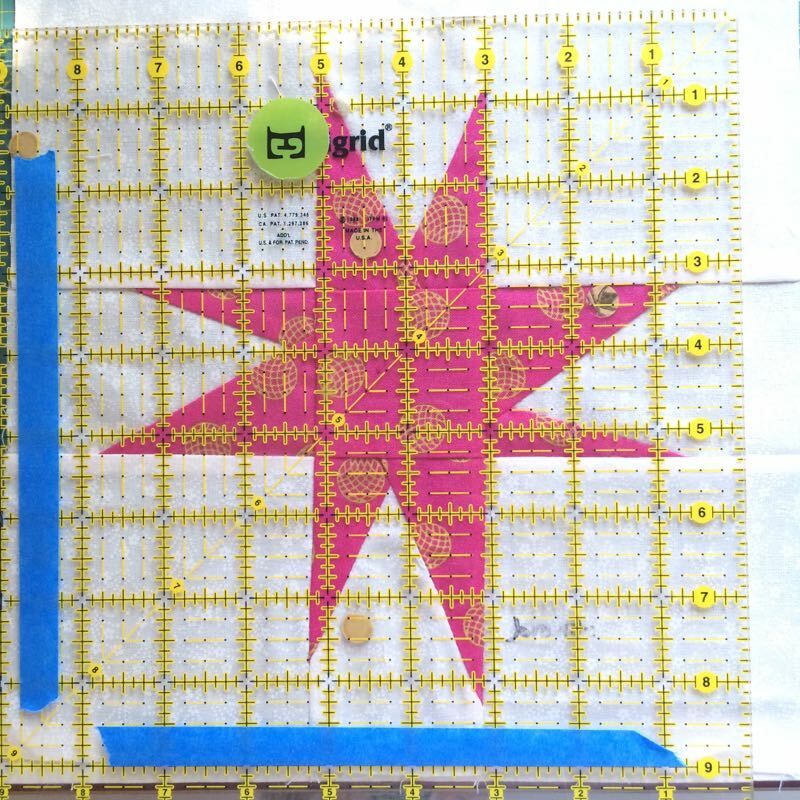 Use the trimming trick above to make sure the star blocks will line up. See how that trimmed edge is away from those star points? 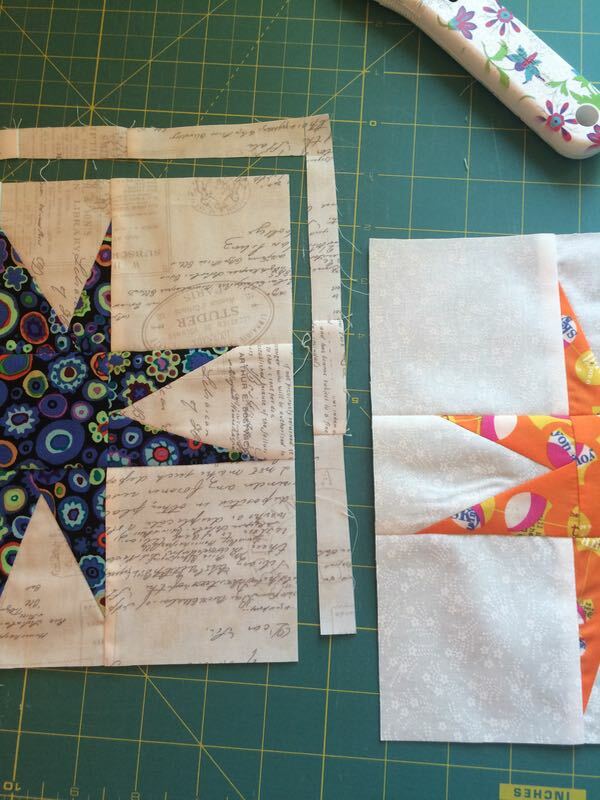 (And yes, I’ve re-done a couple of blocks in my lifetime of wonky star blocks when I trimmed them off.) 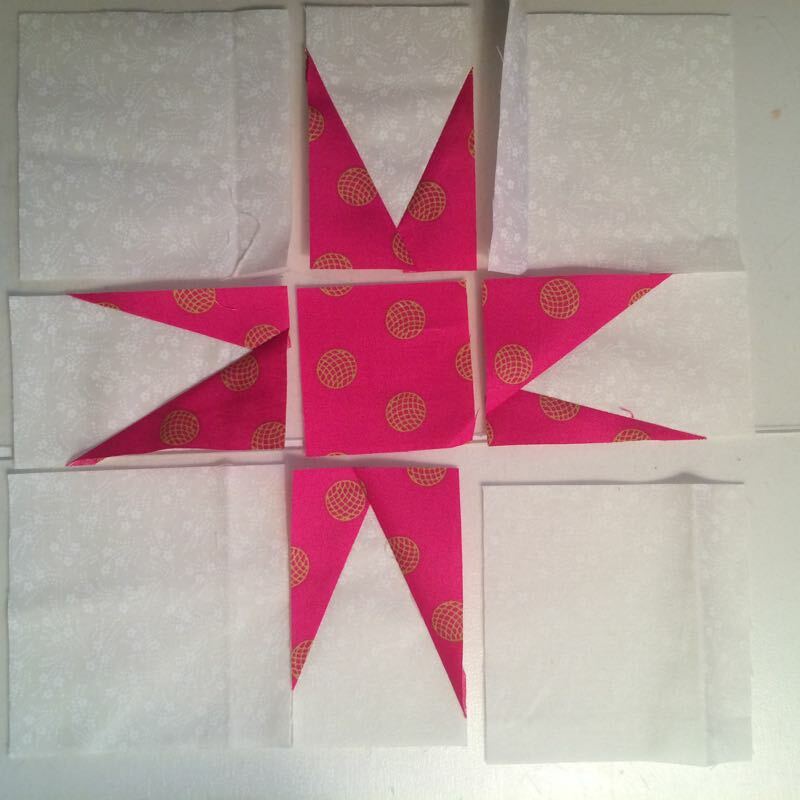 Sew the FIVE top star blocks together in a row. DO NOT SEW THE CORNER BLOCKS ON YET. 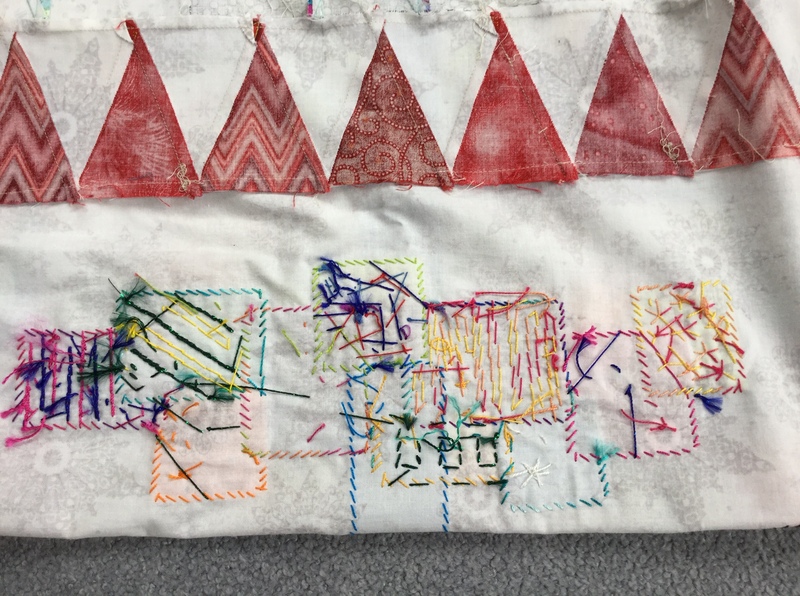 Press the seams to one side, and stitch that row of Border #2 (wonky star) on to your Border #1 (red triangles). Repeat with the bottom row of star blocks. 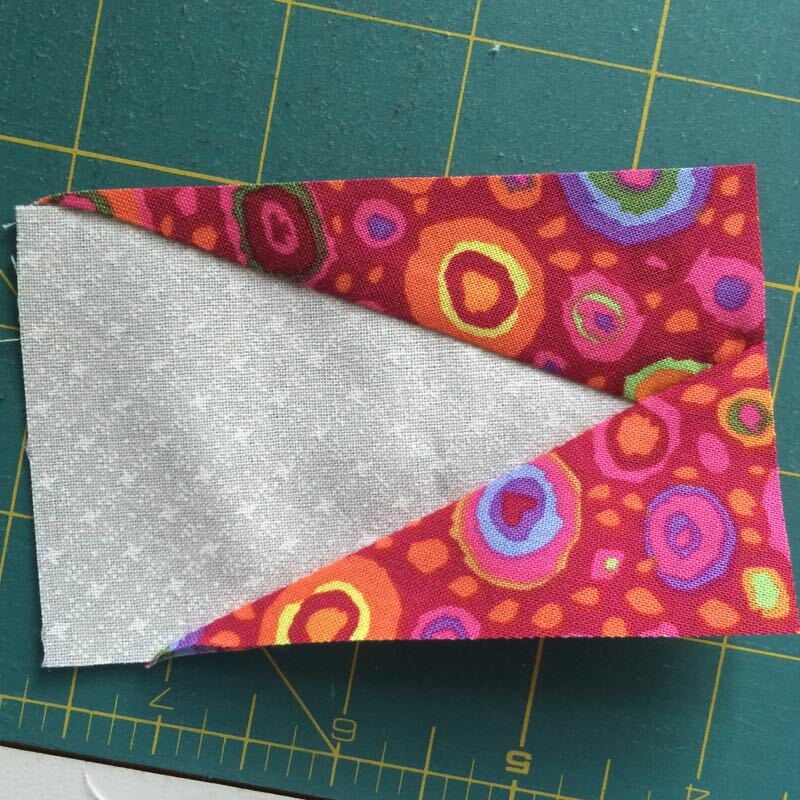 Press seam toward the red triangles border. 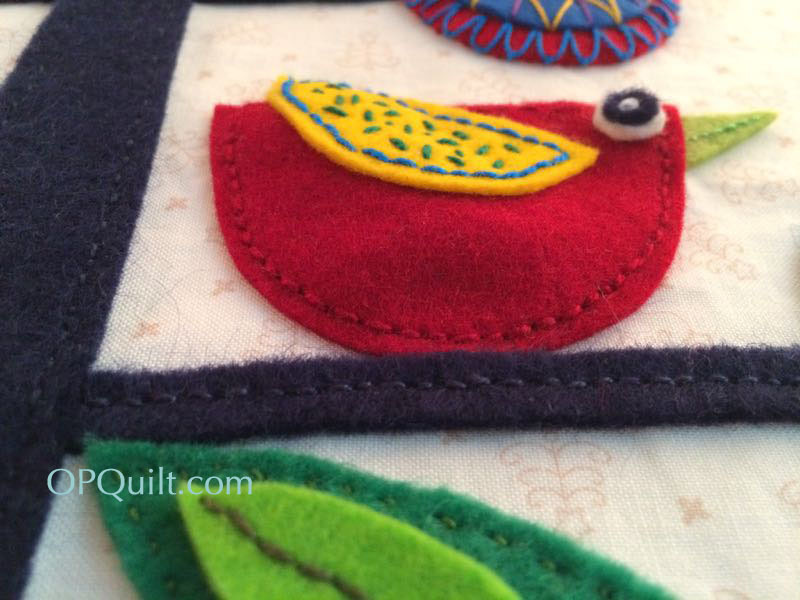 Your quilt should now look like this. 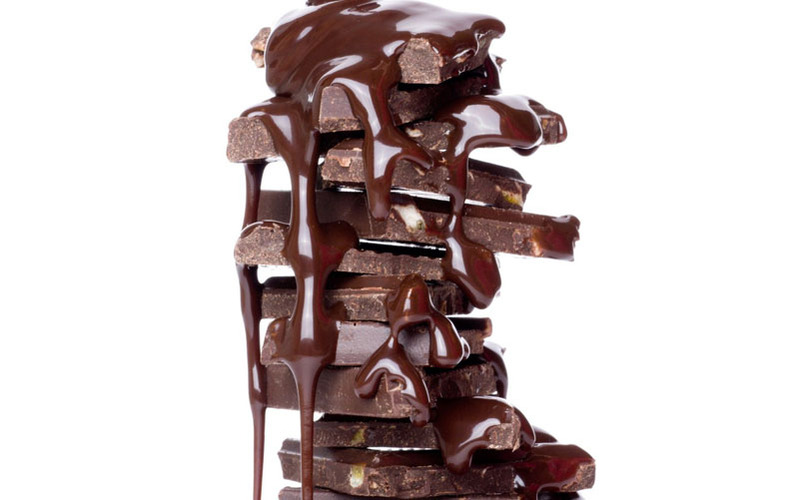 Before you start on the sides, get more chocolate. Here comes the part where Wendy says it is kind of like childbirth: you’ll forget about it once it’s over with. I measured the side border, counted up how many blocks were shown in the pattern, and divided that into the border measurement. 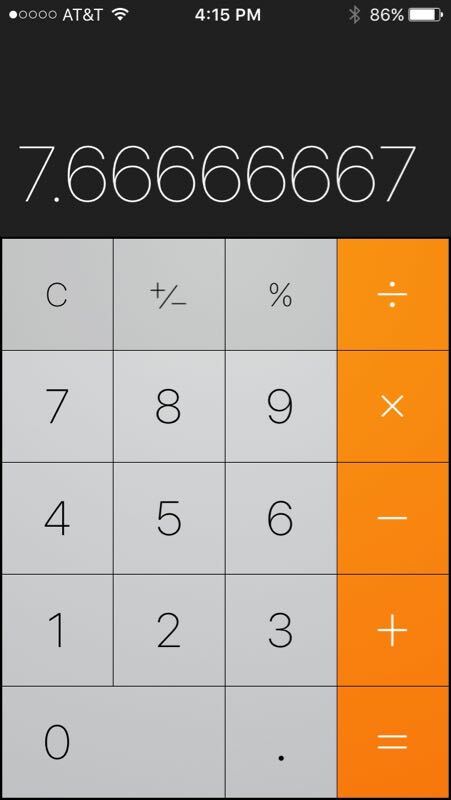 That was a scary number, so I subtracted one block, and did the dividing again. 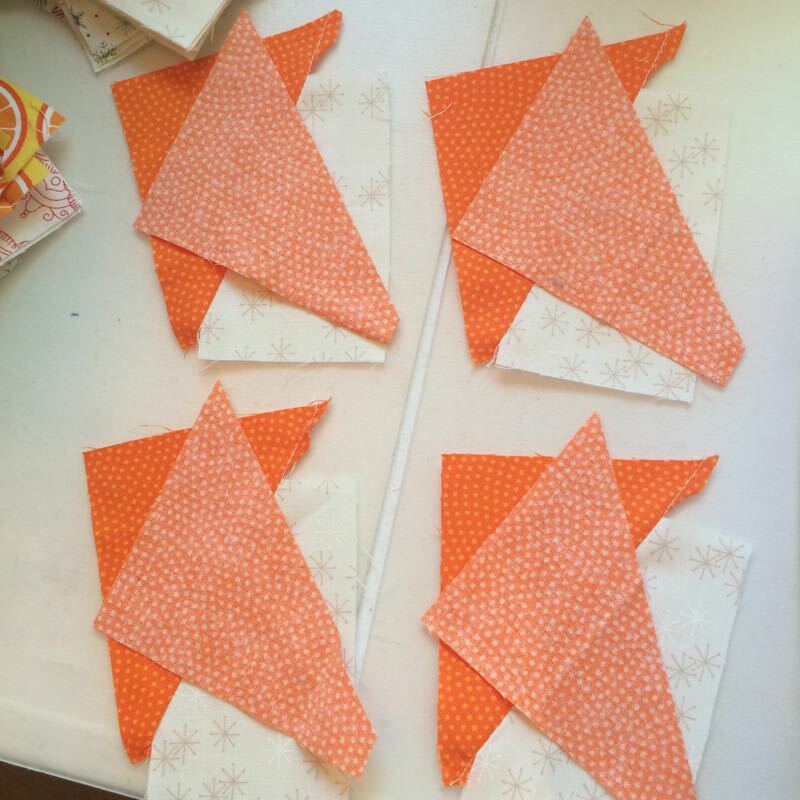 I ended up needing SIX blocks of just about 7 3/4.” This is the same as the pattern. Because the measurements were kind of weird, I decided to cheat. I just wanted to make sure that I had at least 3/8″ to 1/2″ away from the pointy edges (blue ovals). Most of the time I succeeded. Trim up your blocks. Now rotate them so the 7-3/4″ finished dimension is running north-south, and the 8″ finished dimension is running East-West. (This is an update from the original post.) Then sew them together. Press and hold them up against the border. Chances are they won’t fit–they’ll be too big. So. . . cheat again. 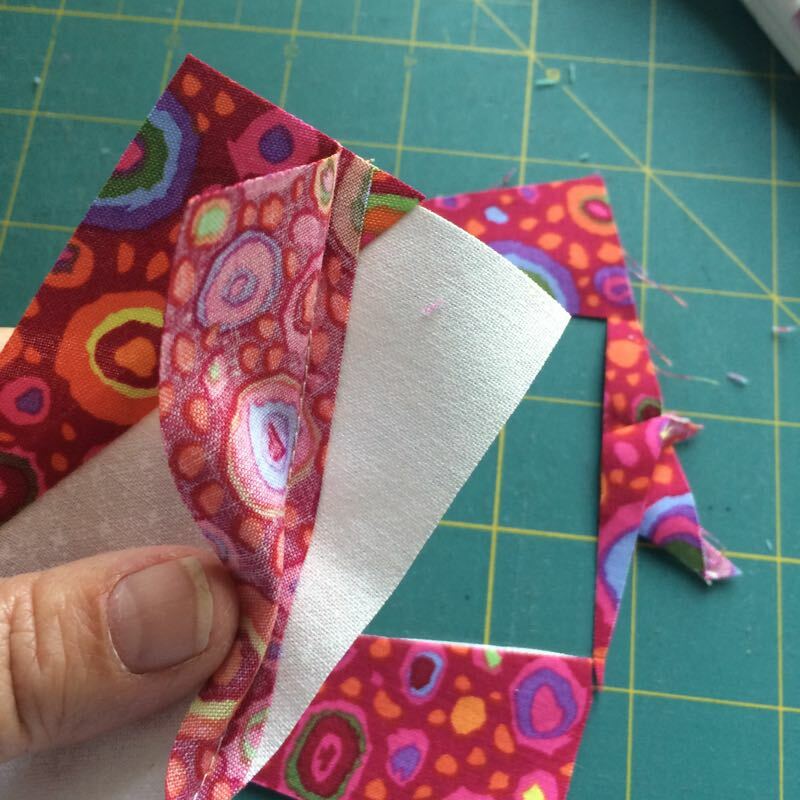 Take a bit bigger seams between all the blocks: from 1/4″ inch to 5/16ths of an inch. Check your sewn row again. 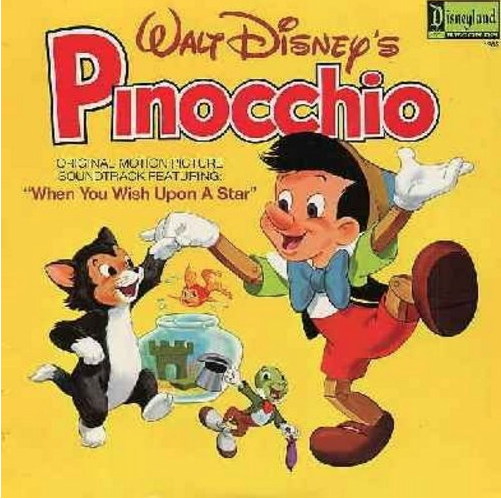 If they are still too large (and can’t be eased in), choose the two stars that have the most room between the tips of their star points and the seam, and make another teeny bit bigger seam. Now you should be fine. 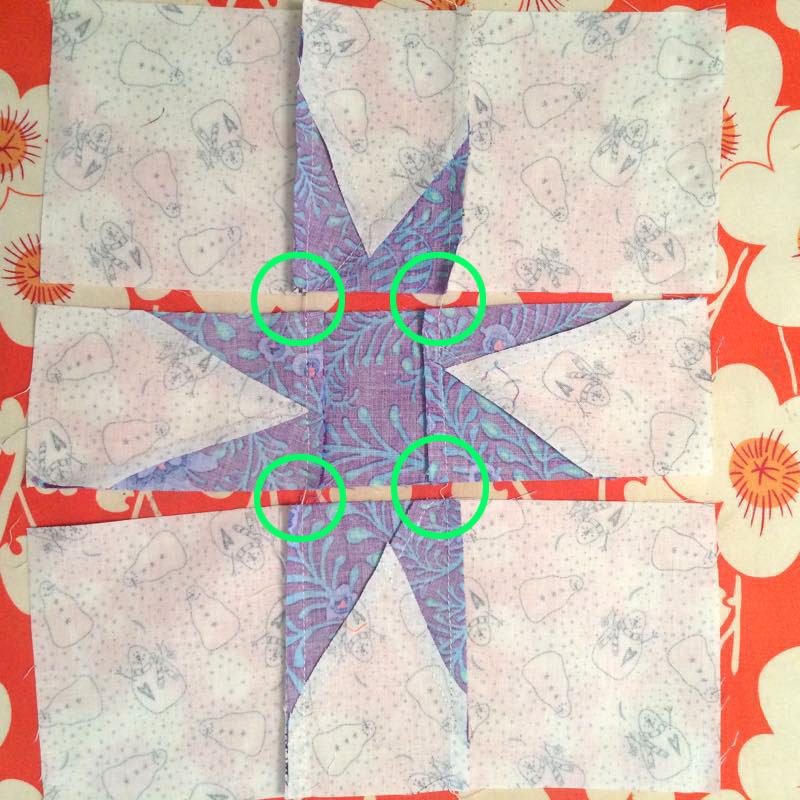 NOW sew the star corner blocks to each side border strip–two to each side strip of stars–one on the top and one on the bottom. 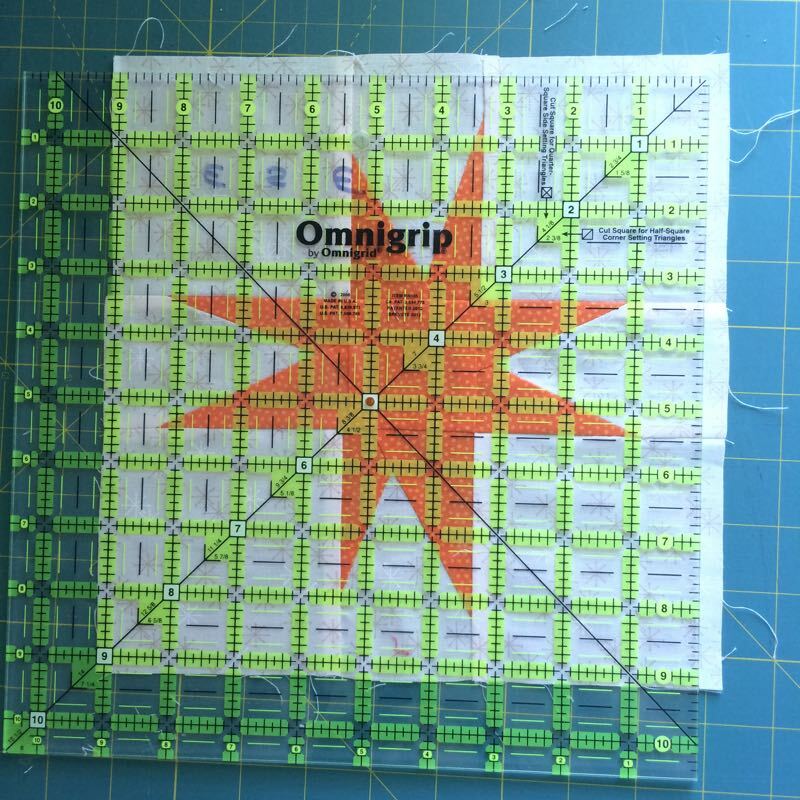 Press all seams on the strip towards one side. 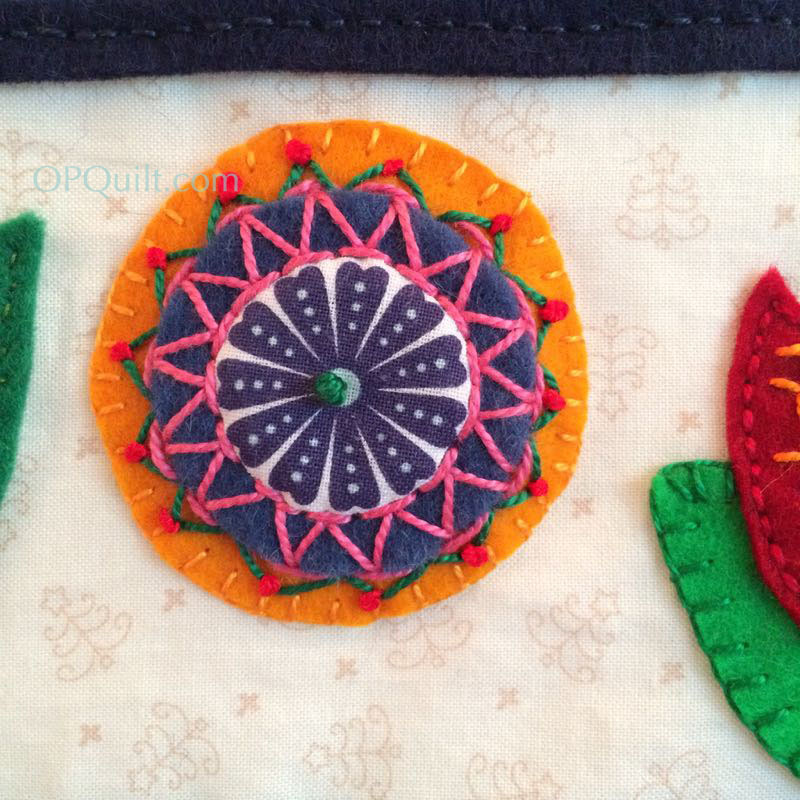 Stitch these borders to the existing quilt. 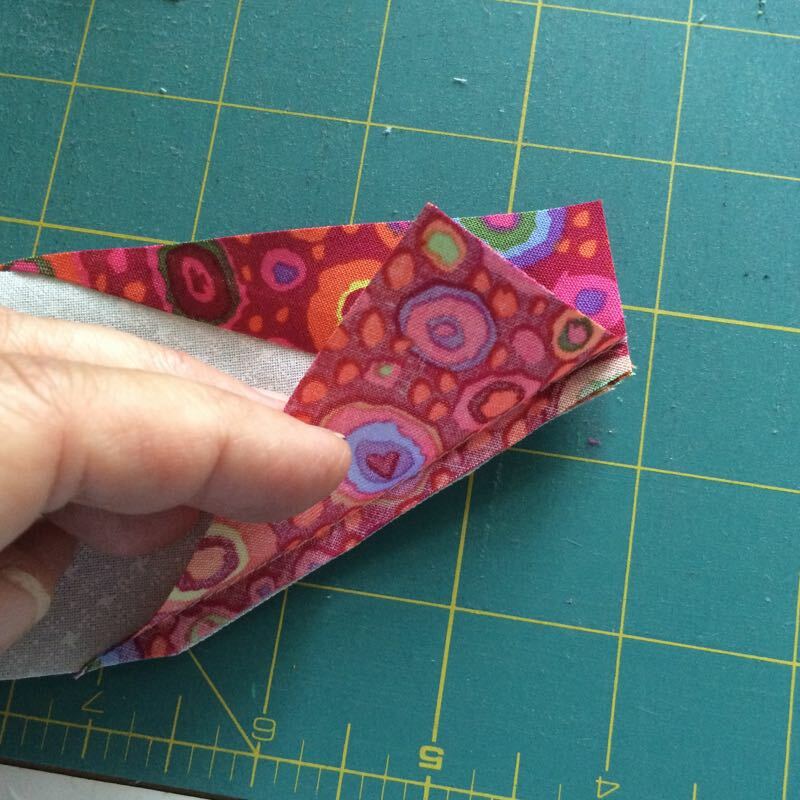 I then pressed all seams toward that red triangle seam, even if it didn’t want to go there. Now, in looking at it, can you tell that the side blocks are sized a tiny bit differently than the top/bottom blocks? Didn’t think so, and no one else will be able to tell either. I think the solution to the challenging measurements was a success. 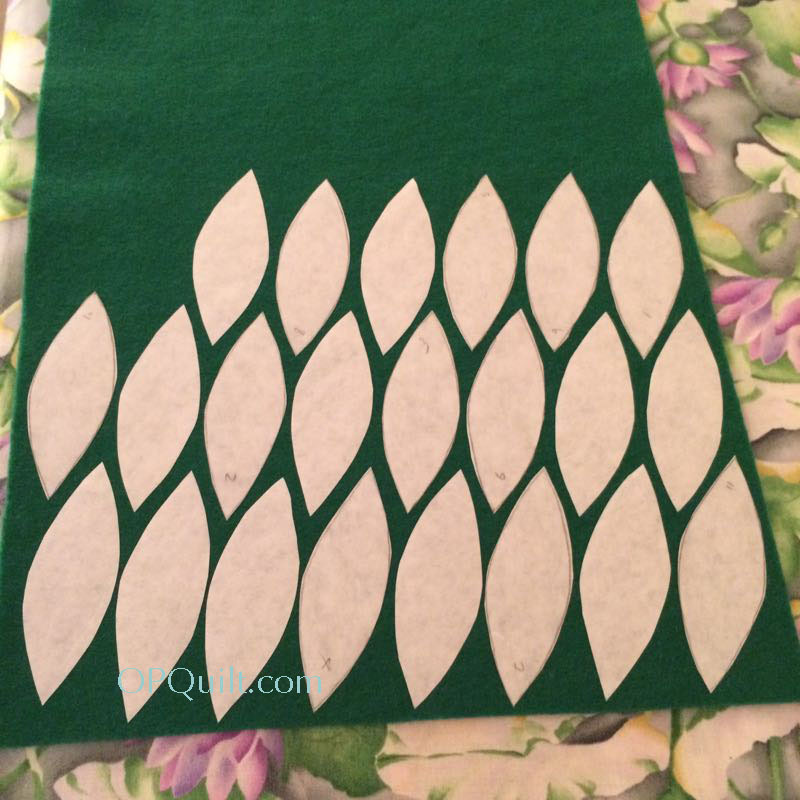 As Gwen Marston said, “Nobody ever said, ‘I need a little more stress in my life–think I’ll make a quilt.’ ” Quilting should be fun, even if it’s challenging (and this was definitely a challenging quilt). Now let’s see yours. 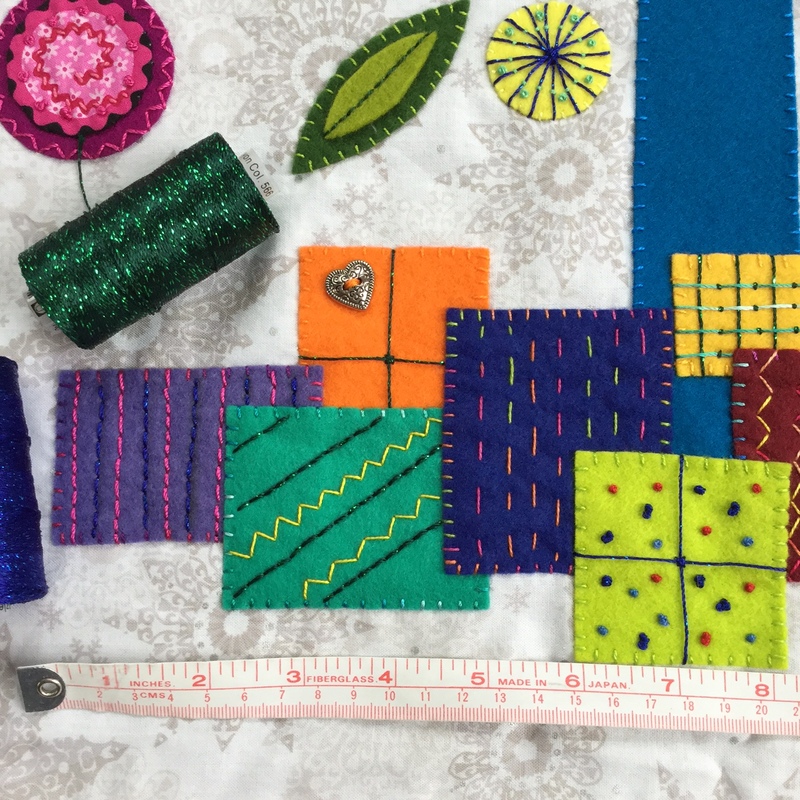 Shoot me an email when you get yours done, with a photo of your quilt, and if (I mean, when–I’m thinking positively) I get a few, I’ll put up a post showing off your hard work. 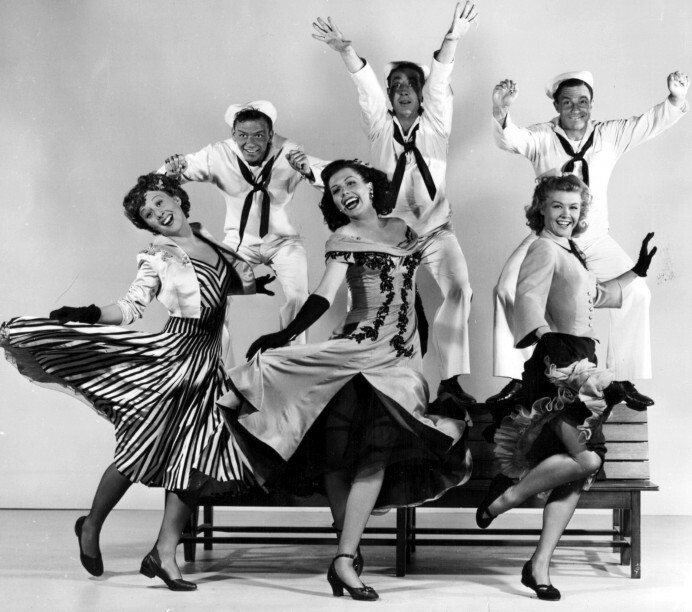 Try not to dance, but you are done! It’s over! You made your quilt!! 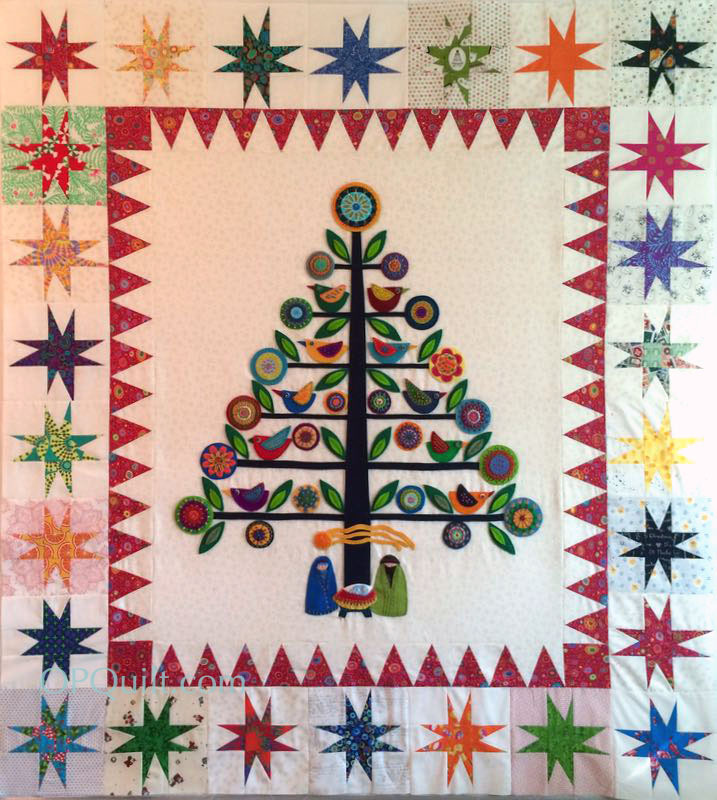 Thanks for joining us on this journey, from January to July, of making the Oh Christmas Tree quilt. I’ve appreciated all your enthusiasm, your comments, and seeing photos on Instagram. 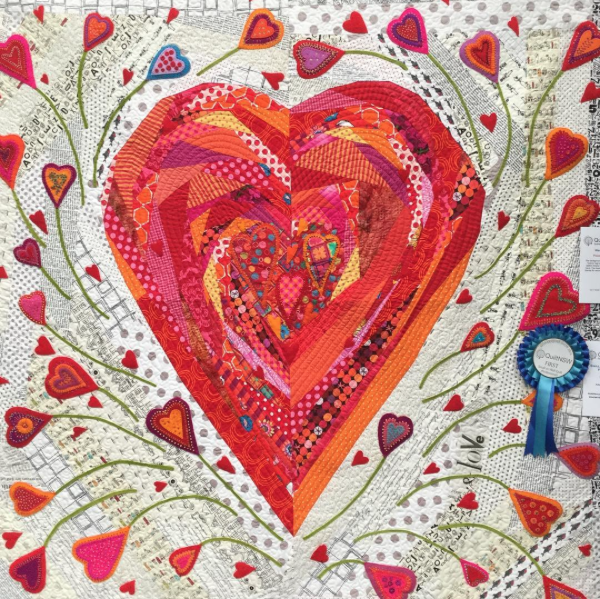 Another one of hers is Pieces O My Heart, which just won a blue ribbon at the Sydney Quilt Show. Visit her Instagram feed for more inspiration. 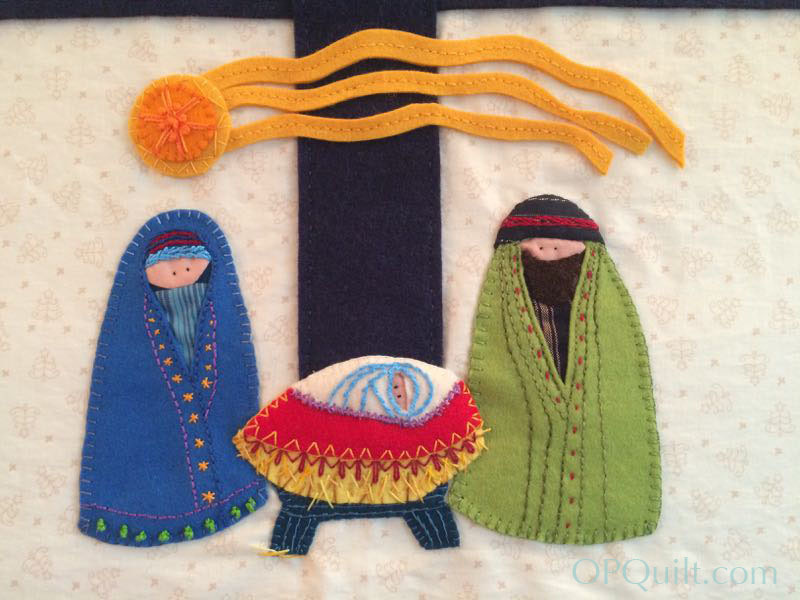 Lastly, if you are not a follower of my blog and you’ve enjoyed this quilt-a-long, I’d like to invite you to become an email follower. Just enter your email in the box above. I generally post about twice a week, with occasional longer gaps. 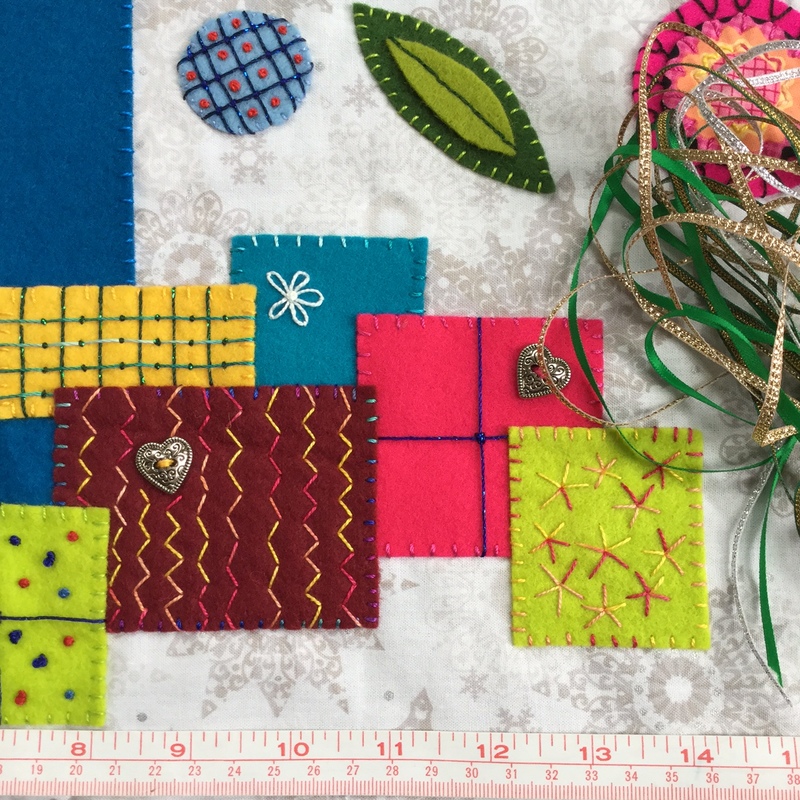 I try to post worthy and interesting content with an occasional “friends and me doing quilty stuff.” I think by building communities and sharing discussions about issues and happenings in our world, we shorten the distance between us, forming strong links of like-minded quilters. 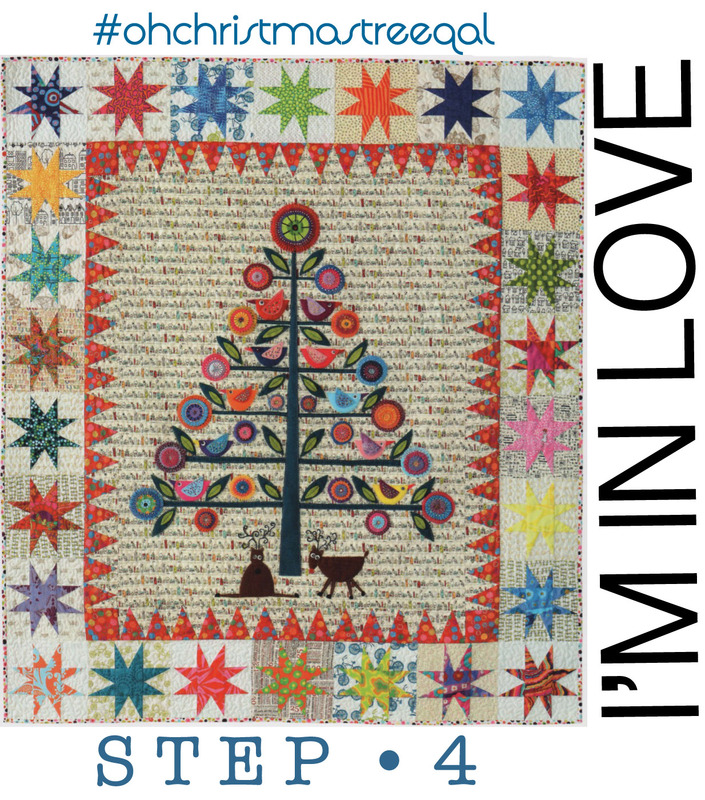 Posted on May 2, 2016 by Elizabeth E.
Today is Step 4 of our Oh Christmas Tree Quilt-a-Long (#ohchristmastreeqal), following a pattern by Wendy of FlyingFishKits and which was published in Simply Moderne issue #3, by QuiltMania. 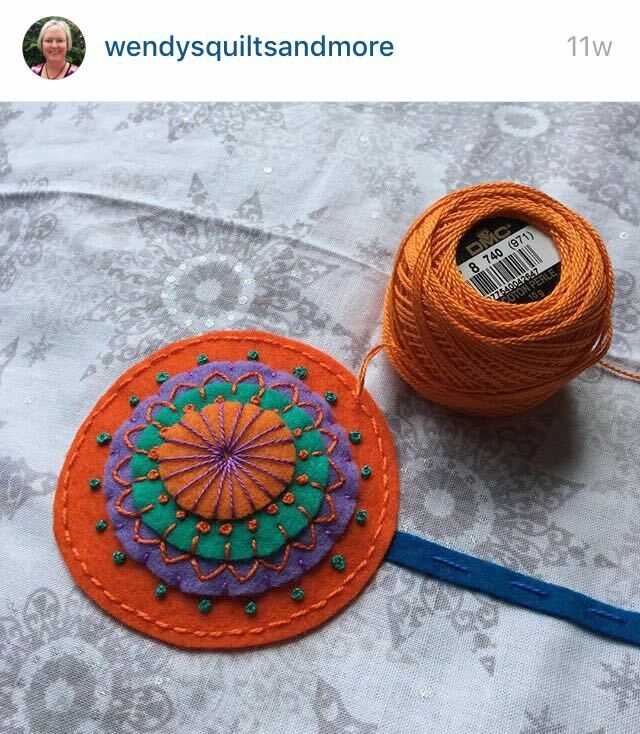 As always, we have an assist from Wendy of Wendy’s Quilts and More (blog) and wendyquiltsandmore (IG), as she is slightly ahead of us in her creating. 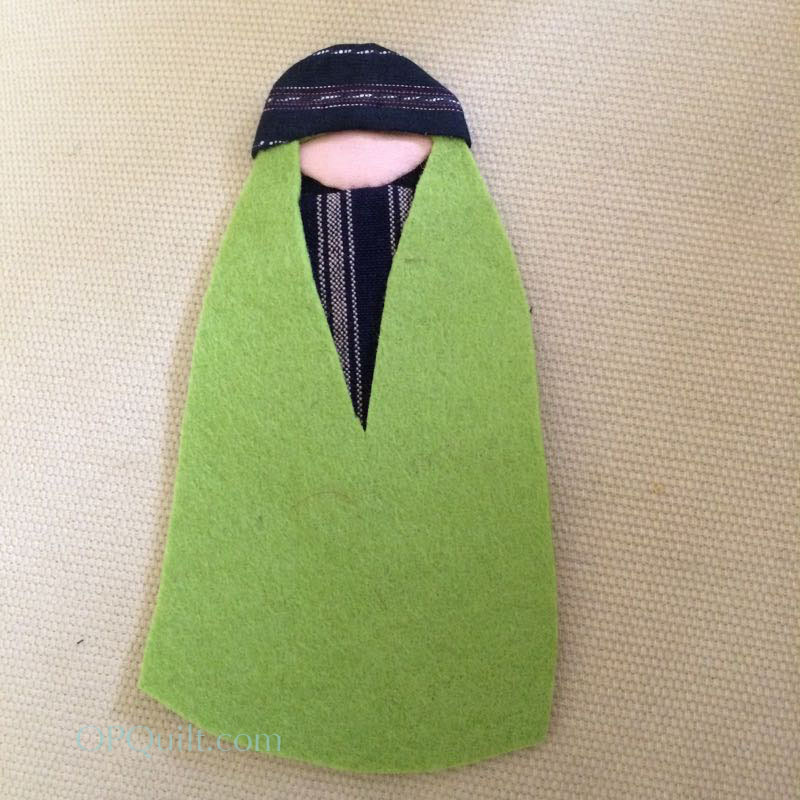 Here’s the twist: instead of creating the under-the-tree scene this month, I’ve gotten so many queries about sewing these things on to the background and the tree, that I think we’ll head that direction instead. Go with the flow, right? 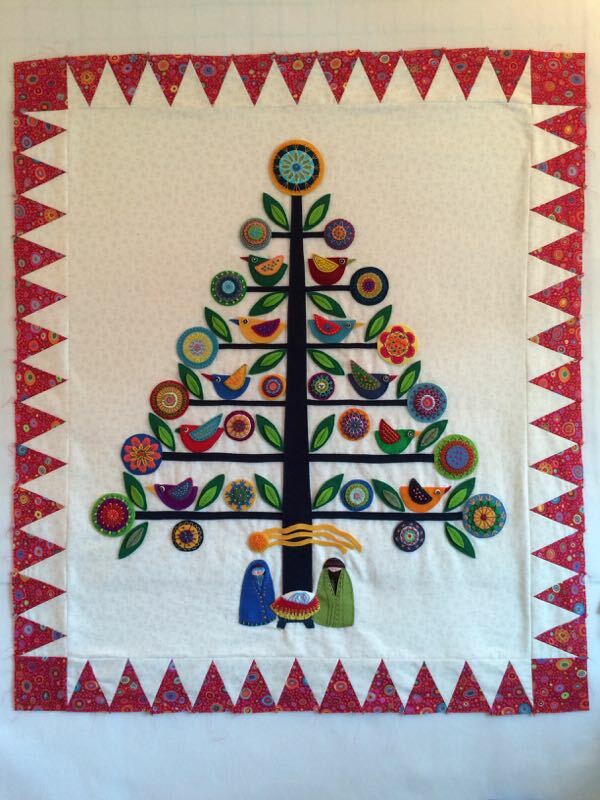 Above is my tree, everything sewn on. I’m heading this direction because a lot of those questions have to deal with the idea of how much embroidery to put on that outer edge? 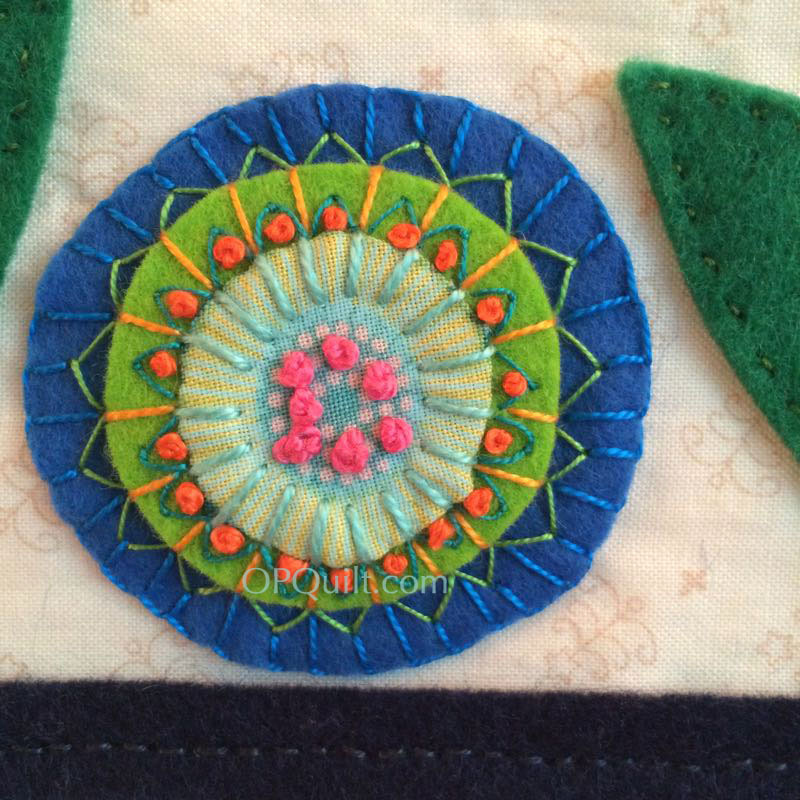 Should you leave a space for attaching and more embroidery? Should you go right to the edge? She writes: “I thought I had too much white space in certain areas. I’ve added 4 more small leaves and 4 more small circles, keeping the additions symmetrical because the gaps were symmetrical. I just felt some areas were less densely filled than others and I didn’t want gaps in the middle of my tree. 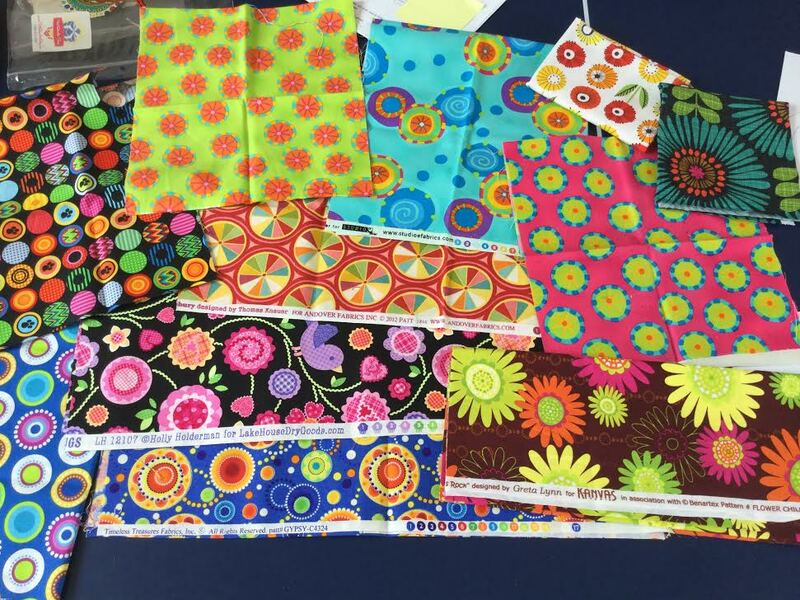 That’s probably because I didn’t exactly follow the pattern for the size of my leaves and flowers, but also because things move slightly as you sew them on.” She sent me two photos. The “before” is above. This is the after. You can see extra circles and extra leaves. (And yes, I love her under-the-tree scene! Next month, next month.). In addition to adding these extras, she attaches them differently than I do. First she lays them all out, takes a photo so she can remember where they are, and then takes all off but the items closest to the tree trunk. She sews those down first then adds in the decorations bit by bit, moving from the center to the outside, because she said she got tired of being stuck by pins. I couldn’t face the thought of re-attaching the flowers after I’d gotten them arranged, so I used appliqué pins (shorter than usual) and sewed on the decorations moving from the outside toward the center. 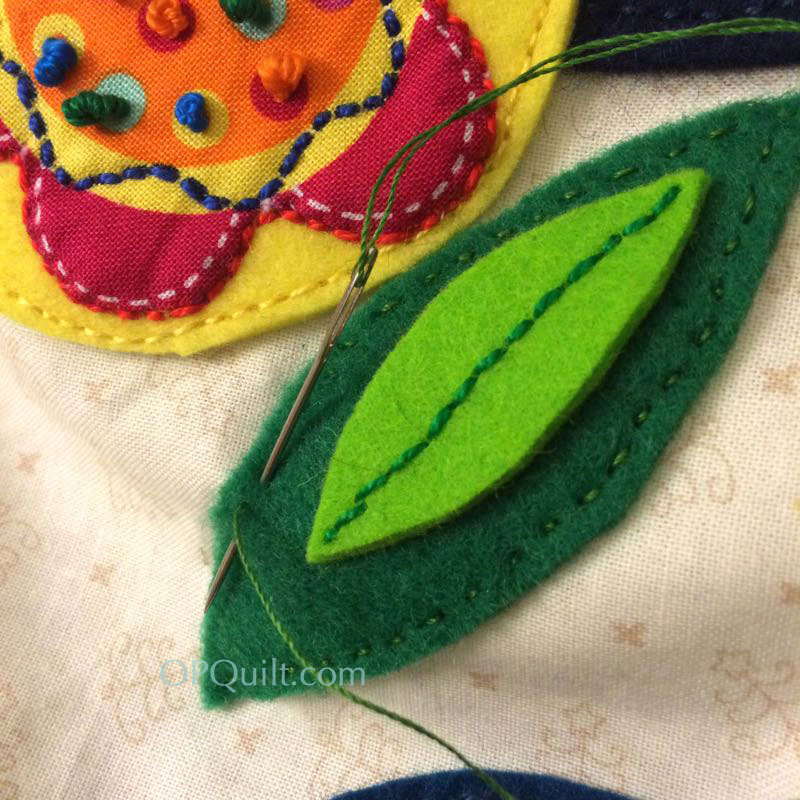 Since I use really small pins, and put my hand around the flowers and birds as I sew, I didn’t have too much trouble. 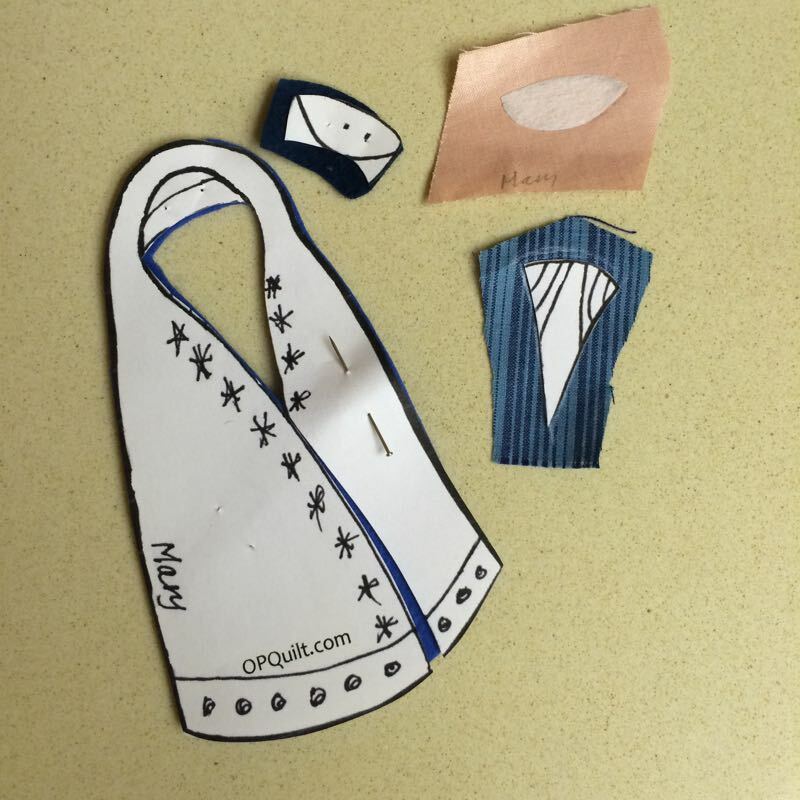 One IG reader said she used a bit of glue to secure the decorations and from her photo it looks like she’s attaching them from the inside to the outside. Again, try what works for you. You can see me scrunching things up in my hand. Since I worked from the outside in, I had very few pin pokes. 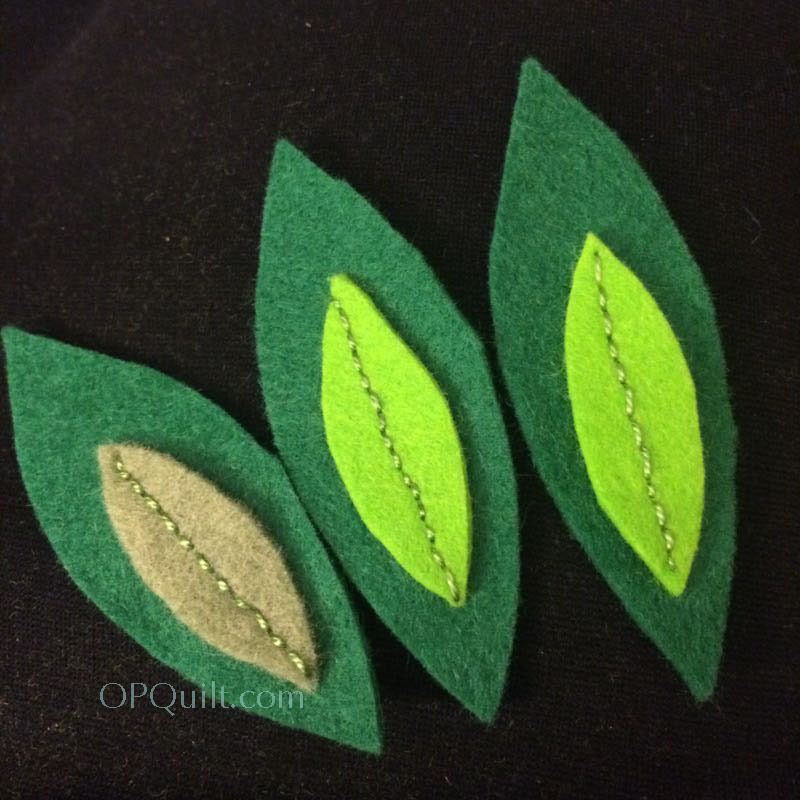 I attached the leaves by using the same stitch I used on the trunk: a separated back-stitch (refer to this post for more info). I was intent on getting them all on, and doing it quickly. 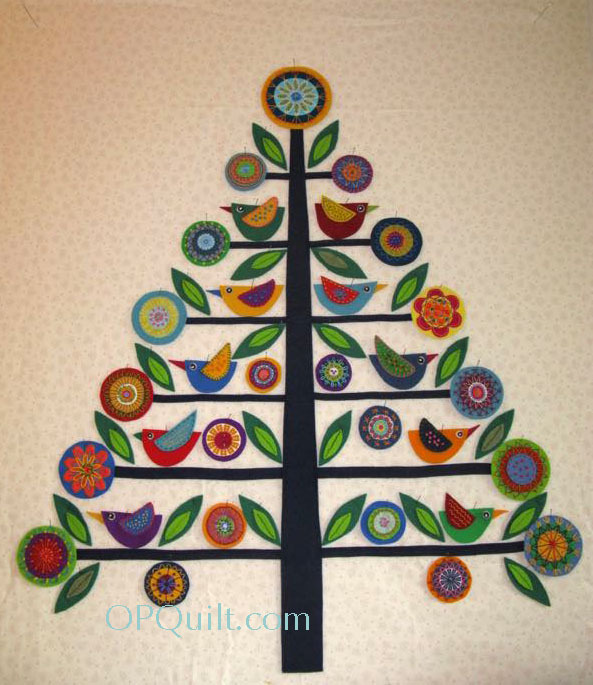 You could take more time than I, adding an extra embroidery stitch, if you wanted, for it’s YOUR tree. 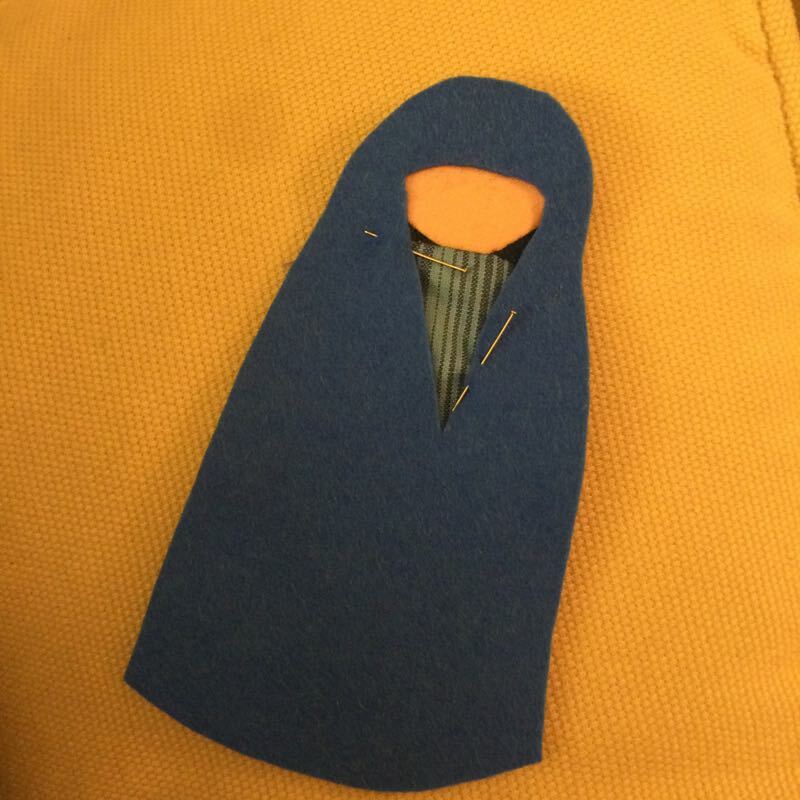 I also learned to put a regular pin right in the middle of my decorations just before I started sewing them on, so they wouldn’t buckle. I have one bird who looks like she is expecting, as the wool can shift as you are attaching, bubbling up. I’ll show the Mama Bird to you later. Now for some general tips about attaching the flowers and birds. 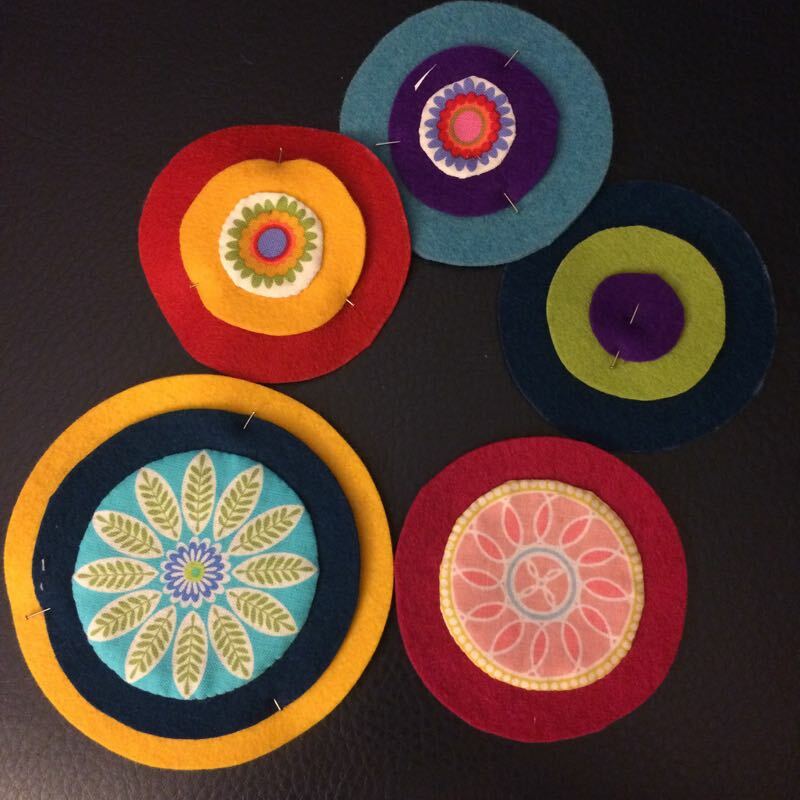 Before we talk about different ways to sew them to your tree, here’s a couple of photos of circles before attaching, showing various state of “close-to-the-edgeness” of the embroidery. After I pinned these to the tree, I went in and added another circle under the red one, giving it a bit bigger presence. Ditto on the purple circle below. 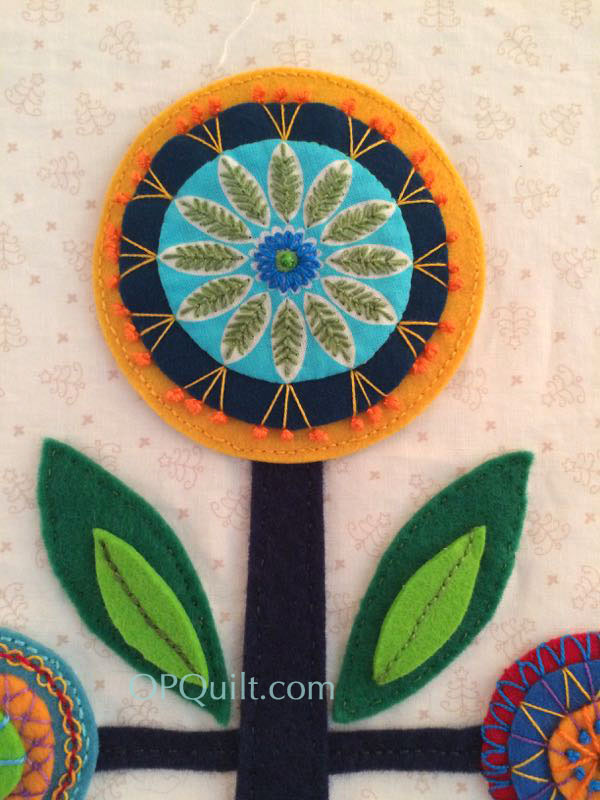 You may find yourself making small alternations after you get everything pinned down, either adding leaves and circles as Wendy did, or giving another border to a too-small/wrong-color flower, like I did. 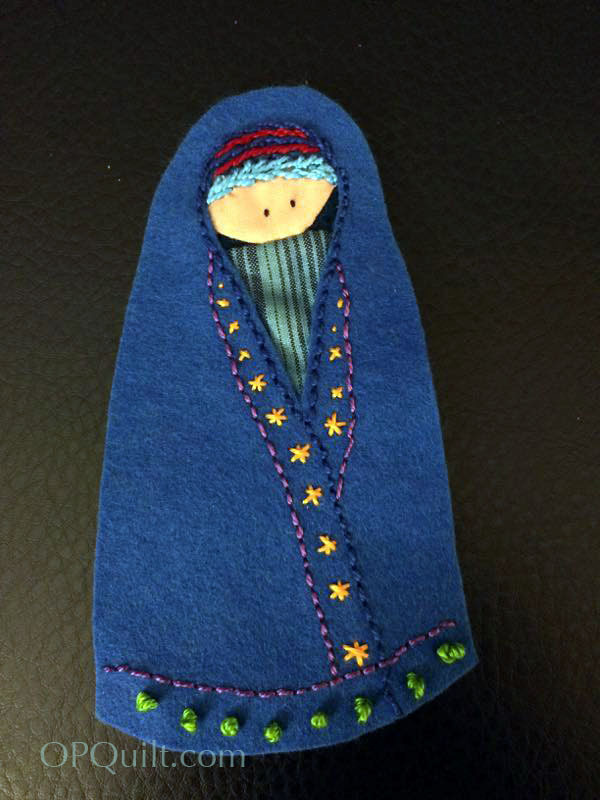 I group the way I sewed these down into two categories: A) snuggle a stitch in or around the existing embroidery, or B) adding another ring of decorative embroidery to affix it to the background. Let’s do the A-category first. 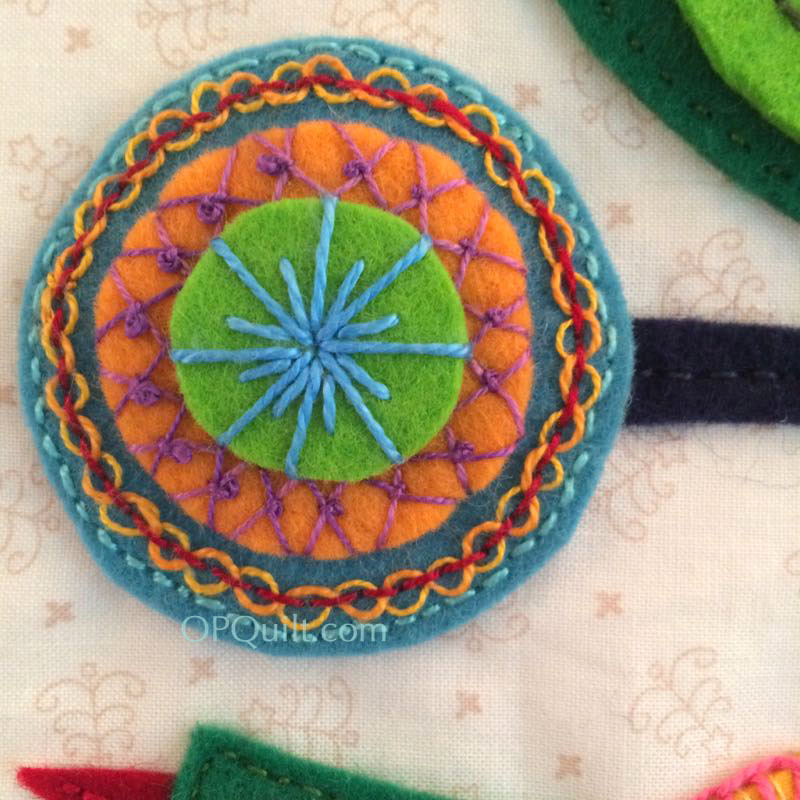 You saw the flower medallion above; I attached it with tiny stitches at right angles to the outer edge in a matching thread. 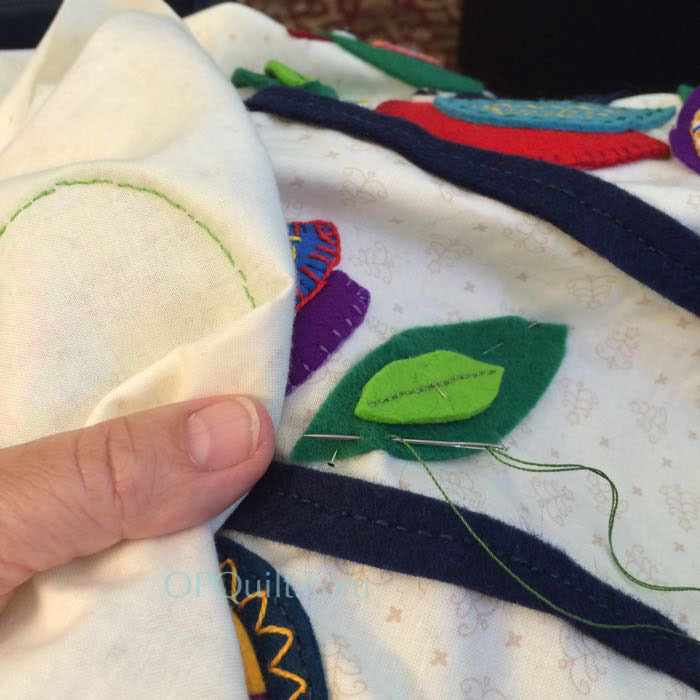 Wendy often leaves the wings undecorated, using the “attachment phase” to put the stitches on, but I’d already embroidered them when she told me this, so I sewed it down to the background by using a small matching (green) thread in between the existing decorative (pink) stitch. 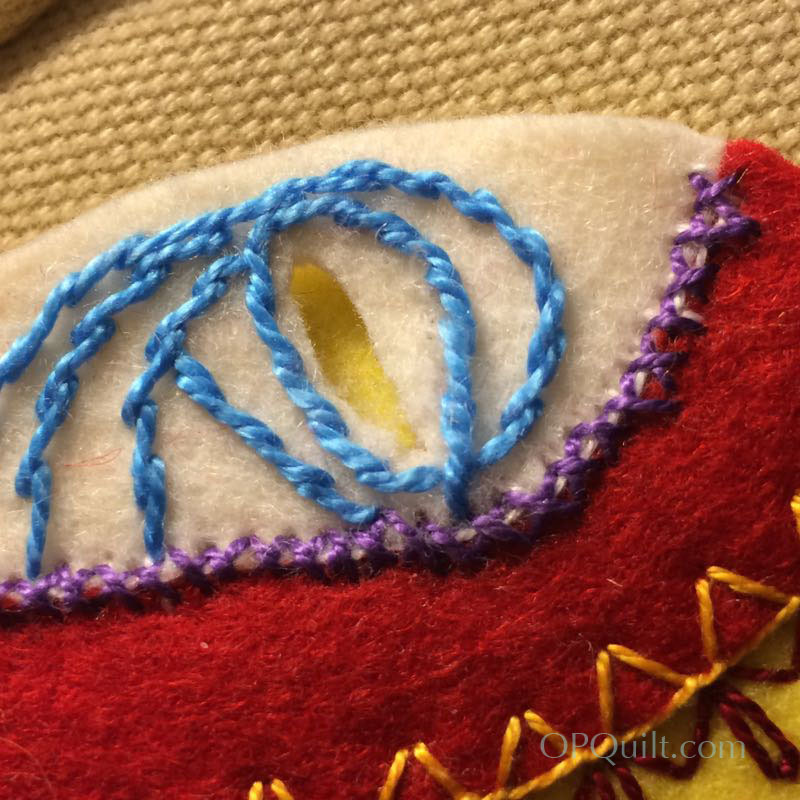 I used the small perpendicular stitch again here in matching (blue) thread, but varied the length of them slightly, so the longest are between the yellow stitches and the shorter stitches are near the yellow. 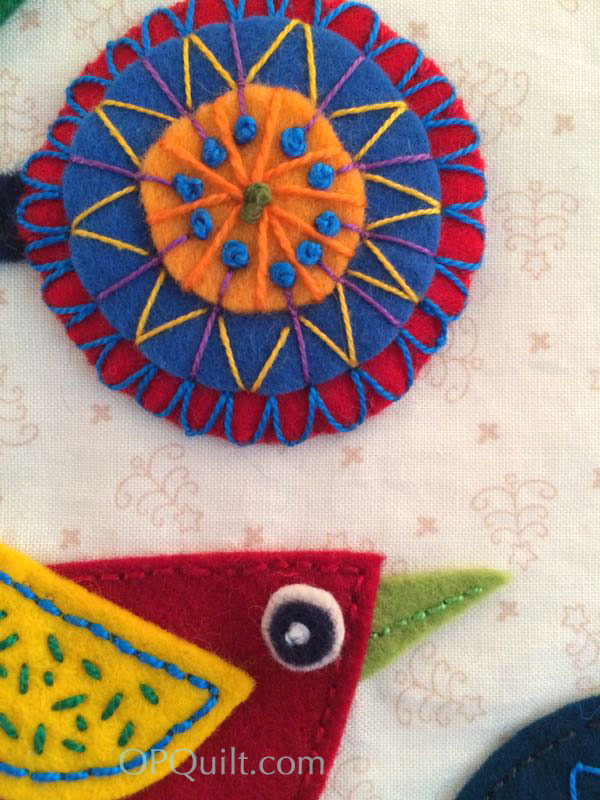 Now for some B-categories: adding another bit of embroidery to attach them. 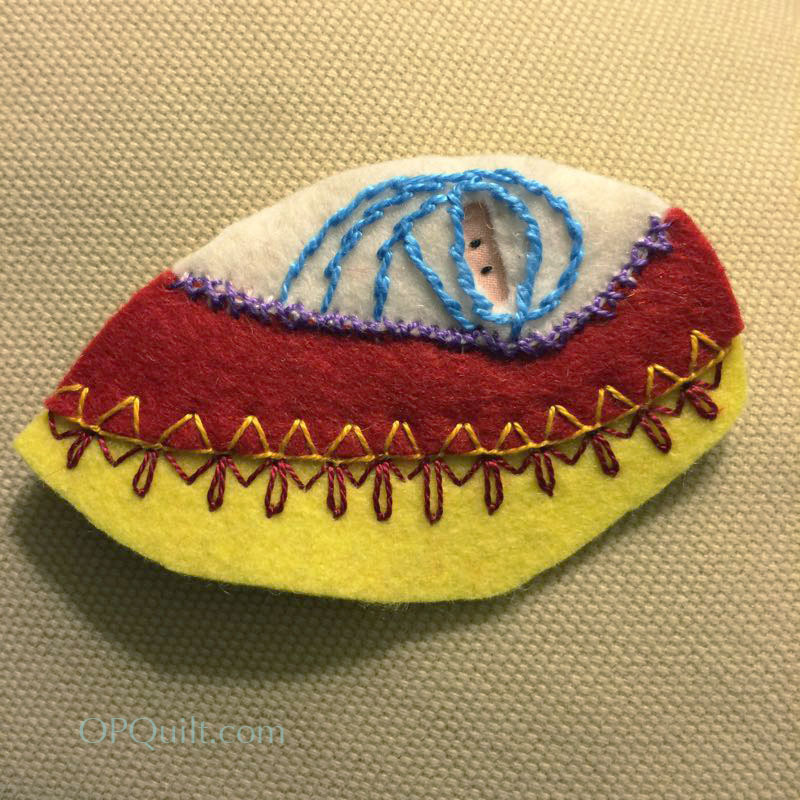 This is a slanted buttonhole stitch. It’s done exactly the same as a regular buttonhole, but instead of keeping the needle perpendicular to the outside edge, you slant it. I like the look of this one a lot. 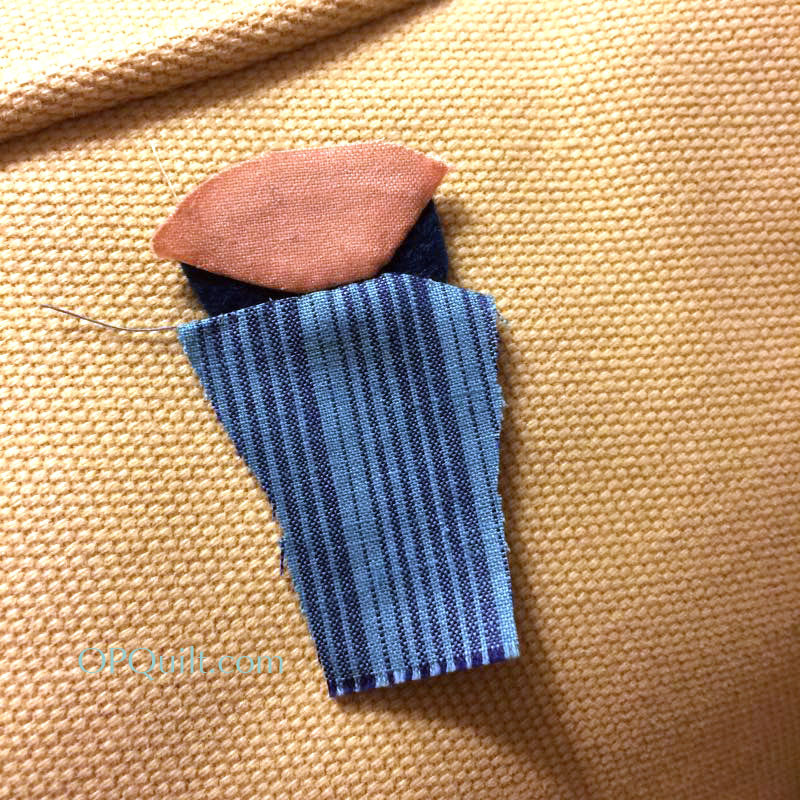 Regular buttonhole. I used matching thread if I thought the flower was busy enough. 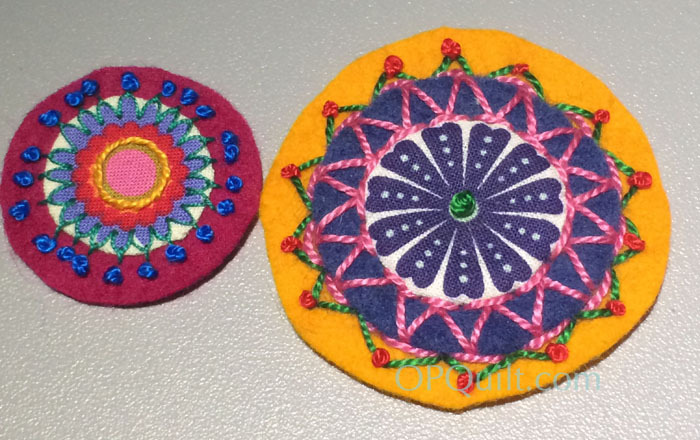 Here’s where I used the backstitch (on the small yellow flower, left) and then used a different color of thread in a buttonhole stitch (magenta flower, right). 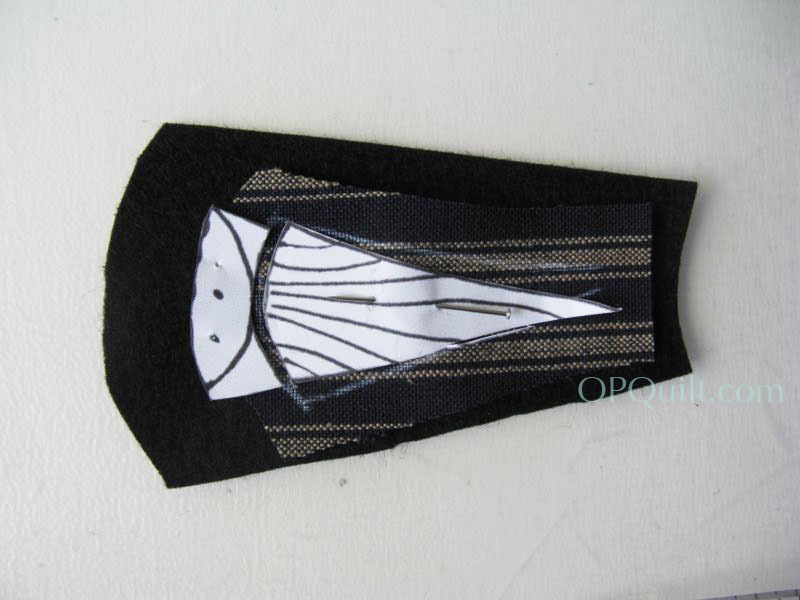 Here’s an “un-even” buttonhole stitch, with shorter and longer “legs” of the stitch, co-ordinating with the existing embroidery. 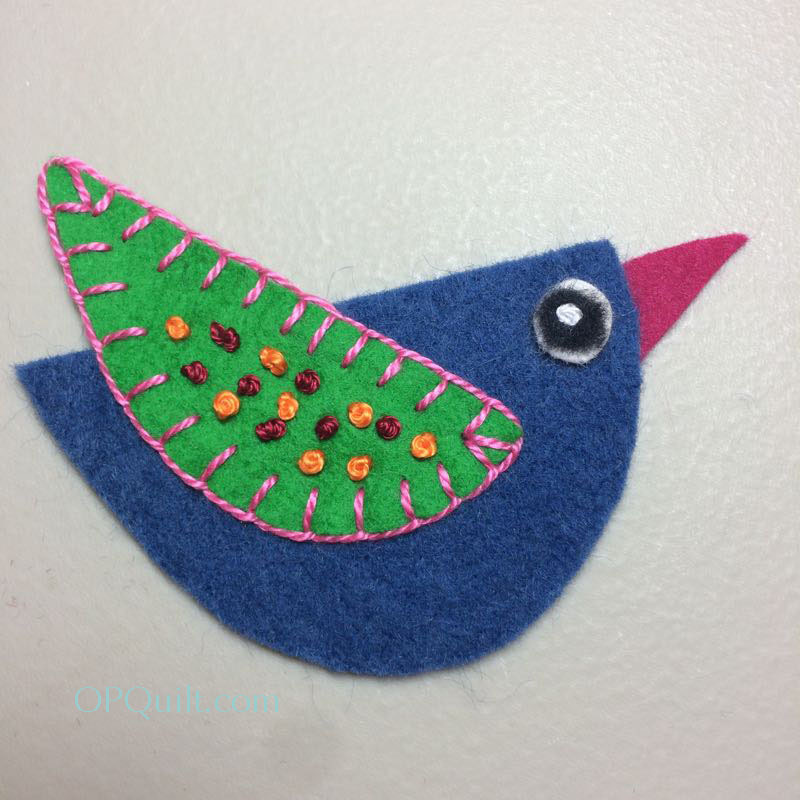 This bird was sewn on with a matching yellow thread, buttonhole stitch. 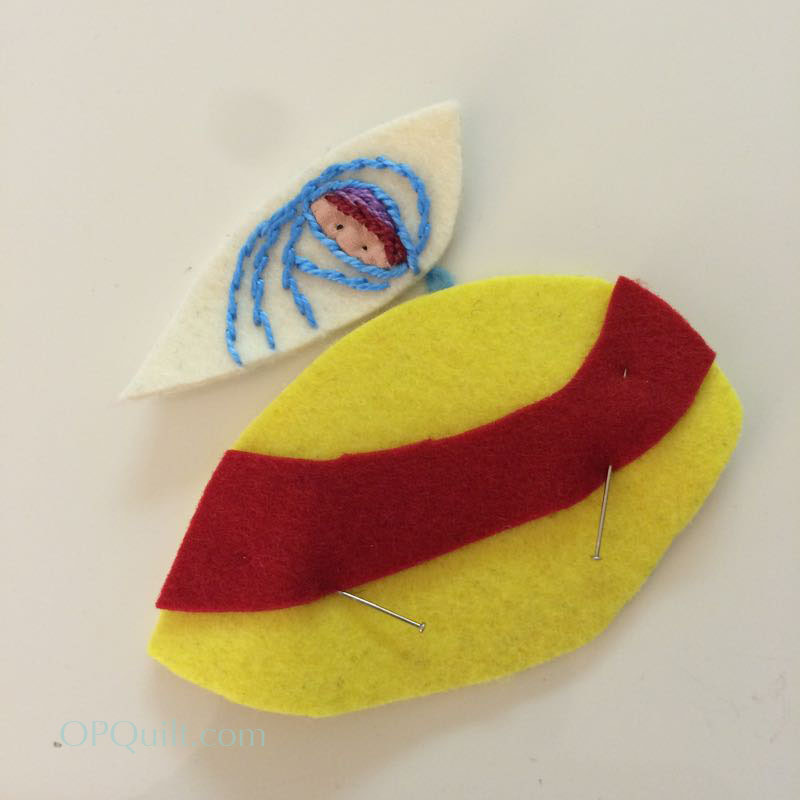 But I slipped a smaller seed (or regular) stitch in between the existing red buttonhole stitch on the yellow bird’s wing to sew that down. Photography of women depends on flattering angles, but I dropped the camera down low so you could see my pregnant bird. She didn’t start out that way, but the wool shifted. 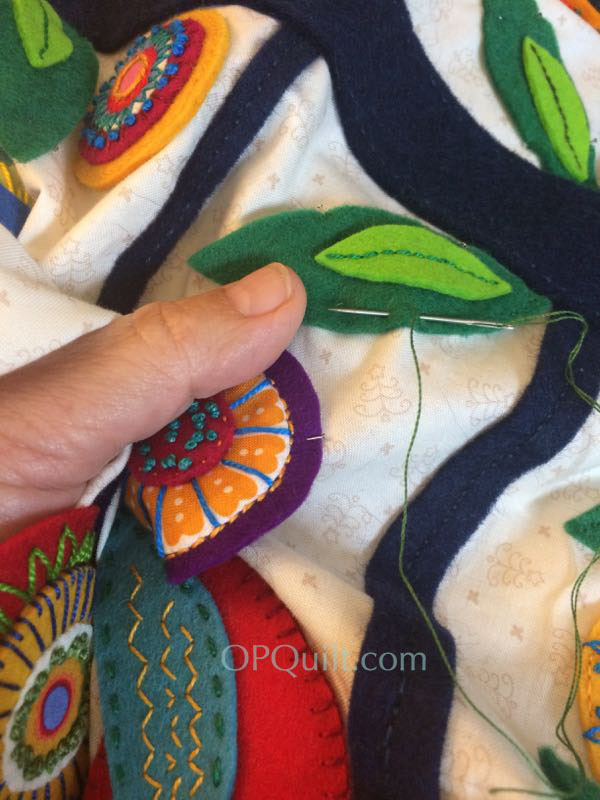 The bubbling up is exaggerated from this angle–it’s not really noticeable from the front, but now you know why I started putting that pin in the center of my birds and flowers as I stitched them down. Didn’t have that trouble with the leaves, for some reason. 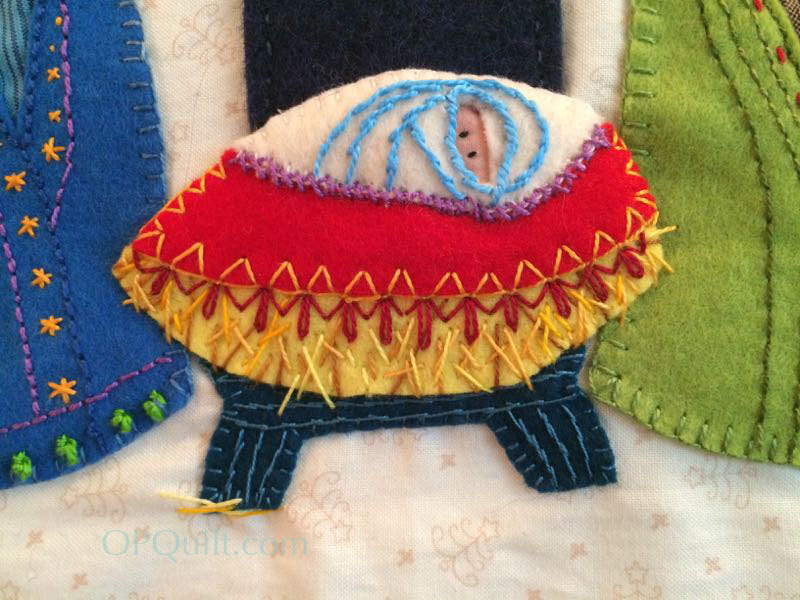 She’s attached to the background with a simple backstitch. I also did a line on the birds’ beaks. I tried to make them happy birds (It’s Christmas, remember?) 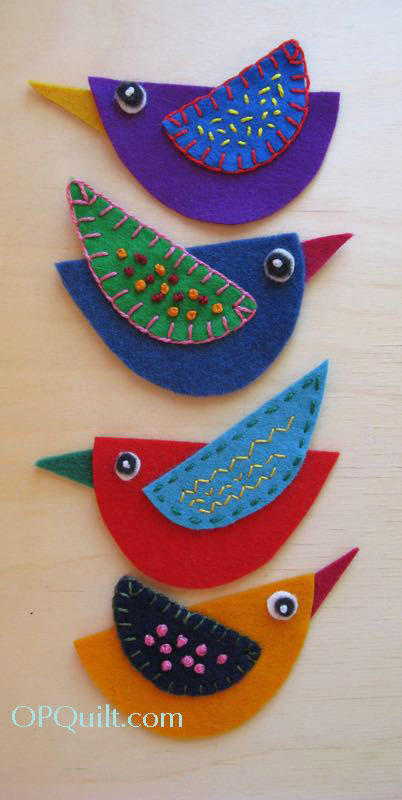 by the slight curve of the stitching, but some of the birds turned out a bit moody. 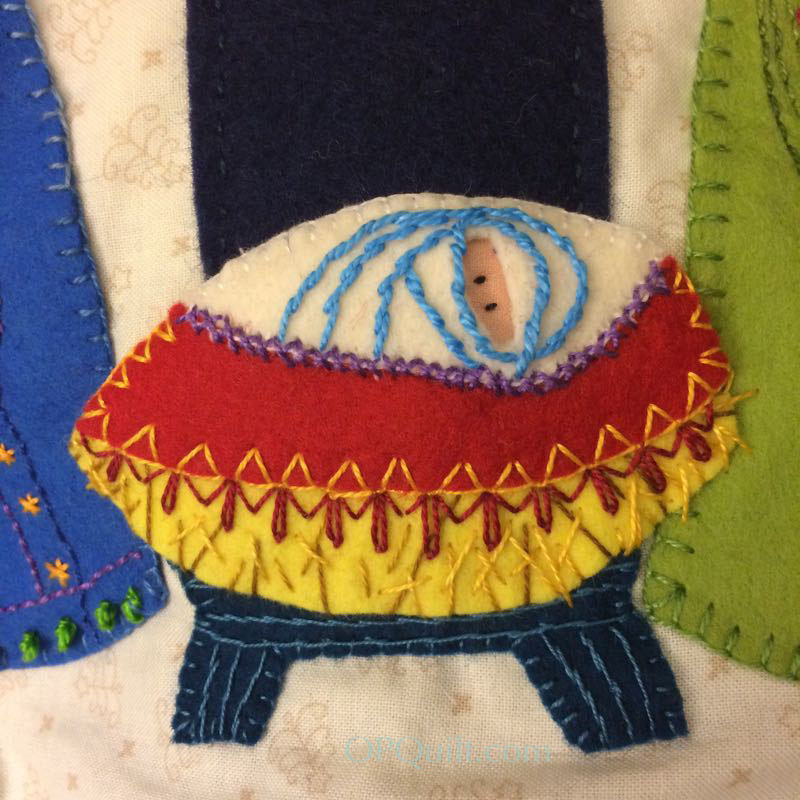 This is another where I snuck a small stitch in between the existing embroidery (A-category), and below, the last photo (!) where you can also see detail on the bird’s beak. We are definitely getting closer to the end, now, and I’m pretty excited. Next month (June 2nd), I’ll have an alternate scene for you for under the tree, and then we’ll roll out from there. 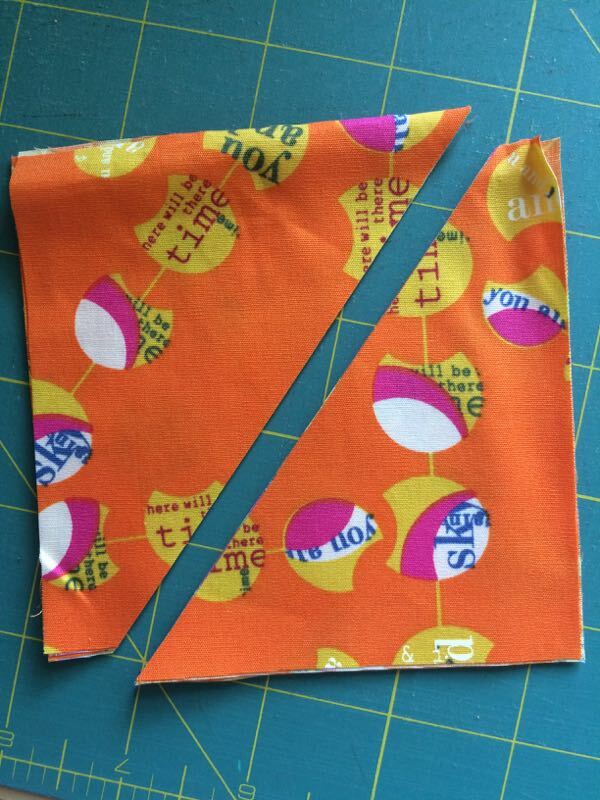 July, Step 6: Sawtooth border (reds); sew together and attach. September, Step 8 Show and Tell, just in time for school starting again. 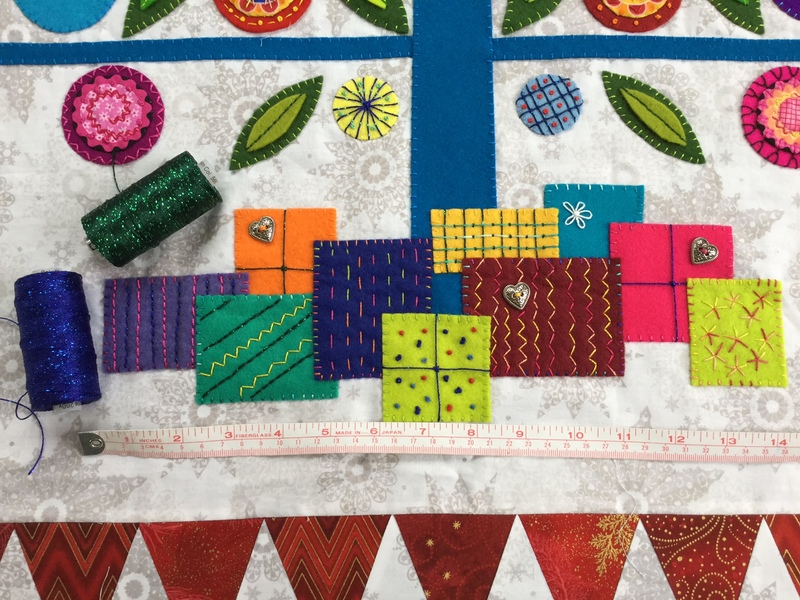 Yes, we cut a month off our sewing, so you’ll have plenty of time to finish your quilt before December. 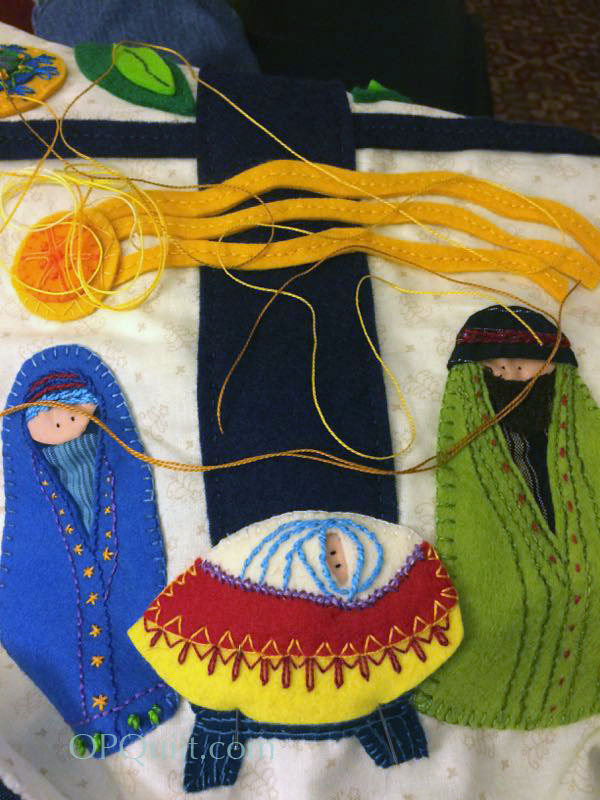 Happy Stitching and we’ll see you in June! 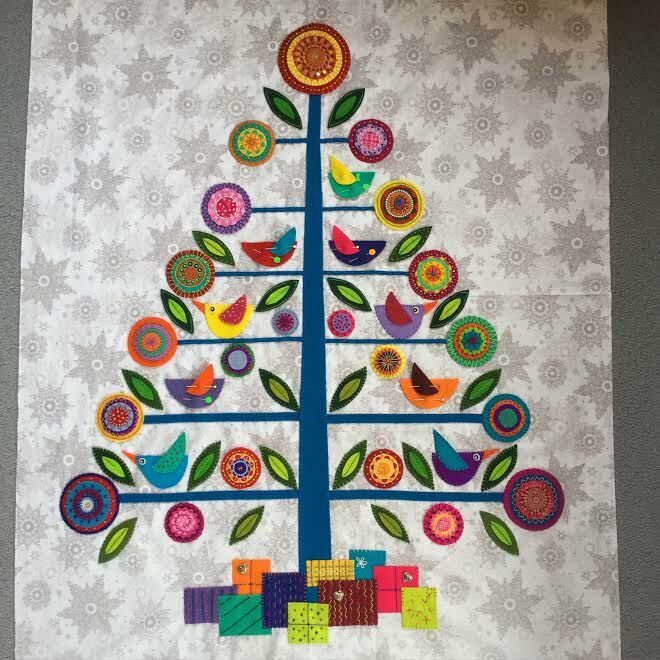 Posted on April 2, 2016 by Elizabeth E.
Here we are again, gathering together for the next step of the Oh Christmas Tree Quilt-A-Long (#ohchristmastreeqal), using the pattern found in Quiltmania’s Simply Moderne, issue #3, designed by Wendy Williams of Flying Fish Kits. At this point, you’ve been working on your flowers for a month, and if you are like me, that first one was like jumping off a high dive, and thinking the pool was empty and you’d go splat. But you didn’t, and your flower circles are looking wonderful and you are actually having a great time. 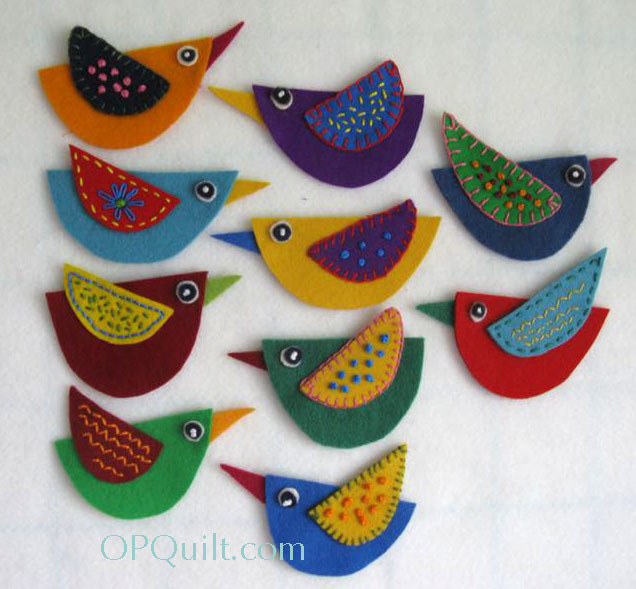 Keep working on them, you’ll need 21 of them in the various sizes shown on the pattern. I have to admit that all of mine are not the “perfect” size, as some are larger than what is called for. 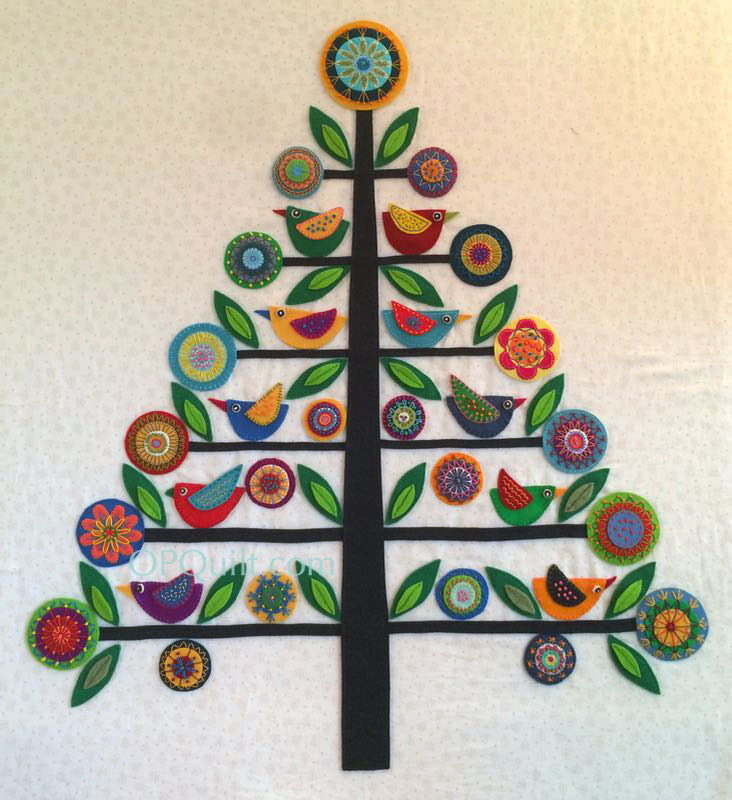 I mocked up the tree the other day (I’ll show you this at the end) and it was okay. So no fretting. 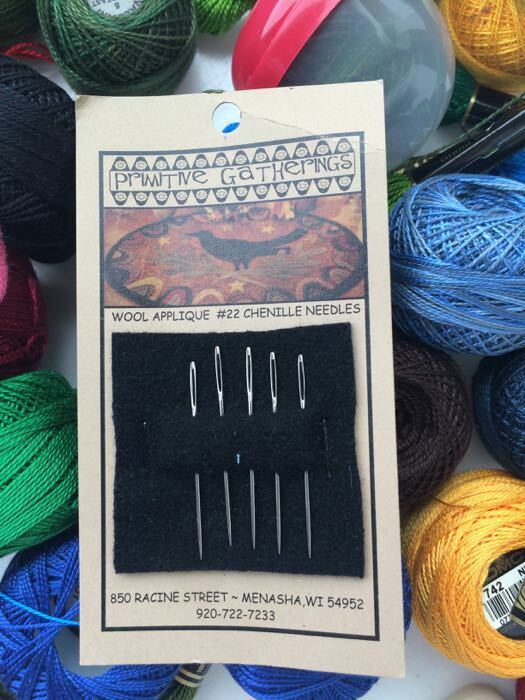 Just #startyourneedles and keep creating and stitching. But. 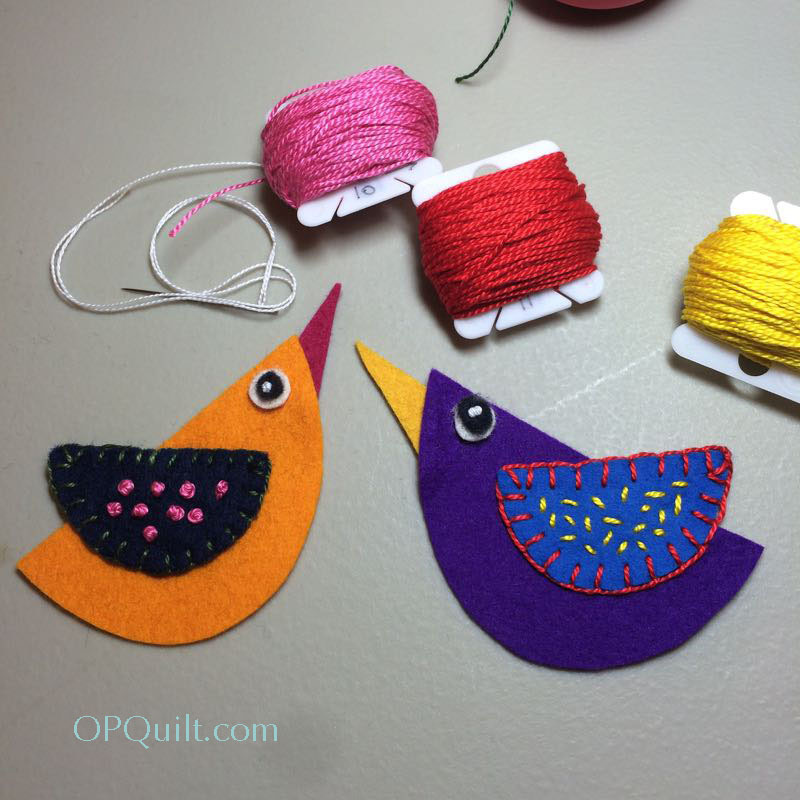 . . this month we’re adding two easy tasks: leaves and birds. First up, birds. Remember all that tracing you did of the birds, and how you labeled them and marked the dashed overlap lines on a folded piece of freezer paper, so you’d be making two copies of the bird (one regular, and one reversed) and you stapled it together to keep the pieces from shifting? Now’s the time to get them out. 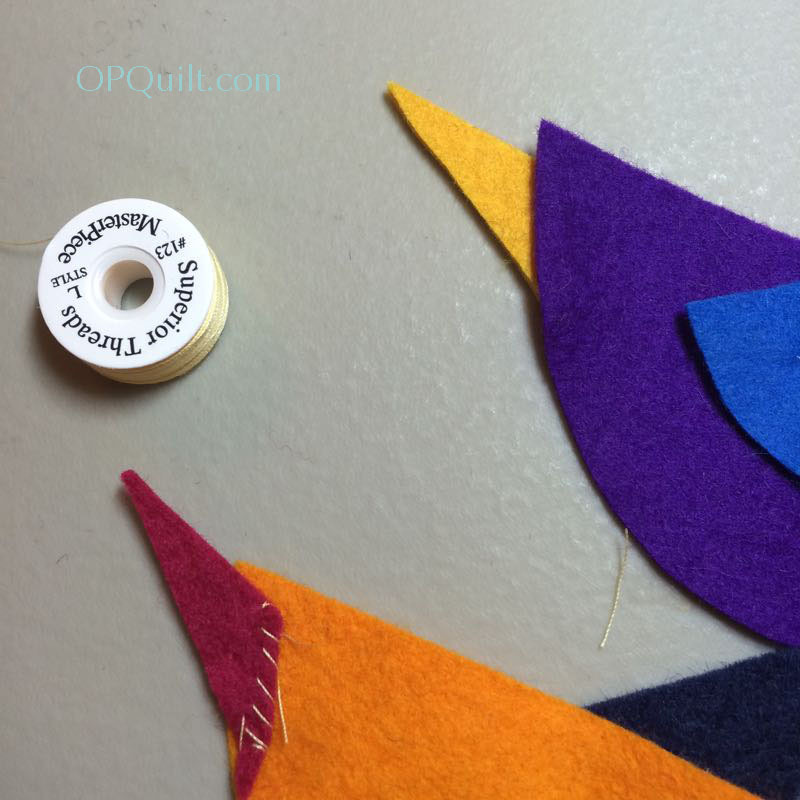 Hold them up to the light and transfer the dashed overlap marking on the wing to the wing piece on the other side, then cut them out and start picking your colors. Be bold! Red beaks! purple bodies! wild wings! 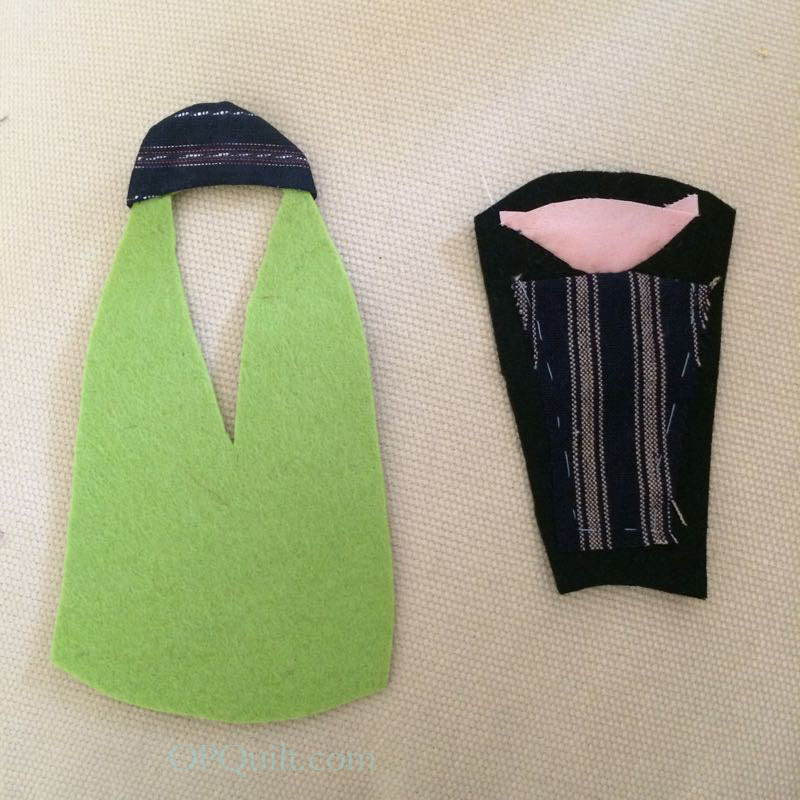 I ironed down the freezer paper patterns, using a wool setting (NOT your regular cotton setting–or you’ll scorch the wool), and then cut them out. I tucked the beaks under the body, guesstimating where they’d go (hint: NOT even with the top of the body) and pinned them. 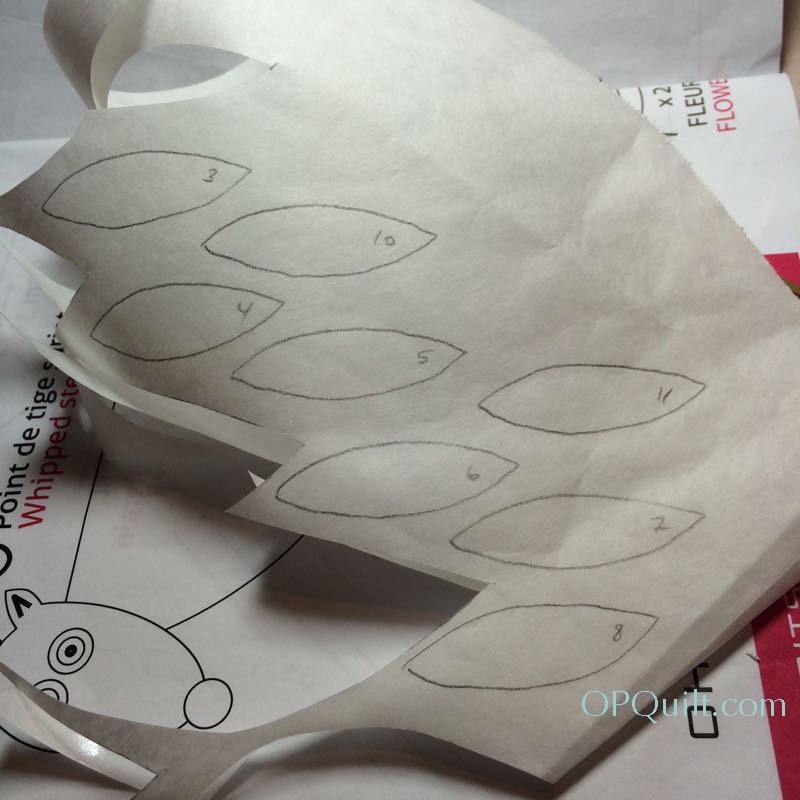 Then I place the wing on the bird, using the dashed overlap line to place them, then pinned that in place. 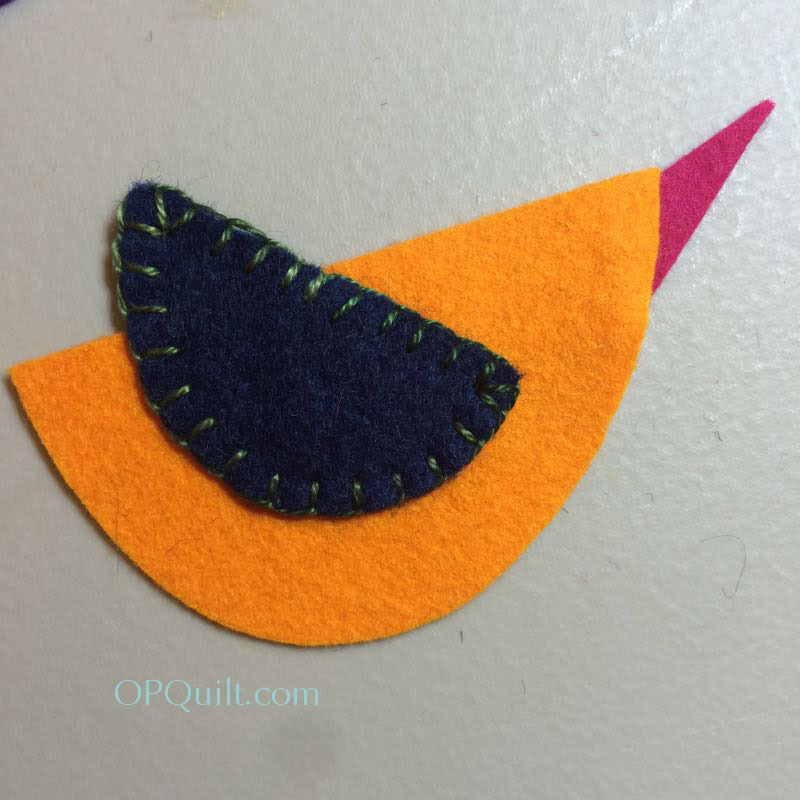 Wendy of Wendy’s Quilts and More gave me a tip to sew on the beak first. I just used a few overcast stitches to get it on securely. I’d never qualify for a bird plastic surgeon, that’s for sure. 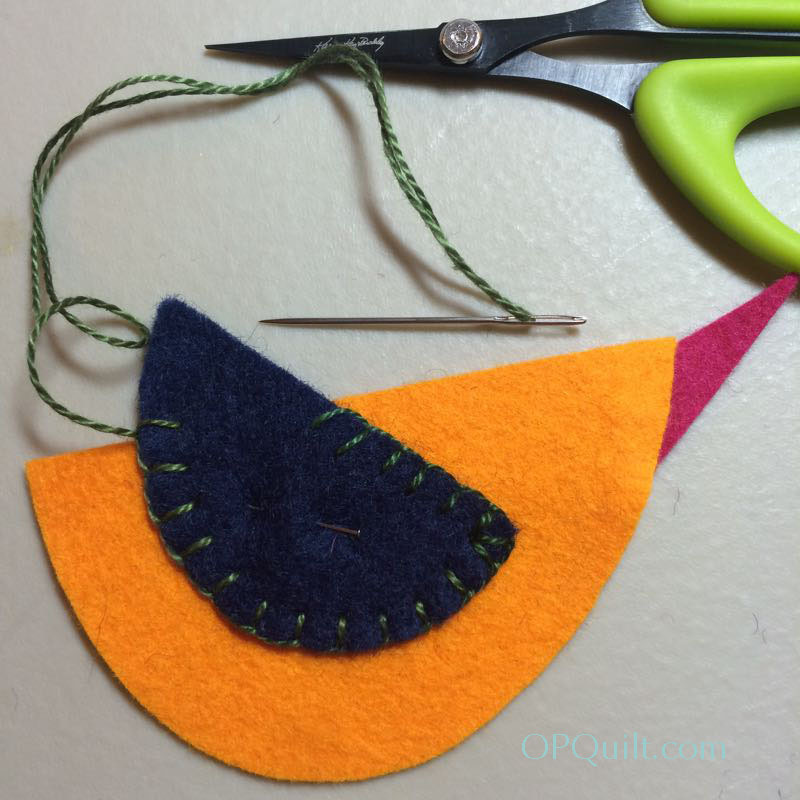 Then attach the wing by blanket stitches (or overcast stitches, or a back stitch or a running stitch), beginning where it attaches to the body and work your way around the lower edge and back up again. Now do the floaty part of the wing, and tie it off. 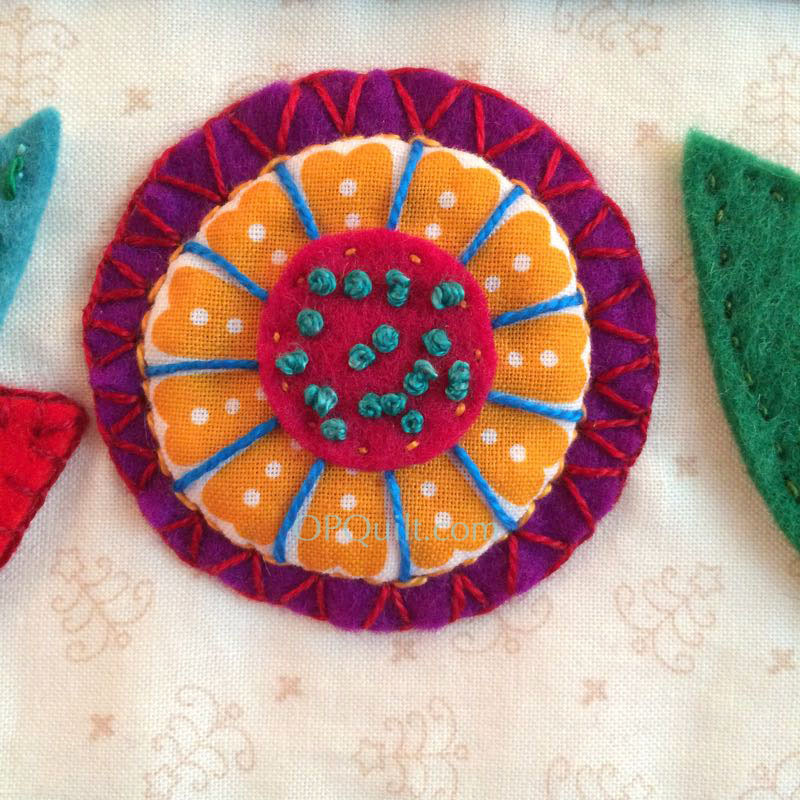 Add a few French knots, or seed stitches, or whatever small decorative stitch. 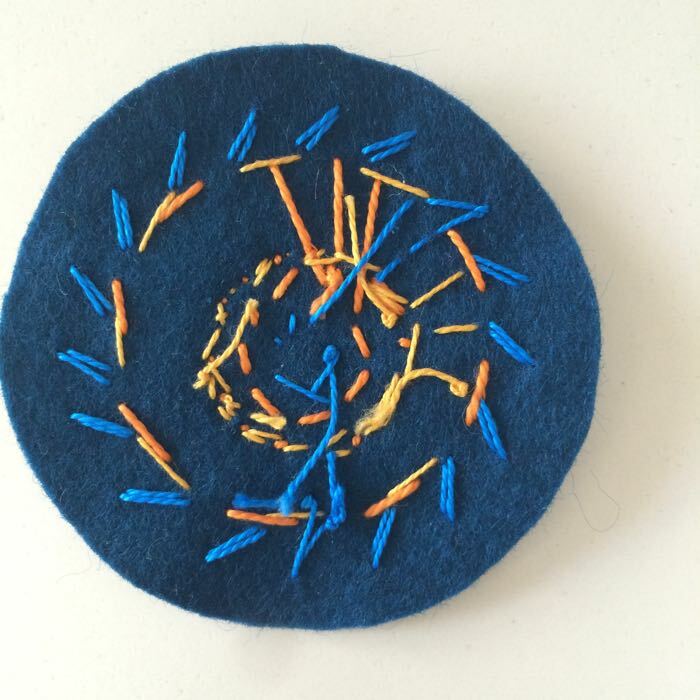 Cut a teensy circle of white, then an even teensier circle of black and secure them both with a French knot, done with white thread. 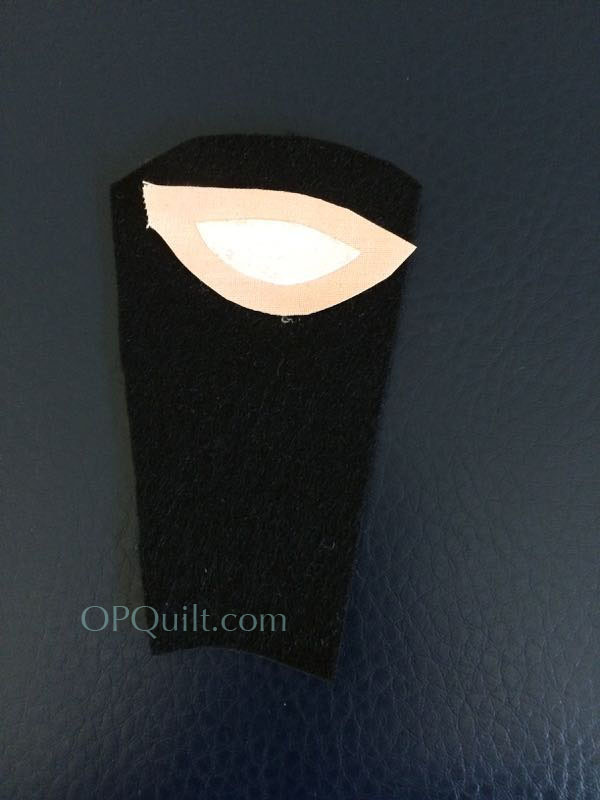 I started by cutting 1/2″ squares of white felt, then rounded them off, and then cut smaller squares of black and just kept going around and around, cutting, until it was the right size. Be prepared to sacrifice a couple of eyeballs until you get the hang of it. 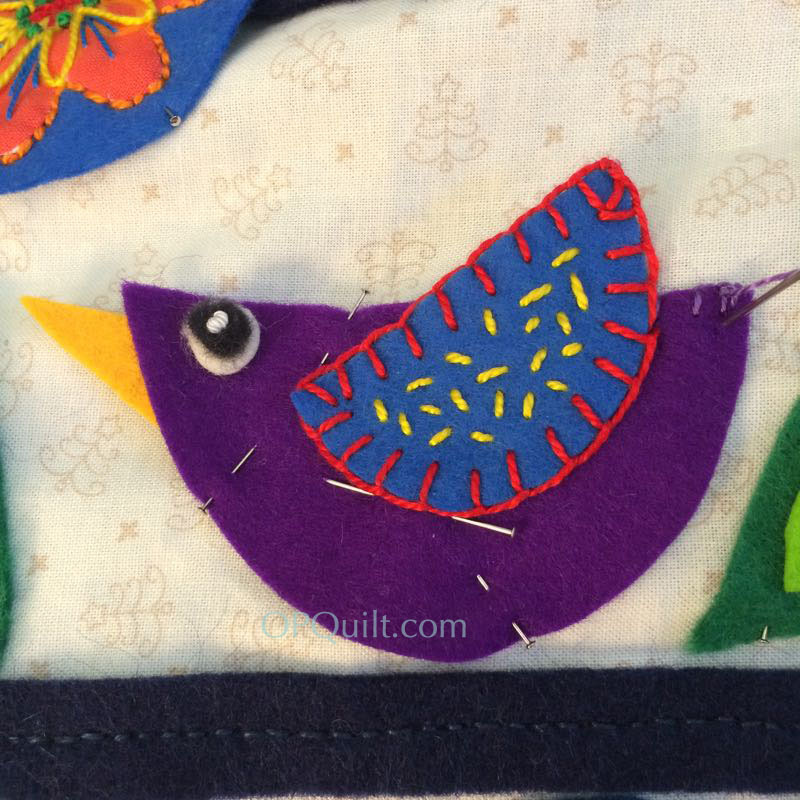 I got fancy with that red bird, attaching the wing with running stitches, and doing a zig-zag stitch across the wing. I took them with me on my trip to Portugal and Spain (pictures of that trip are on my Instagram, to the right and on a previous post) and was able to get them sewn without too much trouble on the [long] flight out there. These go MUCH more quickly than do the flowers, so I’m also adding LEAVES to this month’s tasks. 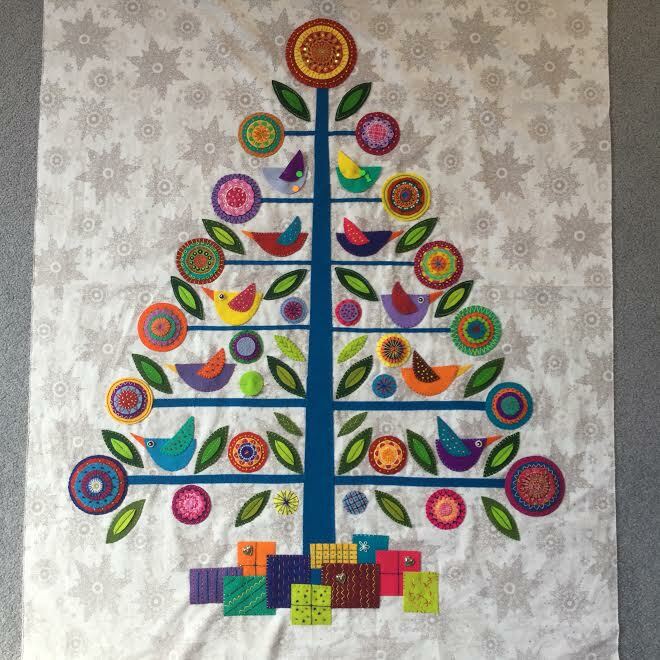 So I was curious as to how I was doing at this point, so I smoothed my tree up on the design wall, and stabbed pins through all the flowers and the four birds I’d finished. Then, ACK! I was stuck. What number flowers were where? 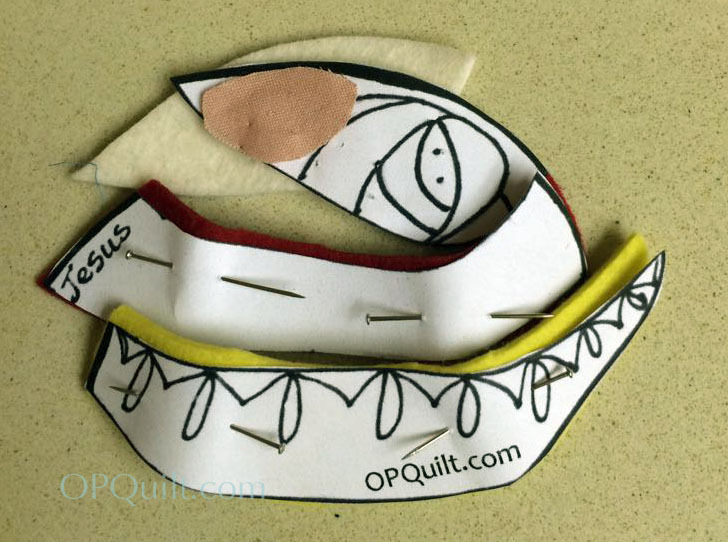 What had I sewn and cut and what was I lacking? I got out all the baggies of labeled flowers and set up a little station on my ironing board, right below the tree. I wrote out post-it notes labeling the flowers as in the pattern, and then a master list of where they were supposed to go. 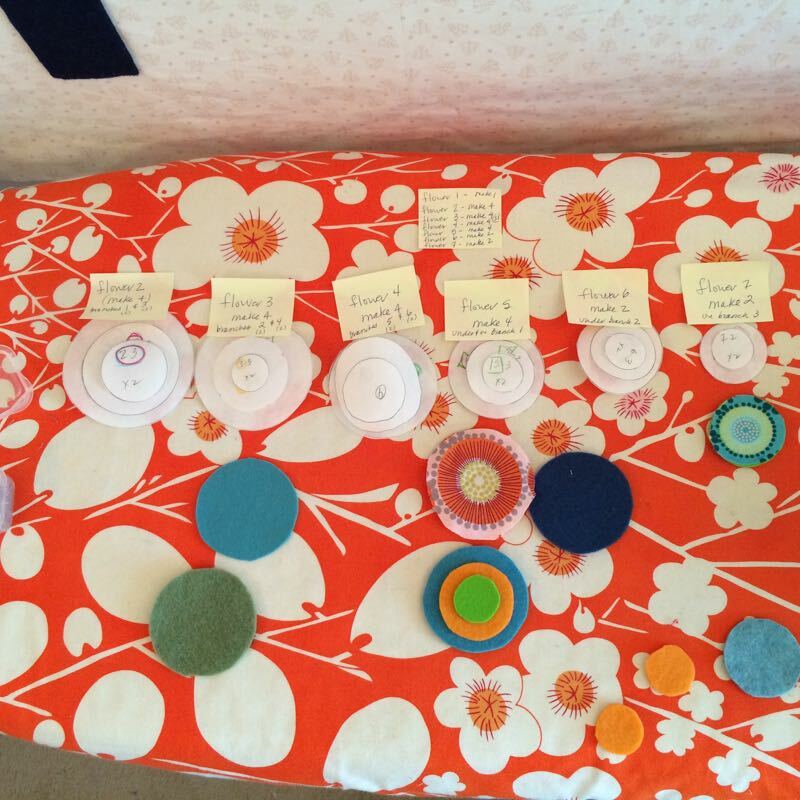 I then lined up the circles from the pattern, drawn out on freezer paper below each sticky note, so I could see the relative sizes. 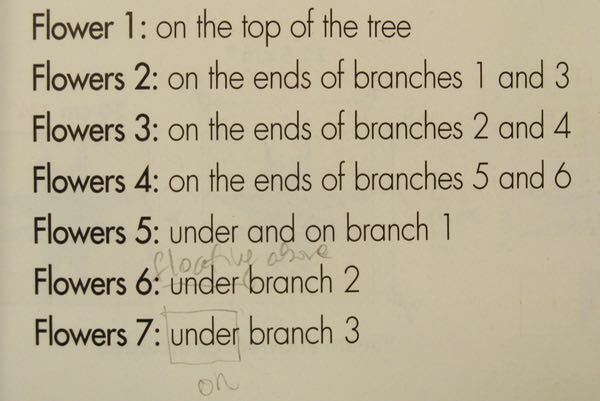 If you want it to look like the one in the magazine, Flowers 6: should read “floating above branch 2” and Flowers 7: should read “on branch 3.” I say, just squinch them all in where they’ll look good. This is just a test run, but later we’ll do it for real. 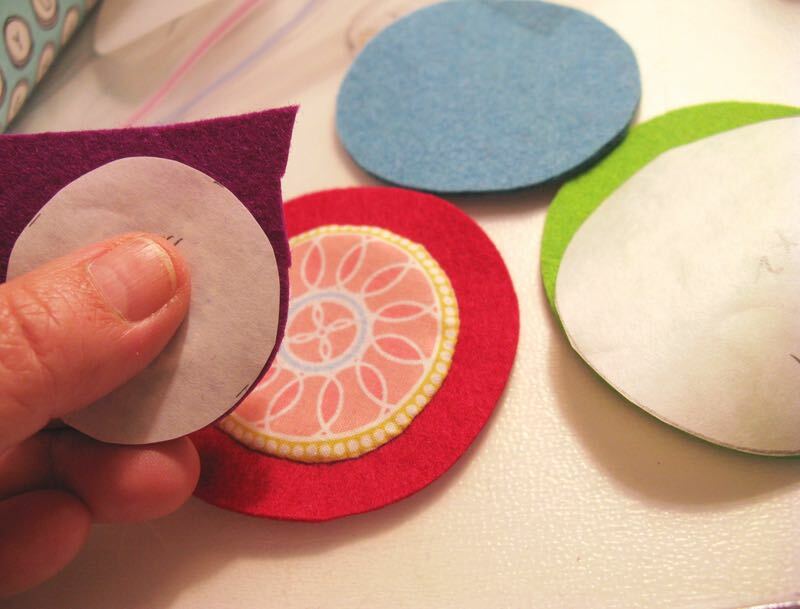 After a while, I could pin up what I’d cut out, fabric medallions, layered felts and all, and was pretty pleased with how it was coming along! I’d encourage you to do this interim step, if only to give yourself a little pat on the back that you’ve come this far. After taking the photo, I put everything away in the proper baggies, and planned to keep stitching flowers and finish up the birds. And after getting home, I did another mockup. I didn’t pay too much attention as to what number flower should go where, but instead put my largest one on top, then the next two largest on the lowest limbs, moving on up the tree and thinking more about size and color placement. I’ll let this stay up on the design wall for a few days while I move things around. I did have one dud–a flower I ended up not liking, but that’s pretty good, I think. I only had three flowers left to finish, which I did yesterday, so I’m ready to move on to the next phase. 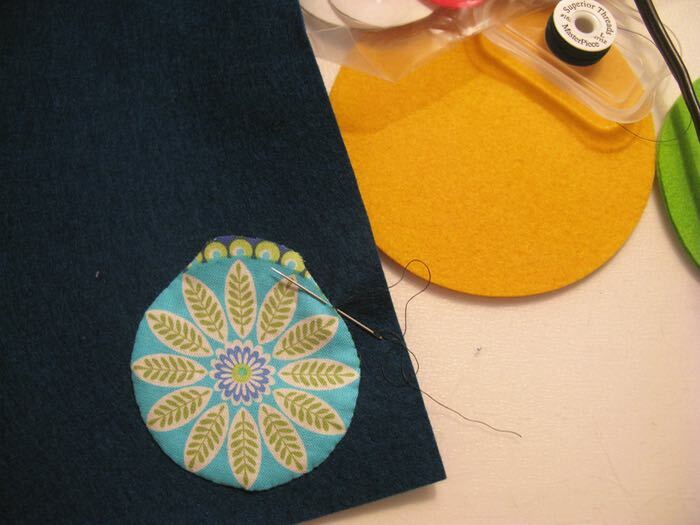 March, Step 2: Make 21 flowers.Keep stitching, keep stitching! 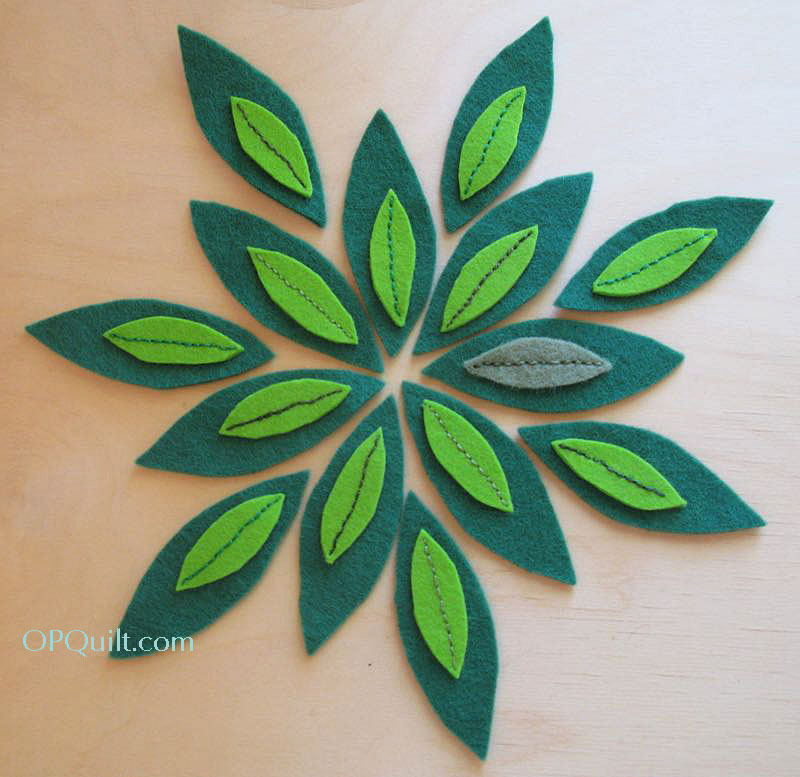 April, Step 3: Make 10 birds and the leaves. 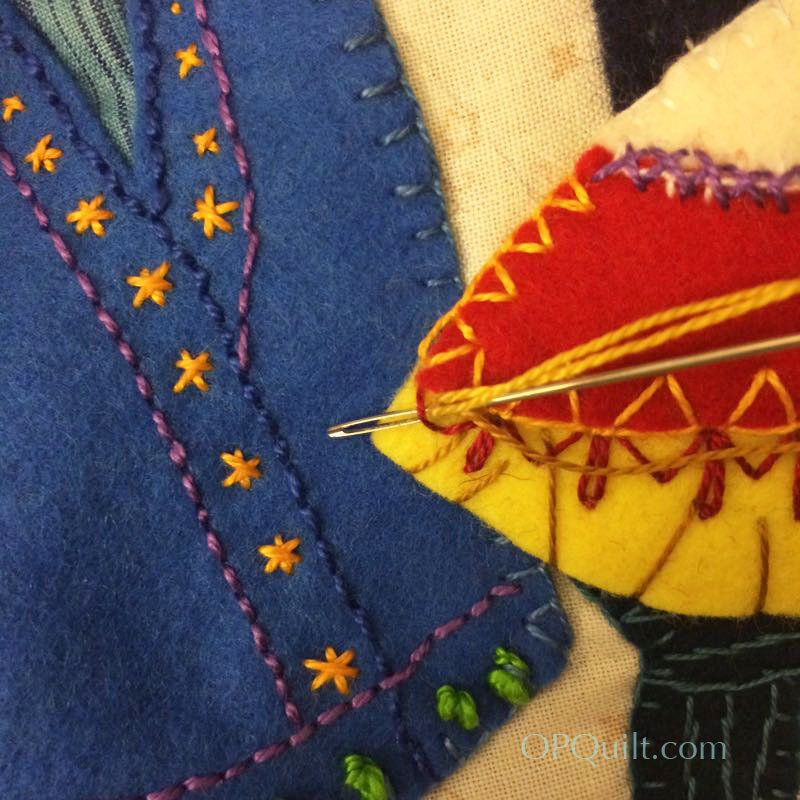 Keep stitching, keep stitching! May, Step 4: Scene at bottom of tree. 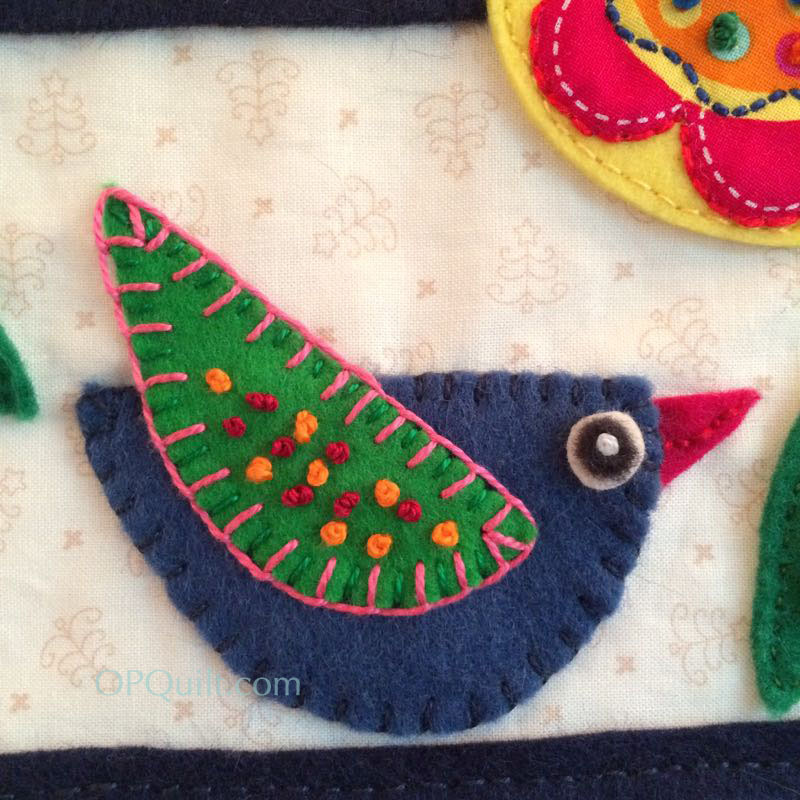 July, Step 6: Appliqué down the birds and the scene. 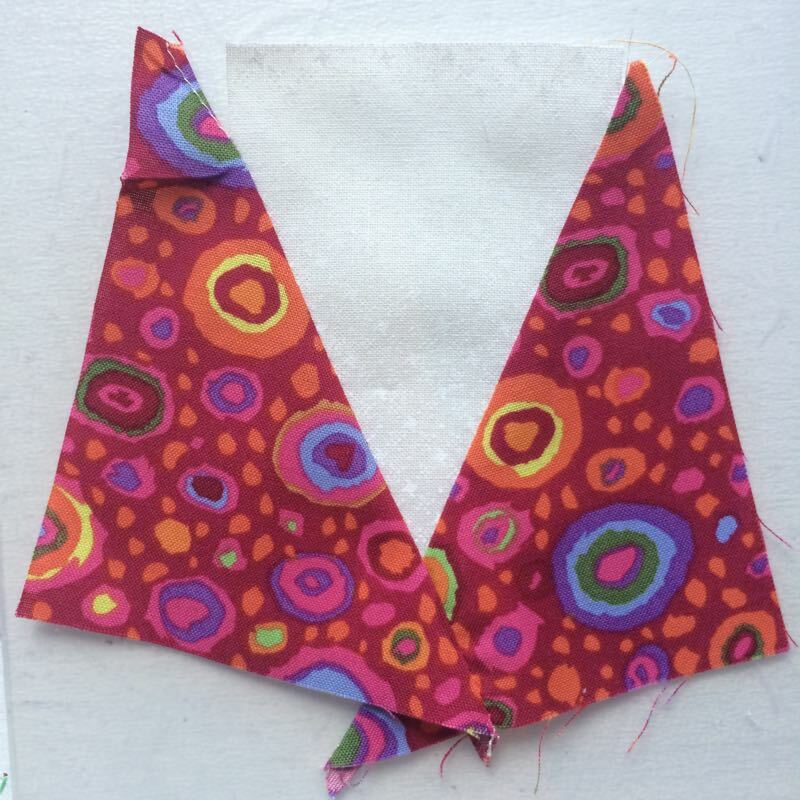 August, Step 7: Sawtooth border (reds); sew together and attach. September, Step 8 (finish up Quilt-A-Long): Make wonky star blocks, sew them together and attach border #2. See you May 2nd for the next step: scene at the bottom of the tree. 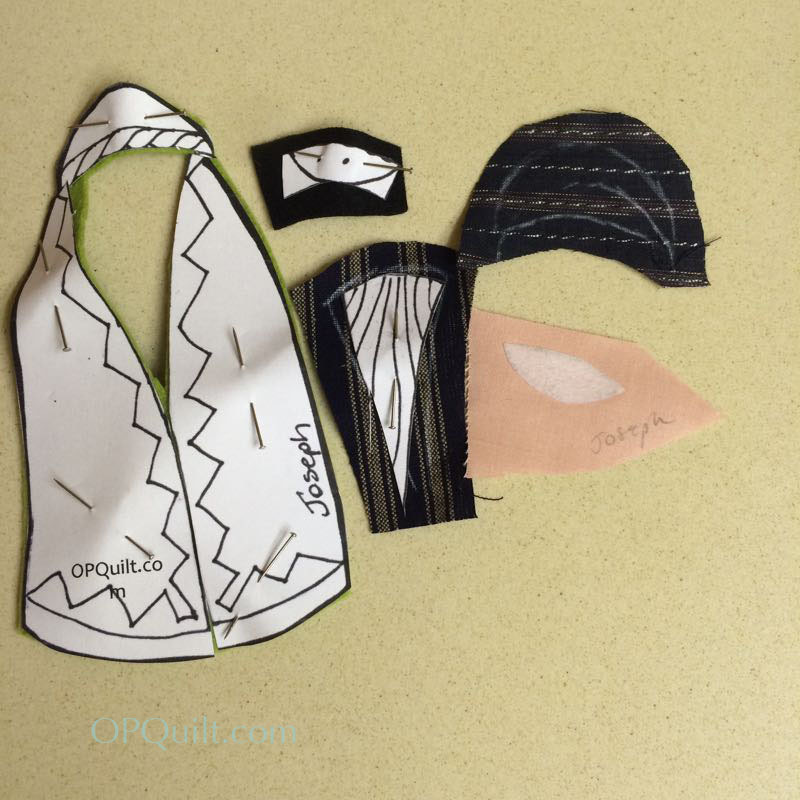 Wendy’s done one scene, the pattern shows one, and I’m cooking up another. See below for the giveaway. Initially I wasn’t going to do a giveaway, but after visiting with Anna in Barcelona, I thought it would be fun to have a Spanish connection from our trip. In Barcelona, I purchased five balls of size 8 pearl cotton (my favorite size) and will send that to the lucky person who is chosen from comments left below. 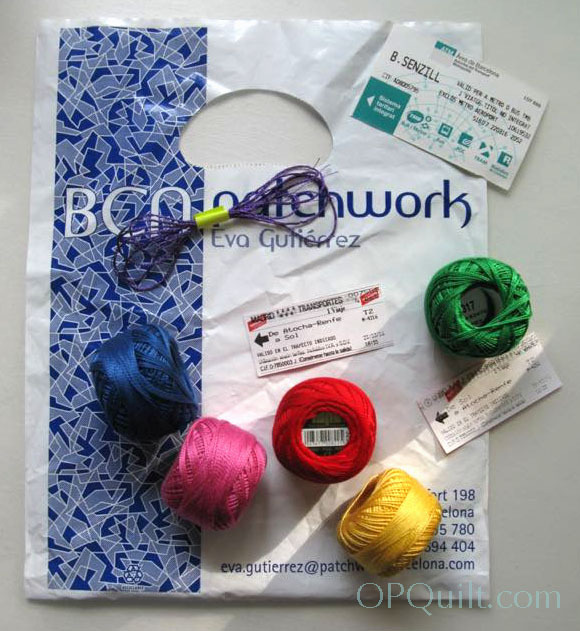 I’m also including a 1 yard piece of metallic purple embroidery floss that I purchased in Lisbon. 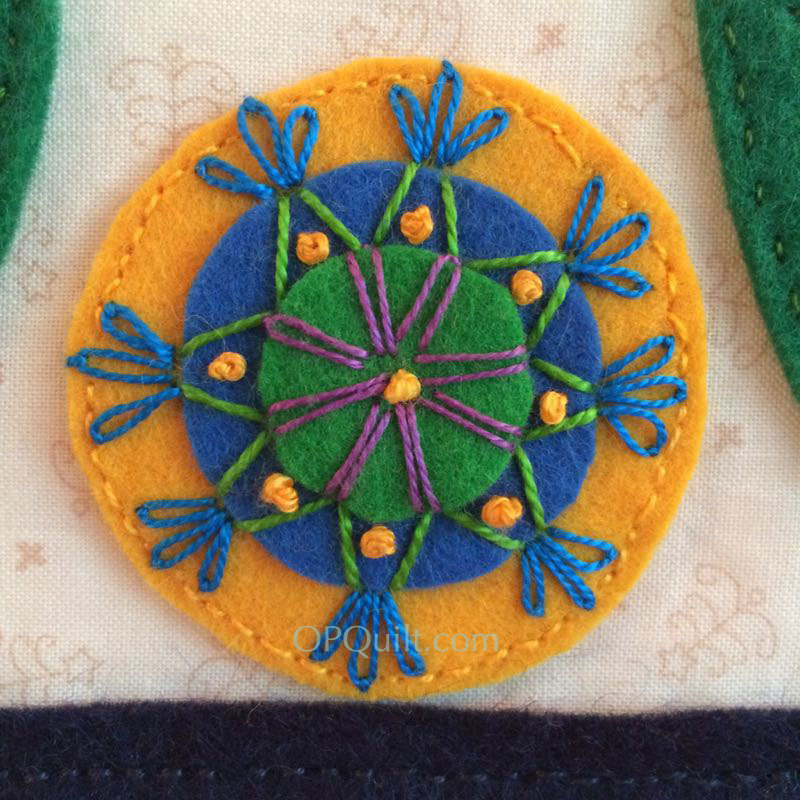 Even though it is a little like sewing with tensile steel, it makes fun accents on our flowers (I used mine for some back stitching here and there, and also for some French knots on another flower). Please leave a comment below, telling me either where you’d like to go a a trip outside the US and why, or the place where you had your favorite trip (outside the US) and why. I love to read about other people’s trips, or their hoped-for travels! I’ll let this run for a few days, then will close it off and chose a winner. UPDATE: Comments are closed now. Thanks for writing! 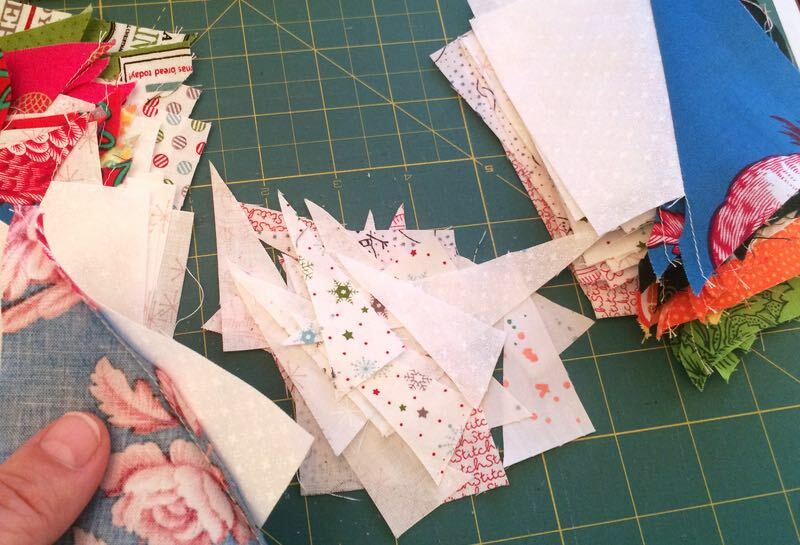 Posted on March 2, 2016 by Elizabeth E.
I’ve been haunting the IG feed #ohchristmastreeqal and love seeing all the progress of where the trees are and how things are coming along. We’ll finish this tree up in no time flat, but I think I’d like to keep sticking to the schedule (below). We also have a giveaway at the end of this post, so please read all the way through, and then follow the steps to enter. 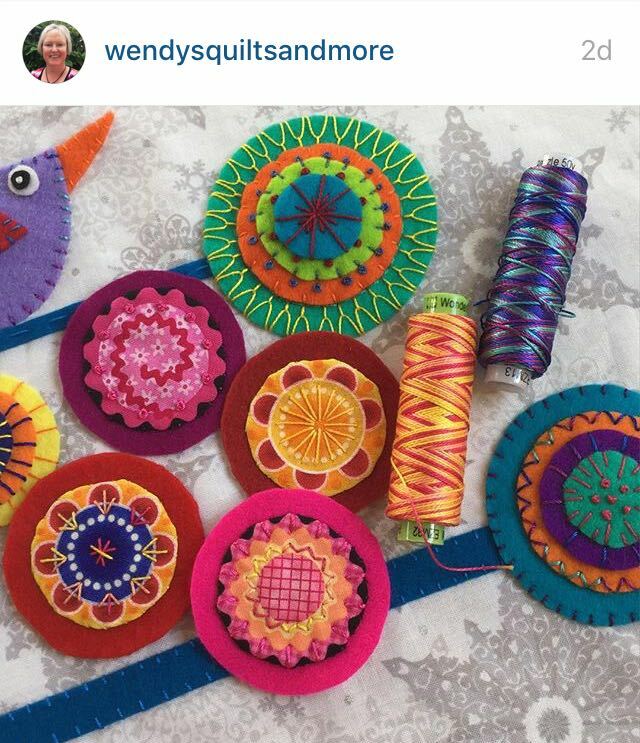 First up, this post is co-authored by Wendy of Wendy’s Quilts and More (blog) and wendyquiltsandmore (IG). 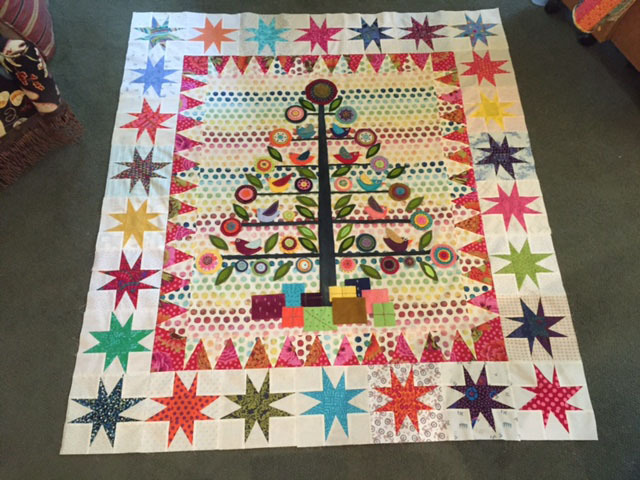 Wendy has been a great partner in this Oh Christmas Tree QAL. Because she is about 4 months ahead of us, and I can send her different questions and she is unfailingly helpful. I asked her if we could use a lot of her photos for this particular post about the flowers, and she was happy to allow me to post them, so get ready for a photo-heavy post. This month is the flowers. 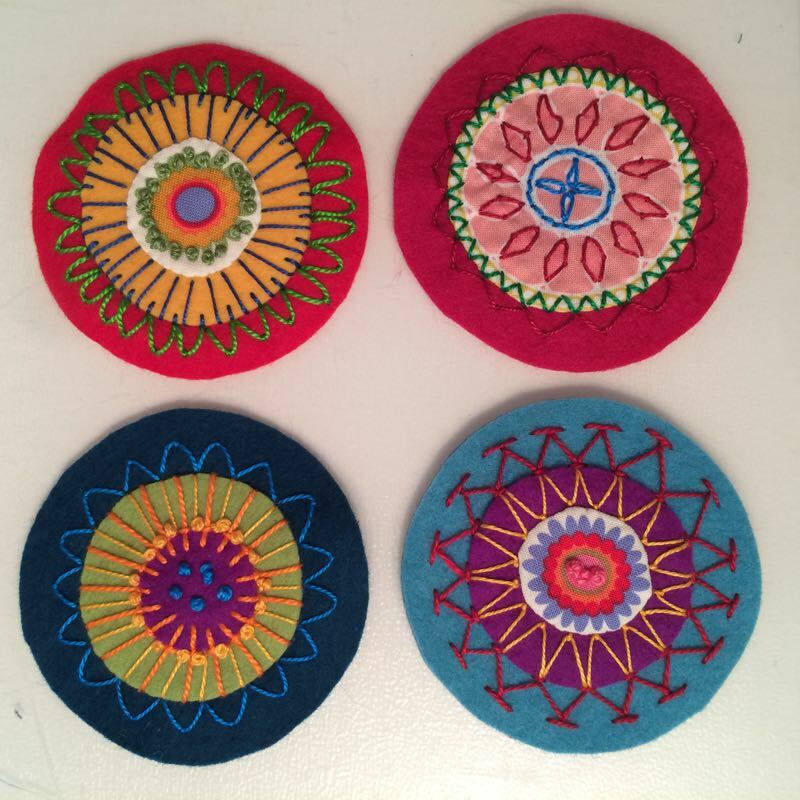 The basic idea is to layer up felt circles, or use a piece of medallion-style fabric appliquéd to a felt circle, then embellish it with embroidery stitches, using pearl cotton. 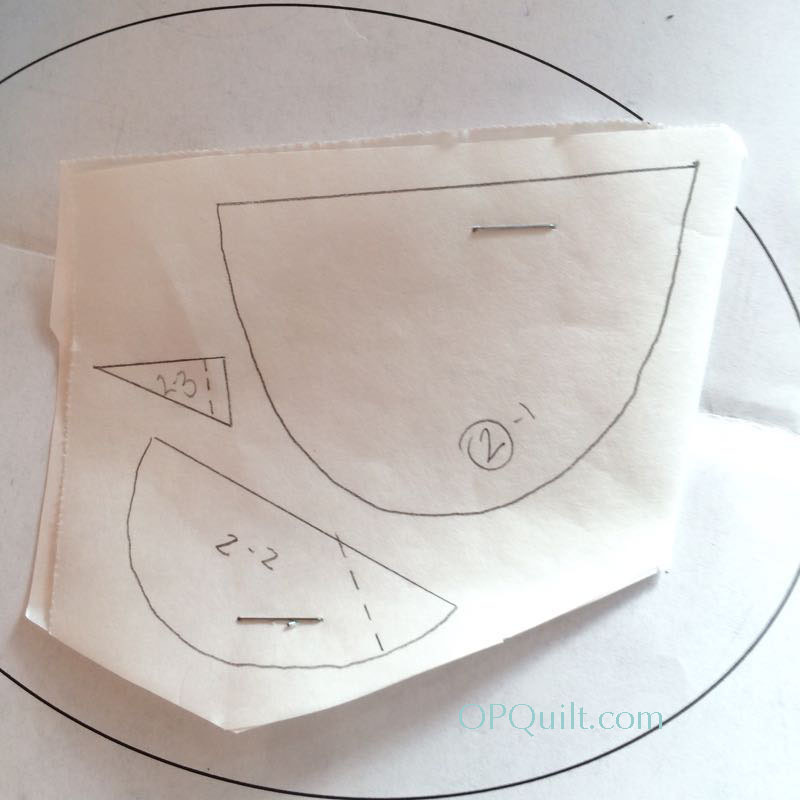 I originally started cutting out a lot of circles, from the prepped up freezer paper circles in my numbered baggies (see previous Oh Christmas Tree QAL post on tab above), but realized that it might be better to be more of a one-by-one process. So let’s do one circle and you’ll see what I mean. And here are some of mine (above). 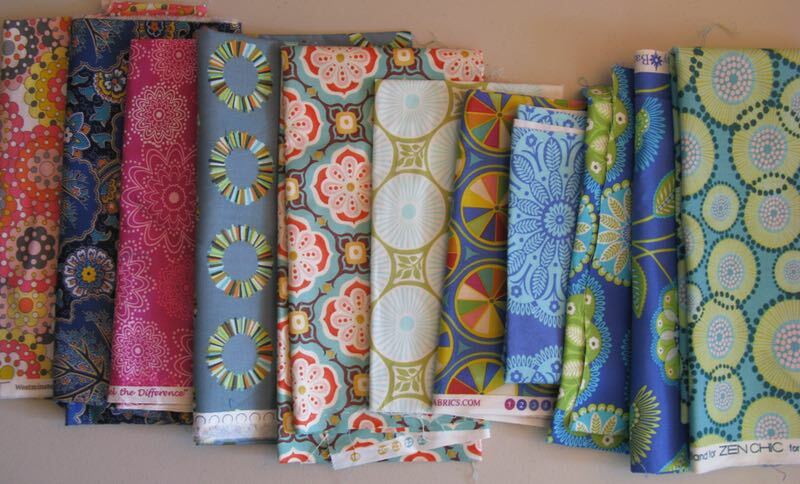 After writing back and forth with Wendy, I went through all my fabric stash and found even more than this. It’s surprising how many I’d overlooked. We do have some the same. Okay, back to the stitching. 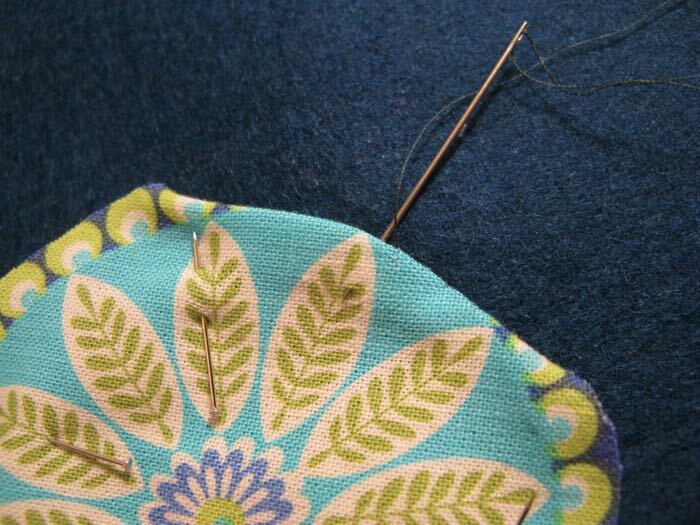 Placing the circle on a larger piece of felt, I sewed down the edge, stitch by stitch, scooping the raw edge under with my needle, sometimes swishing the needle tip left and right under that edge if there was a tuck/sharp point (above). 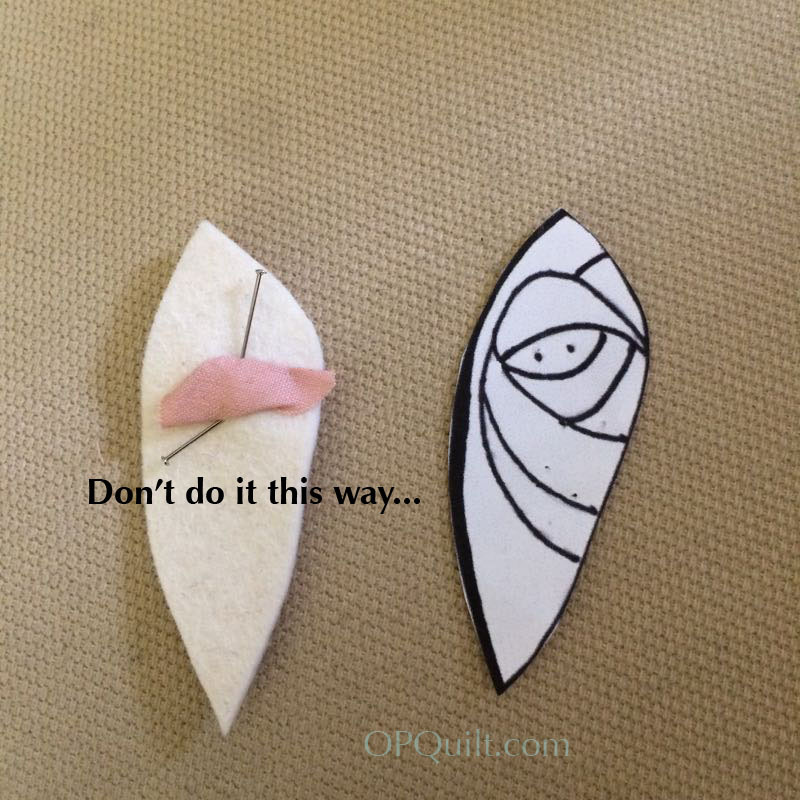 Often it’s what’s happening underneath that bumpy edge which determines the smoothness of your appliqué, so pay attention to what your seam allowances are doing, even trimming them further to a scant 1/4″ inch if you need to. 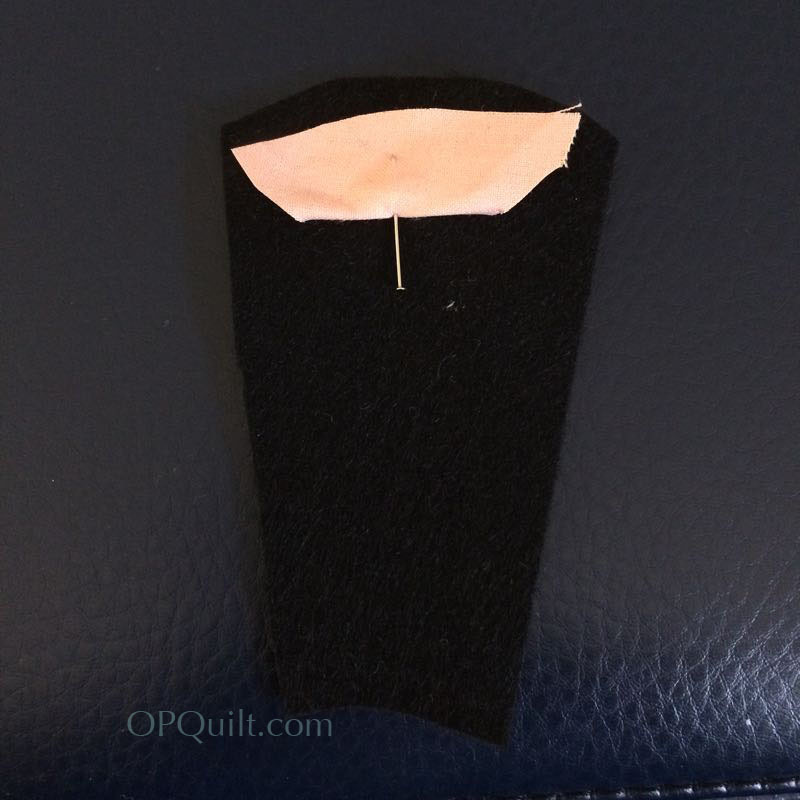 I also try to have my needle come out the “center” of that folded edge, not on the top. That way the stitches won’t be too obvious, and then I don’t pull it too tightly. I want my circle to float. 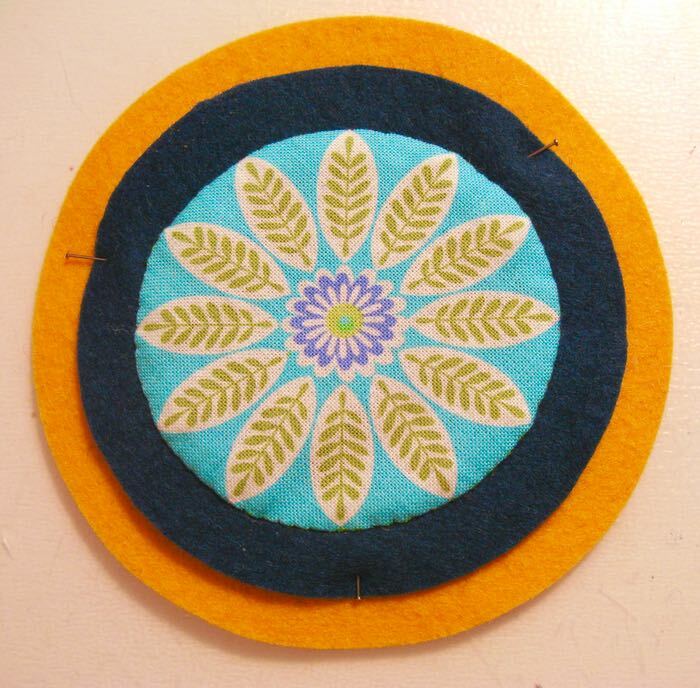 As I mentioned, I am appliquéing this medallion to a larger piece of felt. 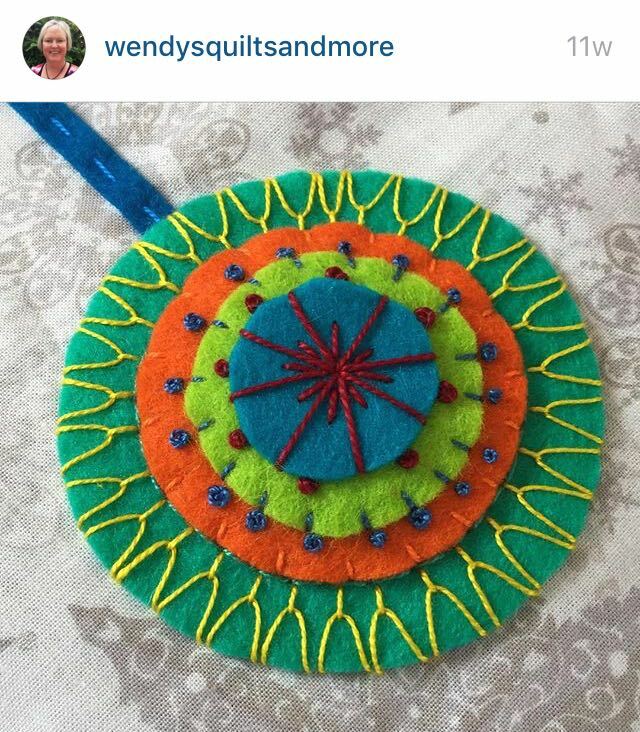 Wendy picked up this tip from Wendy Williams, the author of this pattern (and found on IG at Flying Fish Kits–also a resource for stitching ideas), and this tip is also found in Williams’ book, Wild Blooms and Colorful Creatures. Layer it up, and save it for a good TV program (Wendy of Quilts and More has a great shot of herself stitching while she watched a cricket match) when you can stitch away. This is circle #1, and is the largest circle of the bunch. 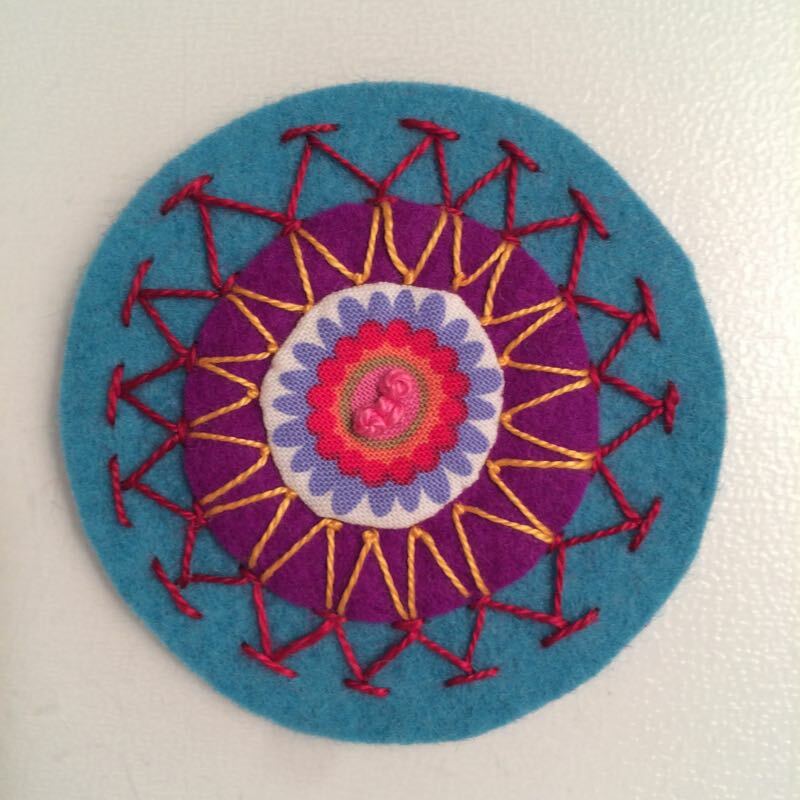 Next up is my auditioning another fabric medallion against several colors of wool felt. 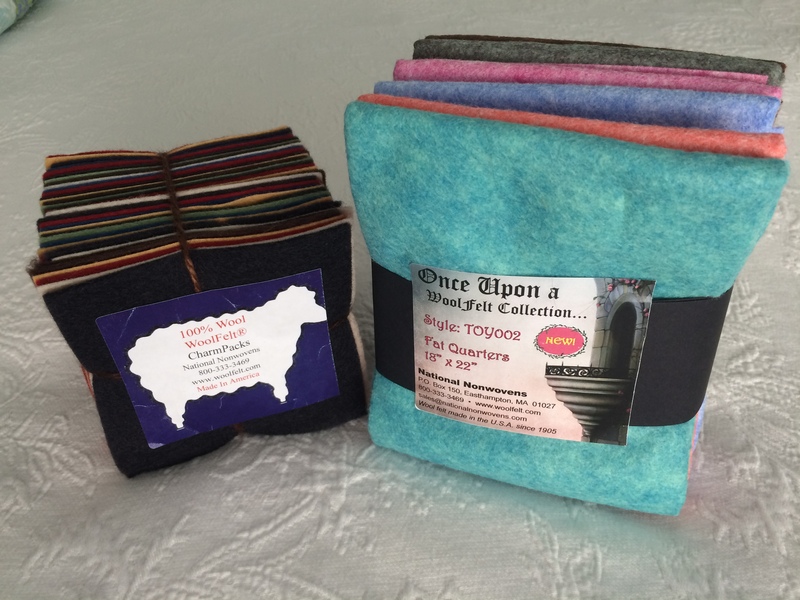 I added more info about where to buy wool felt to the original “Prepare” post, and yes, you can mix the felted wools and the wool felt, without any Quilt Police coming after you, if you want to purchase some. 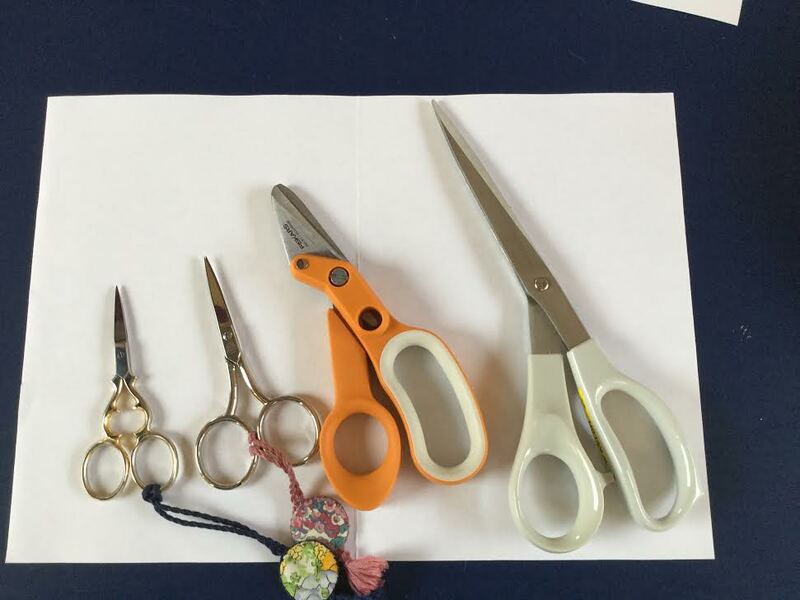 I am using Kaye Buckley’s scissors, which have one serrated edge that grips the fabric and helps me trim them evenly. 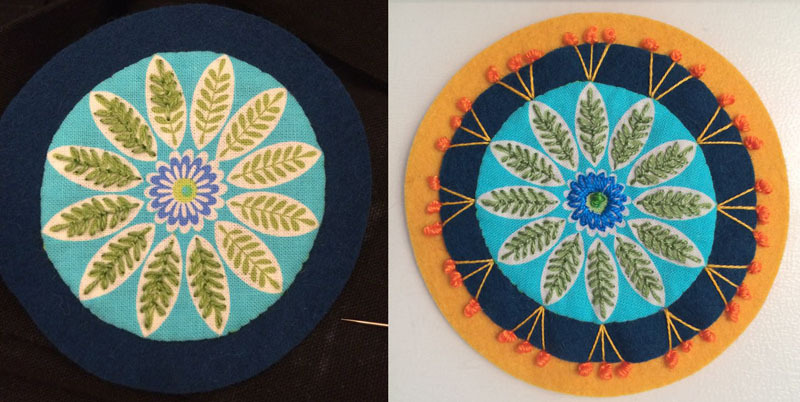 Being the Nervous Nelly that I am (it took me weeks to screw up the courage to start the flowers), I layered the circle over one of the smaller appliquéd flowers to kind of get the size I needed, then cut halfway around. I took off the freezer paper, and finished up the job. 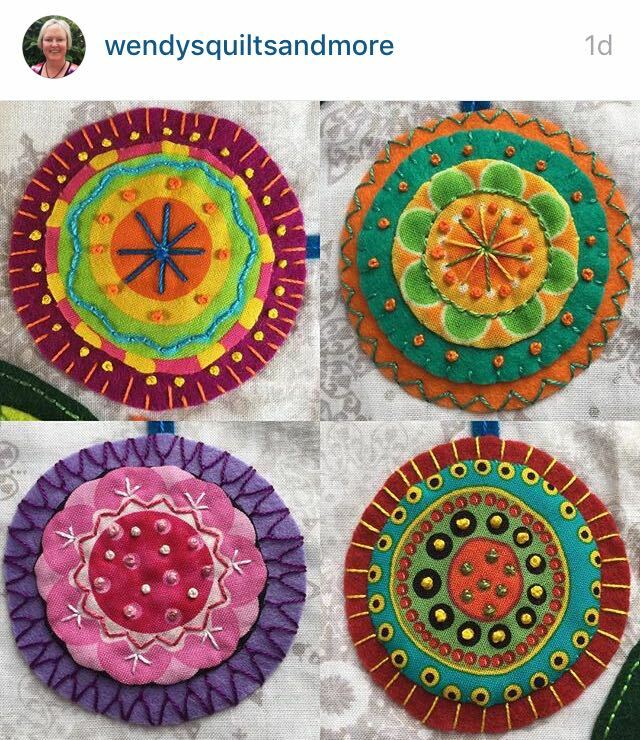 So here is my first batch of prepped-up circles; some have fabric and one doesn’t. 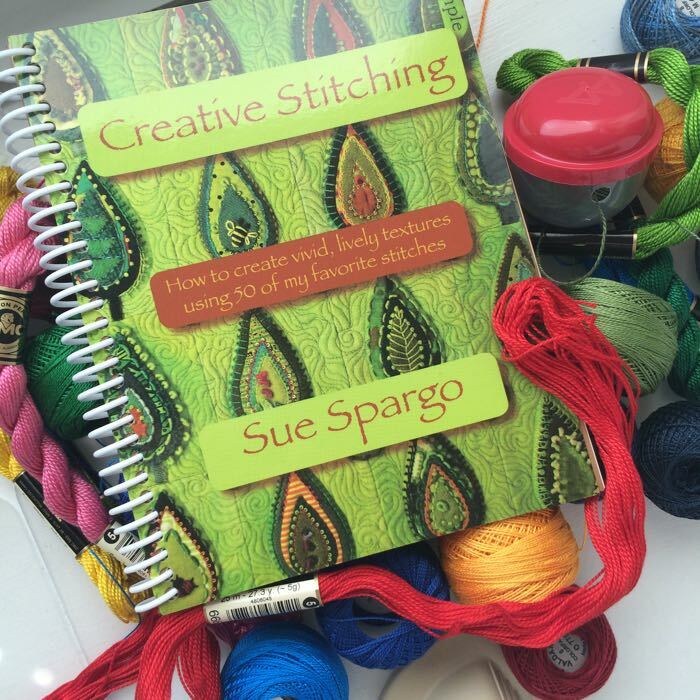 To make my life easy, I pulled out my Sue Spargo book and leafed through some ideas. 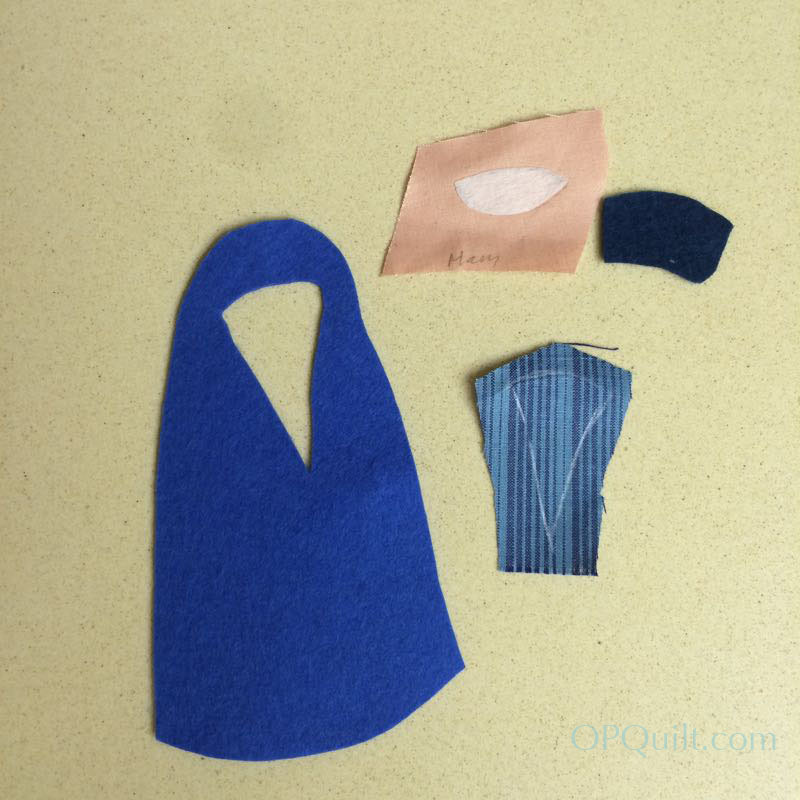 I’m using two weights of pearl cotton: size 12 (recommended) and size 5 (larger, more visible). 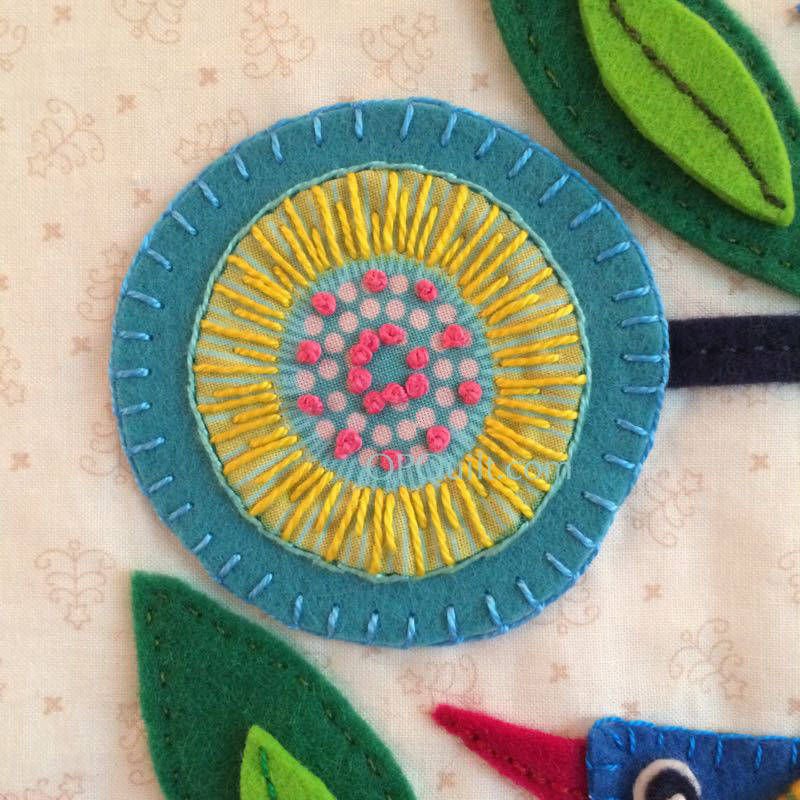 I am using wool appliqué size #22 needles, which have a nice big eye and a sharp point and aren’t too long. 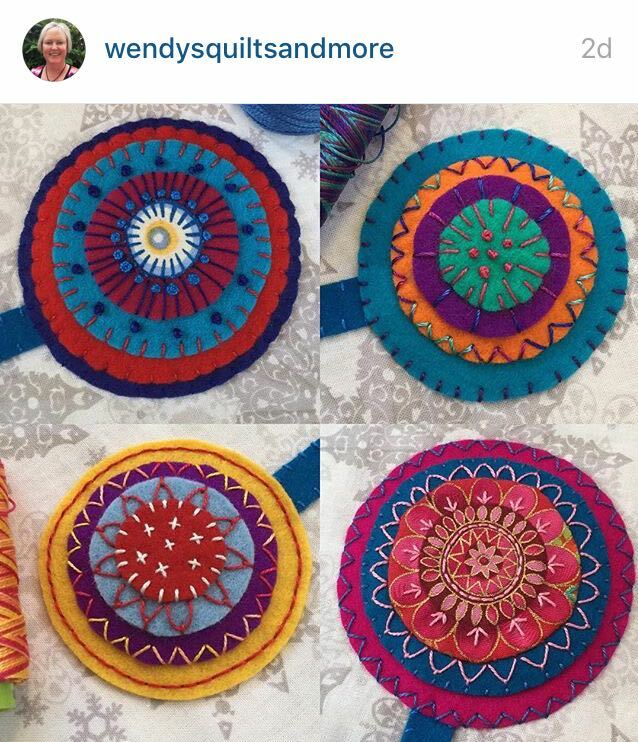 Then I pulled up Wendy’s IG feed (all the photos below) and got a few more ideas, then just put my needle in the center and began. 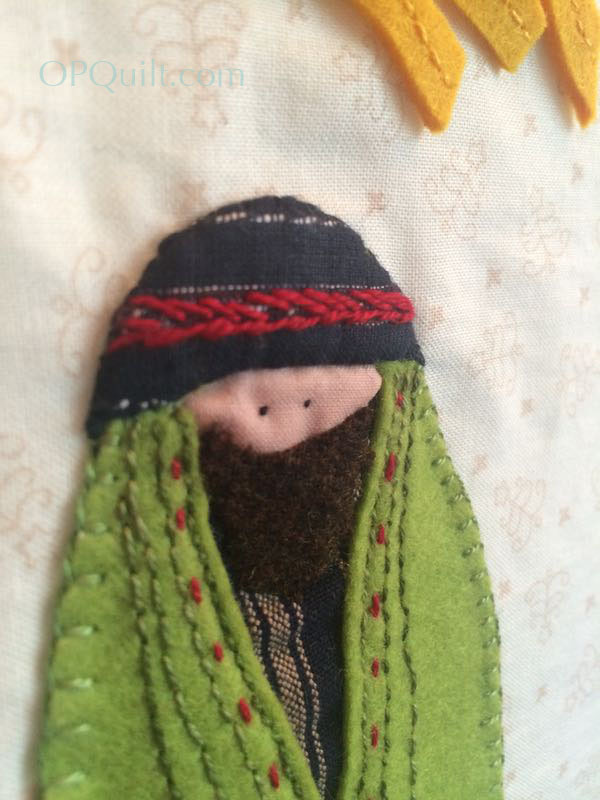 I happened to think about what I wanted to do and decided to stitch them all layered up like this. 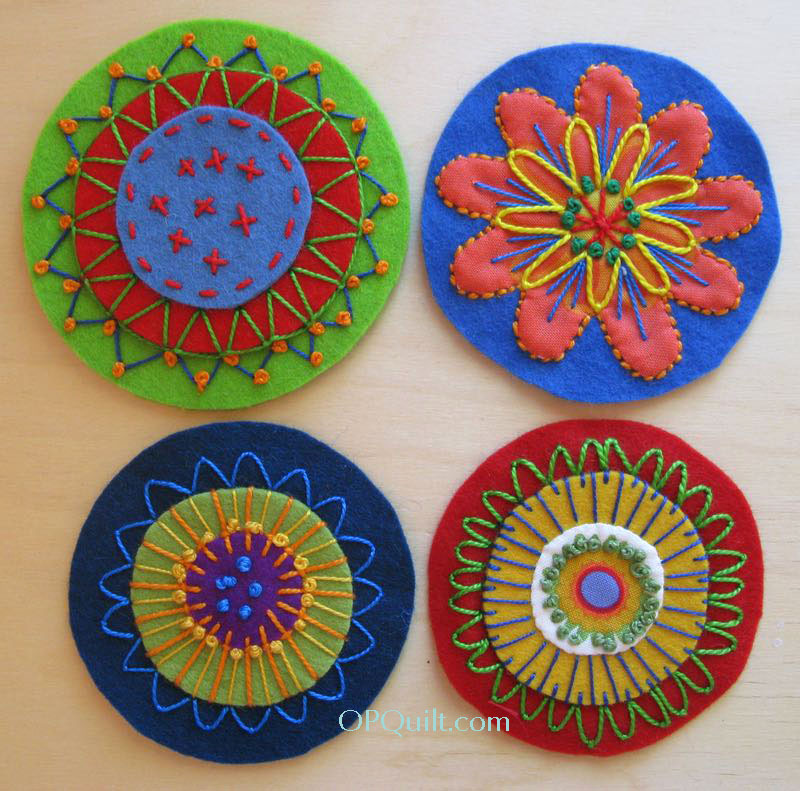 However, you may, on some circles, choose to embroider one circle, then add it to the next. 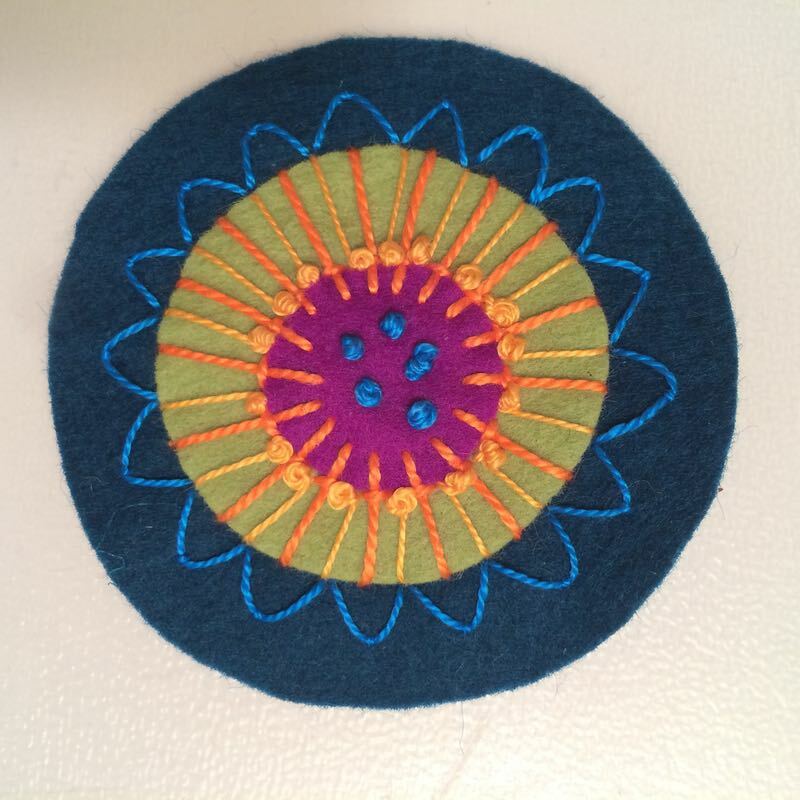 I was still trying to gather my courage when I began this, so stabbed my needles into the center of the magenta circle, close to the edge and ran the orange #5 thread all the way out to the edge of the yellow-green circle, working my way around. 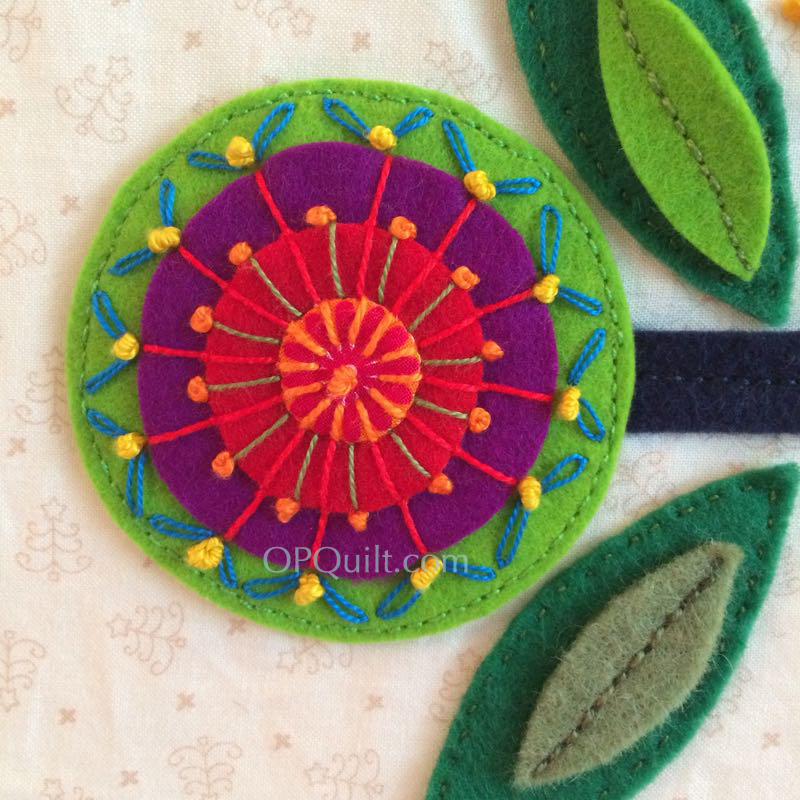 Then, I took a small catch stitch over each of those “rays,” close to the outer edge of the magenta circle. I switched to the thinner #8 thread and did straight stitches in between the others, then went back and added the yellow French knots at the top of each of those “rays.” I threaded on the blue thread, and did a few more French knots (odd number) in the center, not really caring how they landed, as I wanted a clustery look to them. 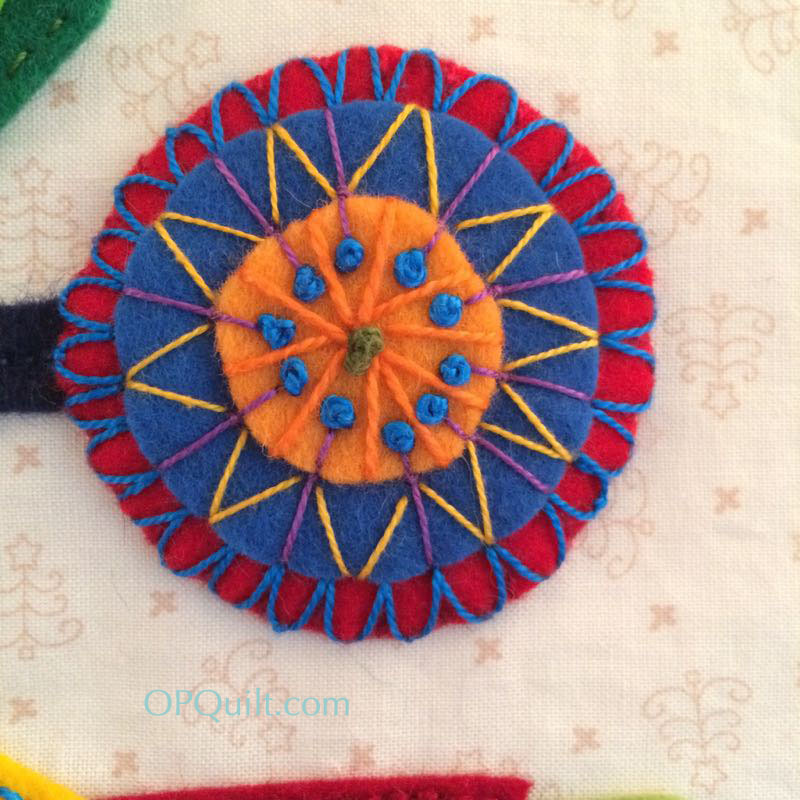 Then I did an open Laisy-Daisy stitch on the outside, creating a row of “petals” with my thread. Here’s another. On the left, the beginning. You can see on this flower, I chose to echo the print of the center fabric. I am doing the first layer of felt by itself. 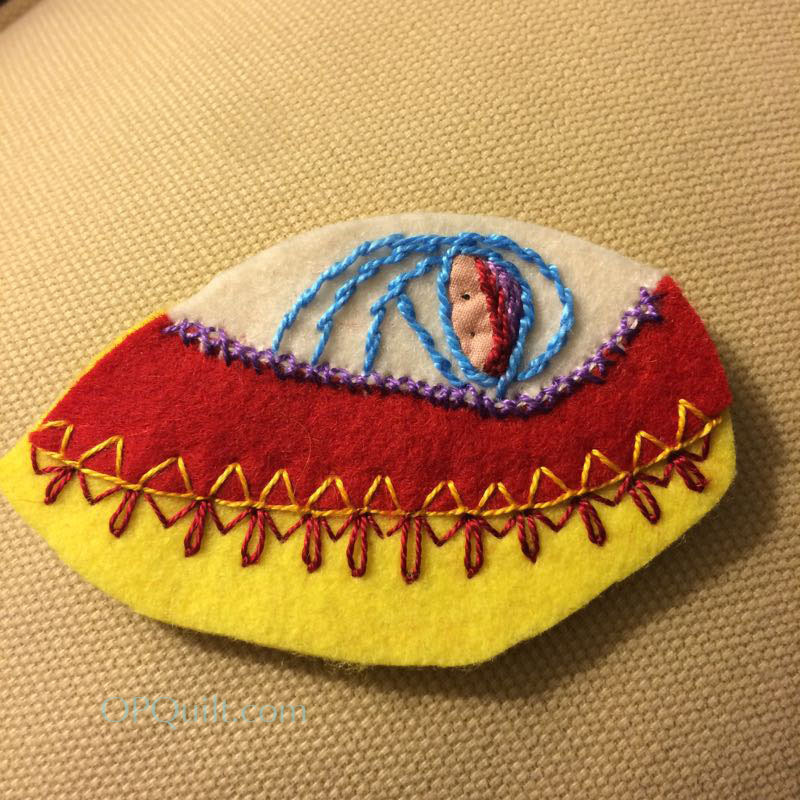 I then layered it onto the second (gold) layer and kept stitching. This is the biggest flower, destined for the top of the tree, so I wanted something bright, yet echoed the colors throughout. Again, here they are, unadorned. After a couple episodes of Downton Abbey, they are embellished. 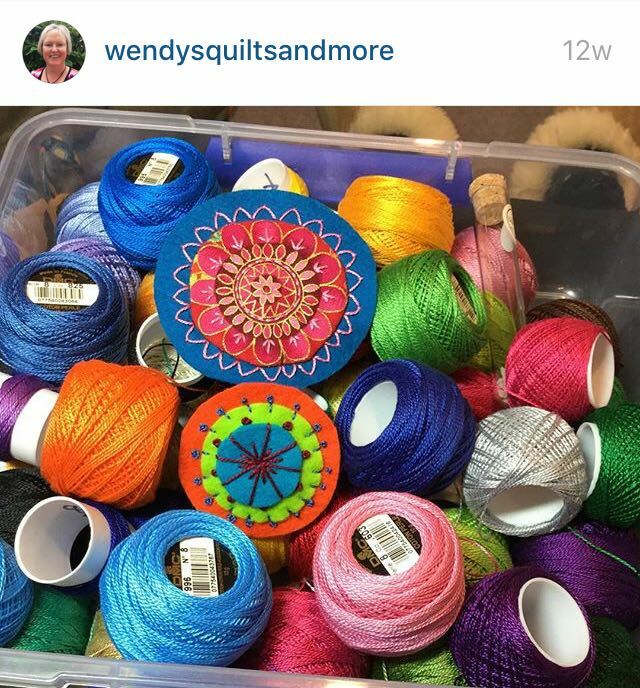 I wrote to Wendy and asked her how long they took her to stitch (hence that hashtag on IG of #startyourneedles), and she replied that she can get two done in an evening. 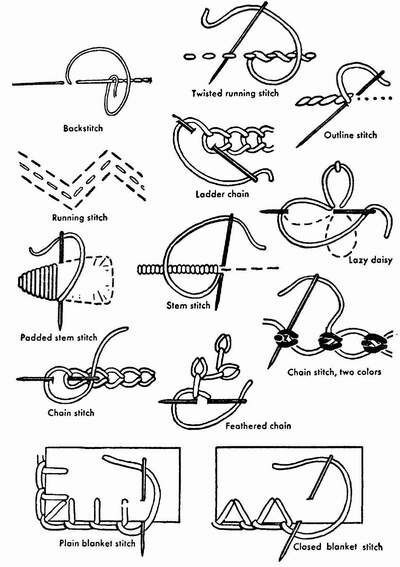 That’s about my speed, although I think I as get more familiar with stitches, I’ll be faster. Pay attention to your pearl cotton/felt colors. 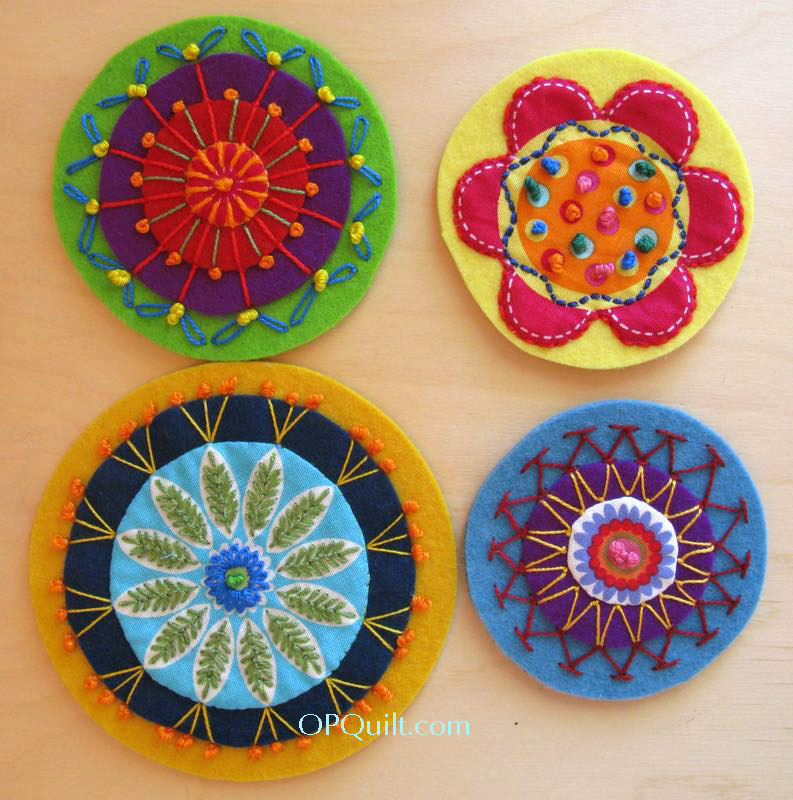 I loved the fabric in the pink one, upper right, but after I stitched it? Not so much. Either I’ll put that one where it’s not really noticed, or stitch another. 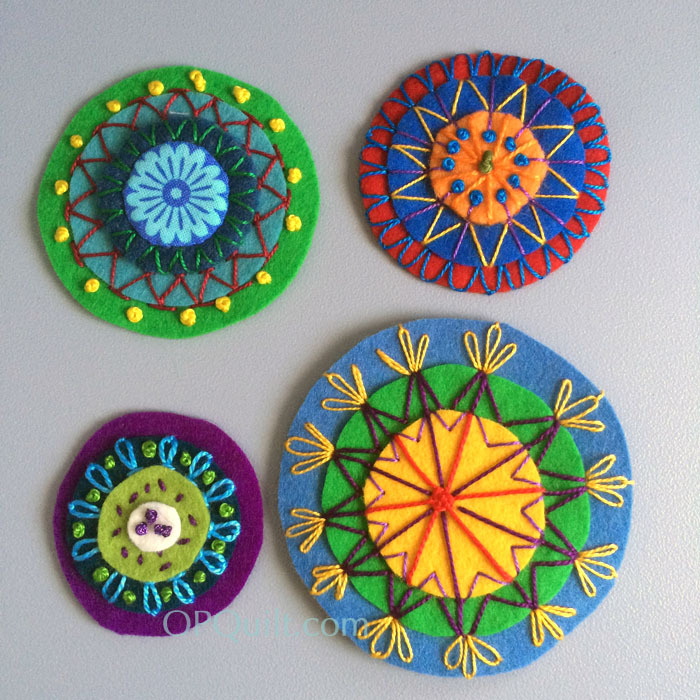 I also started with the bigger circles; I’m sure the smaller ones will go faster. 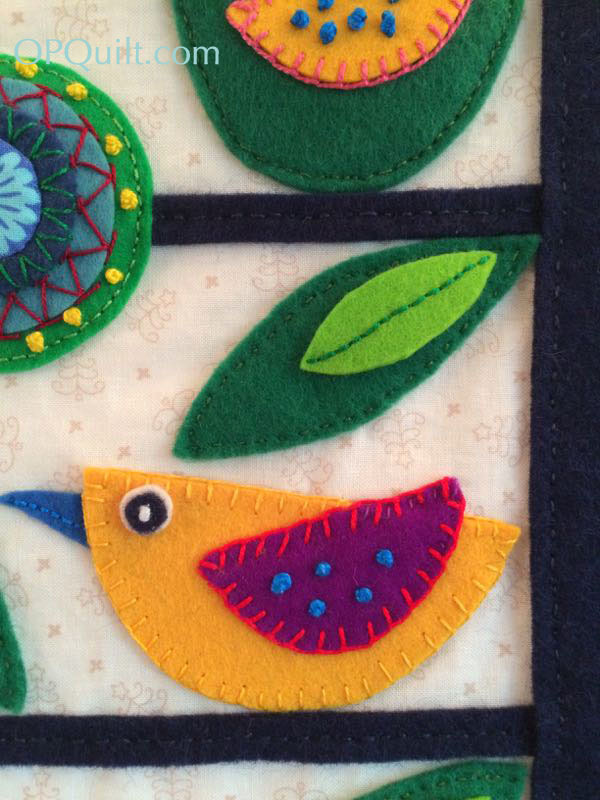 You can see Wendy has a great variety of stitches, and uses the appliquéd fabrics to great effect. —-> I just have to make a comment here. We have until June to get our flowers done, as well as the birds (which will go really fast because we’ll be so experienced, right?) So no panicking, please. 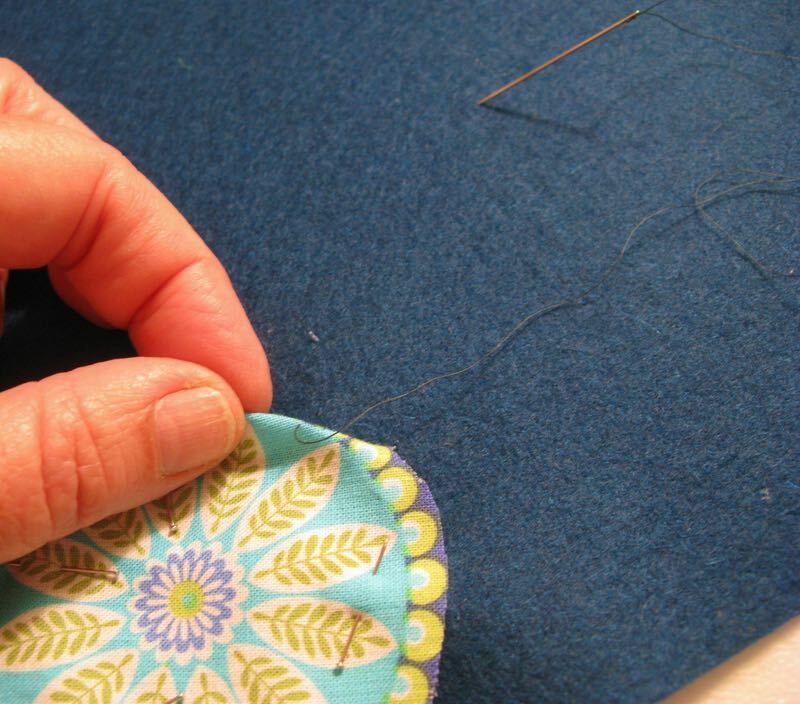 Just #startyourneedles, steadily stitching and by the time it comes to stitch down the flowers, you’ll be ready. 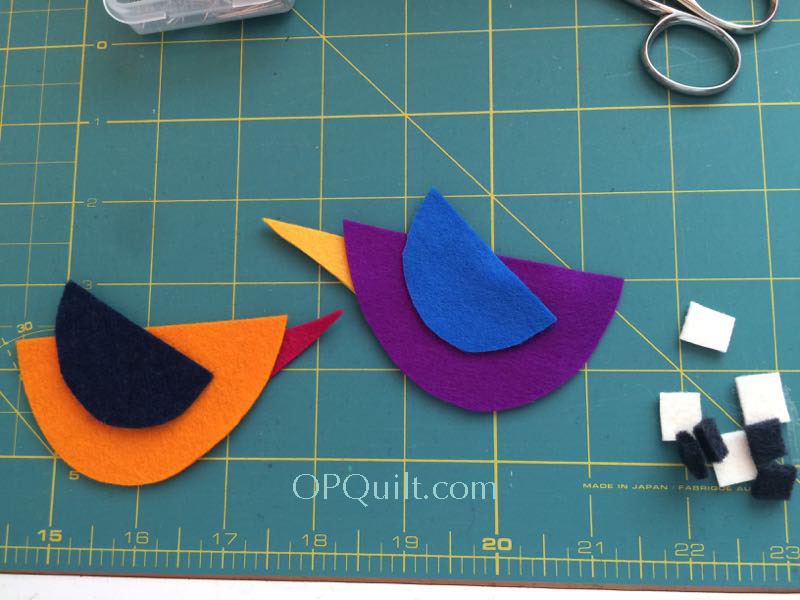 April, Step 3: Make 10 birds. See you April 2nd for the next step: birds. I have a few tips on these, too, courtesy of Wendy. You’ll enjoy visiting both her website and her IG feed for great ideas and to see a master quilter and stitcher at work, and take a look at how far she is on her tree. Inspiration! Thank you, Wendy, for all your help. Reminder: If you tag your IG photos with #ohchristmastreeqal, we can all help each other out with ideas for stitching, plus it’s just fun to see what you are all doing! Here we go. I have two giveaways, and I’ll choose the winners from comments here. First is another magazine, if you know someone who wants to jump in, or doesn’t have their own copy. 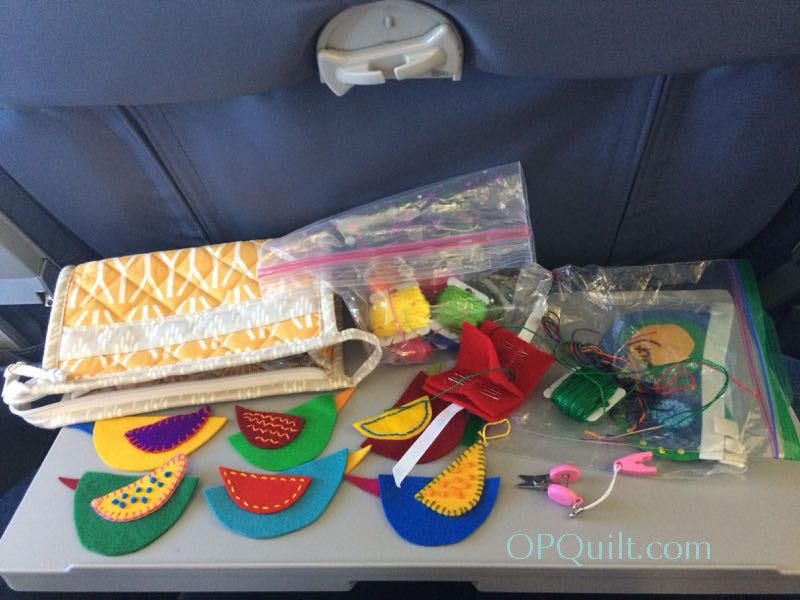 It’s courtesy of QuiltMania, who gave it to me at QuiltCon, when I explained what we were doing. 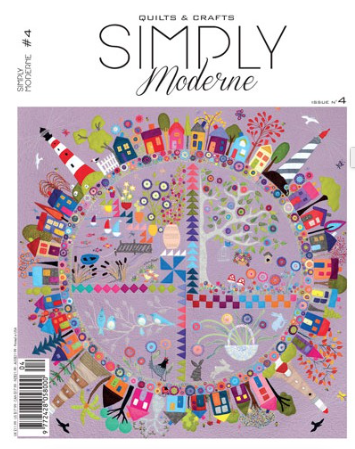 I’m sure if you wanted to subscribe, they wouldn’t mind a bit, or order the Simply Moderne #4, if you want another eye-popping design (way below). 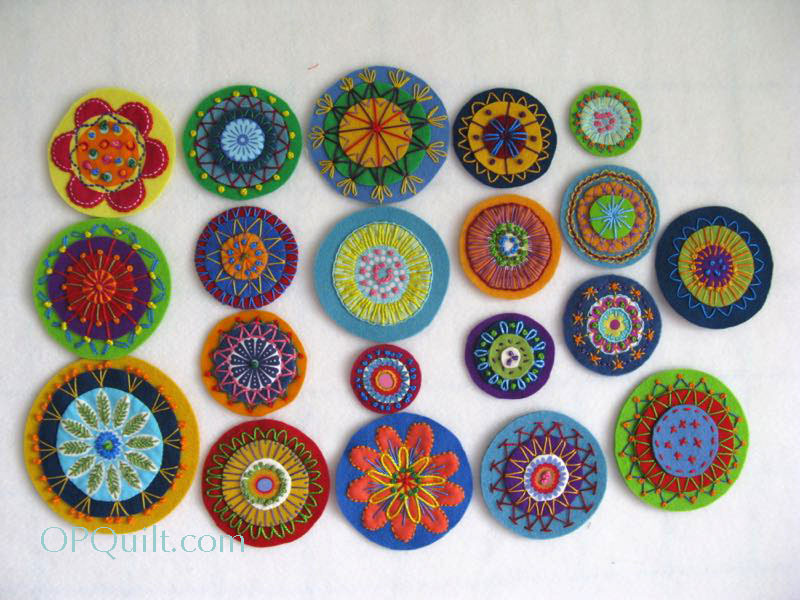 Second giveaway is an envelope full of fabric medallions, my choice (I’ll cut from my extensive stash of medallions). You can use some, share some. 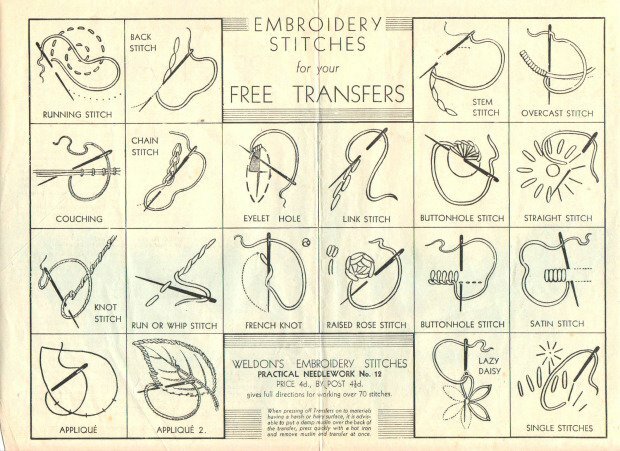 There will be at least a dozen to help you get going on your stitching. I’ll announce the two winners on Friday. 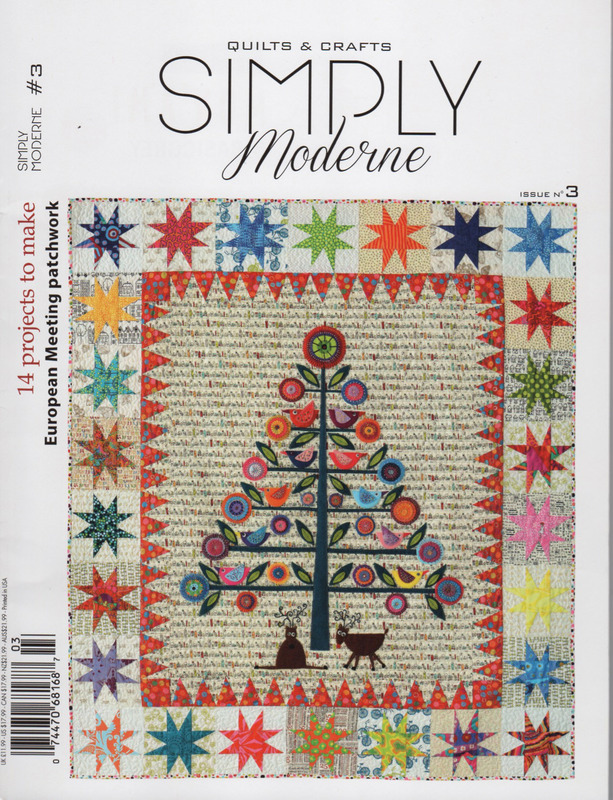 Indicate in your comment which you are most interested in: Simply Moderne #3 magazine (with our tree on it) or medallions. Yea, you have to choose. UPDATE: Comments closed. 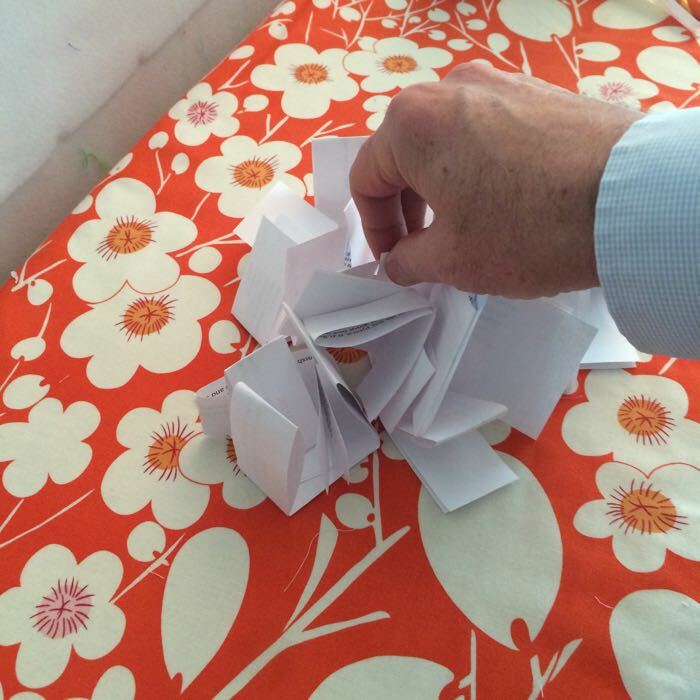 Winner announced tomorrow mid-morning. See you April 2nd for Step Three! 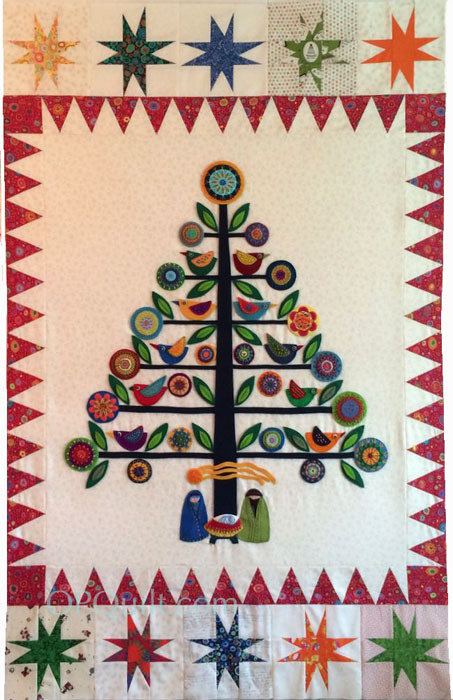 Oh Christmas Tree Quilt-A-Long & a Giveaway! 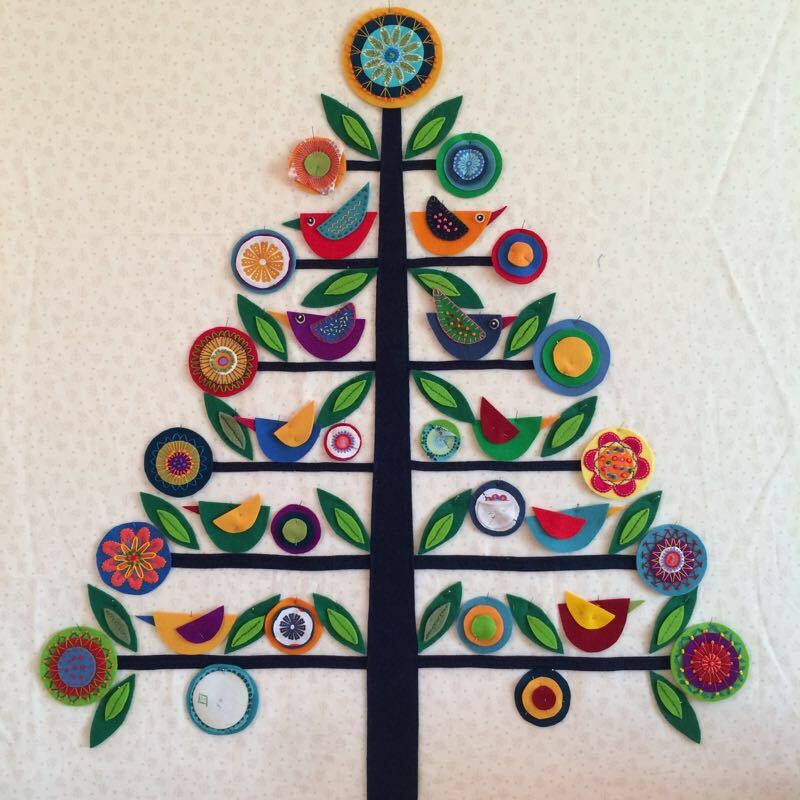 Posted on January 5, 2016 by Elizabeth E.
When I first saw this Christmas Tree on Instagram, I fell in love. 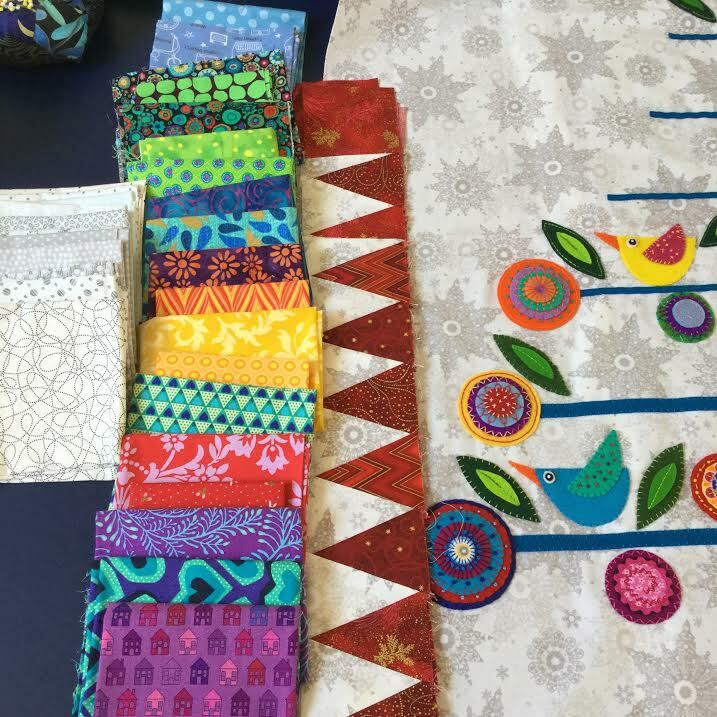 So I proposed a Quilt-A-Long that would force enable me to to get it completed in time for Christmas 2016, for there is power in having to put your innermost feelings about quilts/goal setting out there in the world and shaming yourself into finishing it. I’m really good at this, I know. I wrote to Wendy Williams, who designed this pattern, and she gave us her blessing, and said “she can hardly wait to see the quilts that will come of this.” So onward, everyone! The magazine where this pattern is found is Simply Modern Issue #3, and that’s the giveaway part. I have an extra copy which you can win, but wait a minute. First let’s do the business of this. 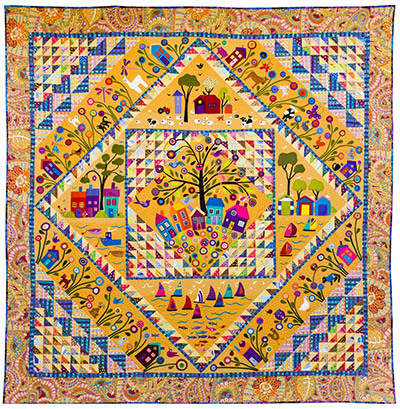 If you aren’t lucky enough to win this, you can buy it from Fat Quarter Shop, or the QuiltMania people, or if you live in Australia, it’s on Wendy’s website Flying Fish Kits (link below). 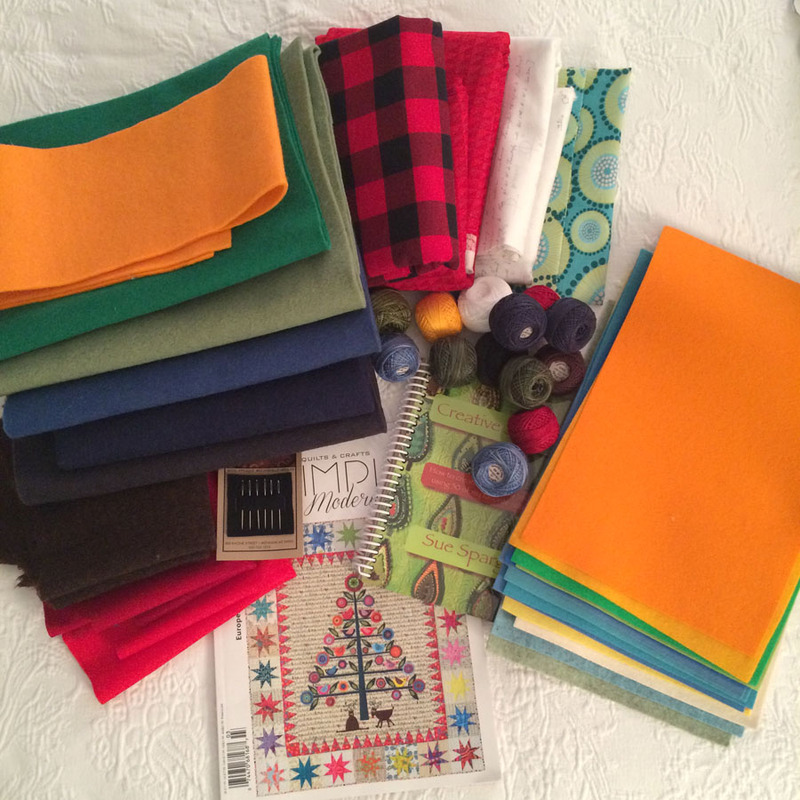 January, Step “prepare”: buy the magazine, gather your fabrics, buy the felt/wool, buy/find the pearl cotton. More about that in a minute. 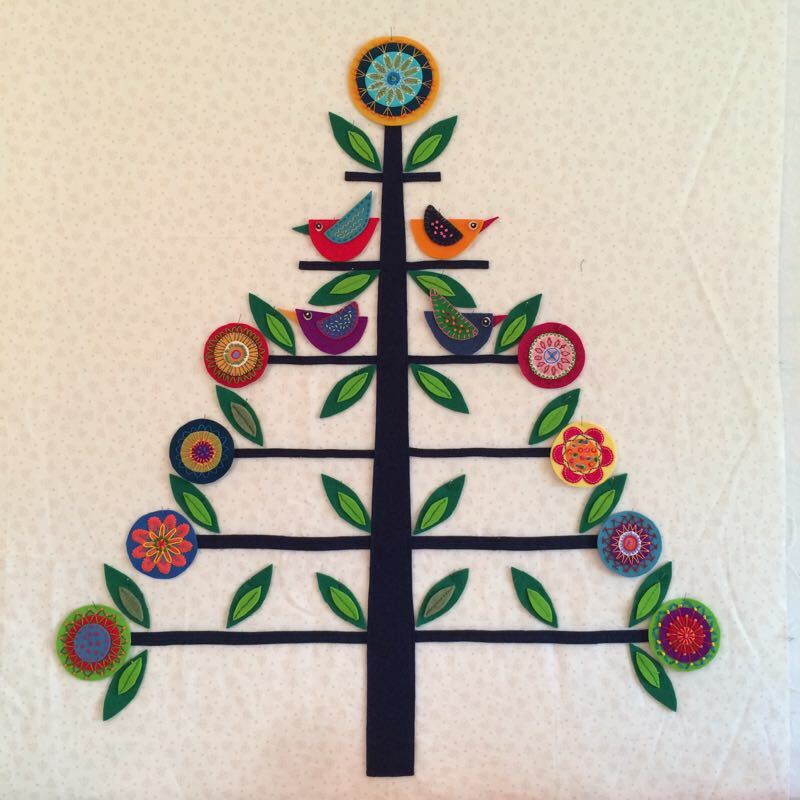 February, Step 1: Make the tree on the background and stitch it down. 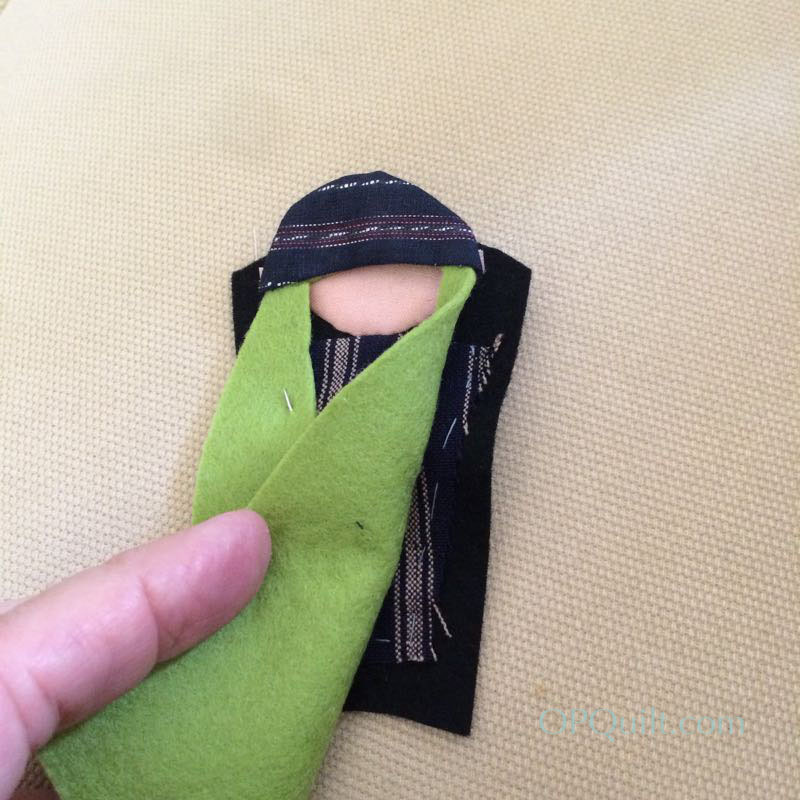 If you use wool felt, she has an easy appliqué method. 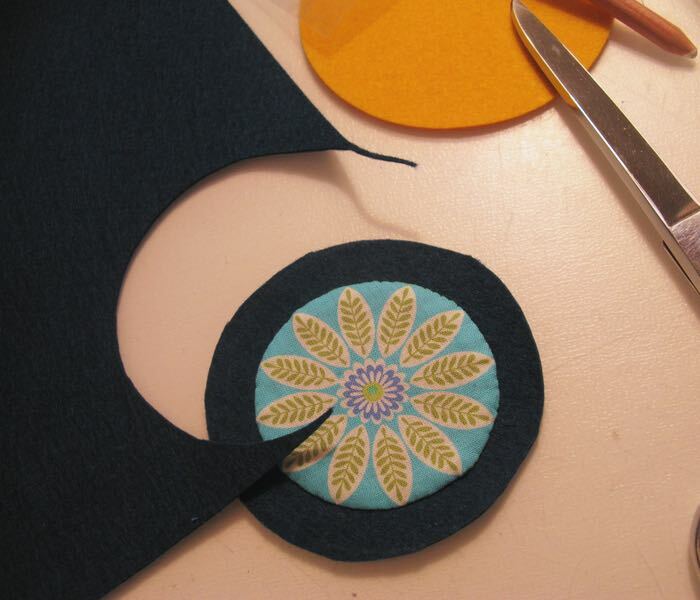 June, Step 5: Appliqué down the flowers. 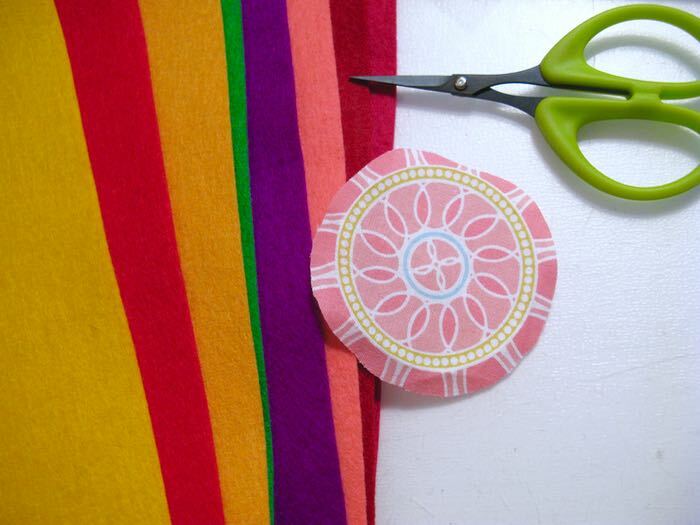 August, Step 7: Sawtooth border (reds). 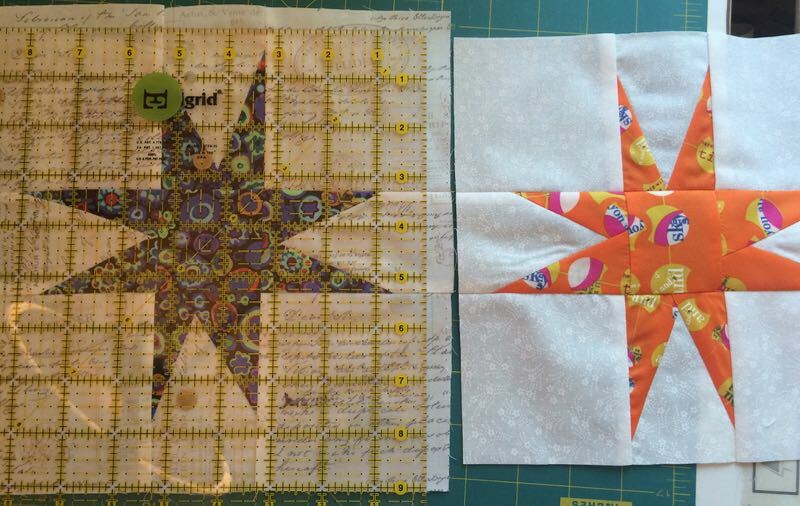 September, Step 8 (finish up Quilt-A-Long): Make wonky star blocks, sew them together and attach border #2. Ta-Done! I just have to deliver you here. 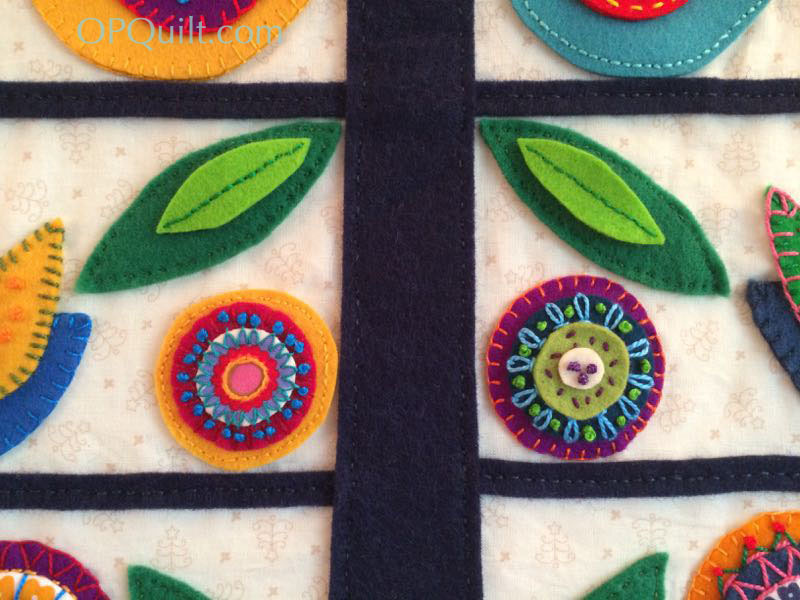 You are on your own for getting it quilted and bound. So here’s the drill for Step: prepare. 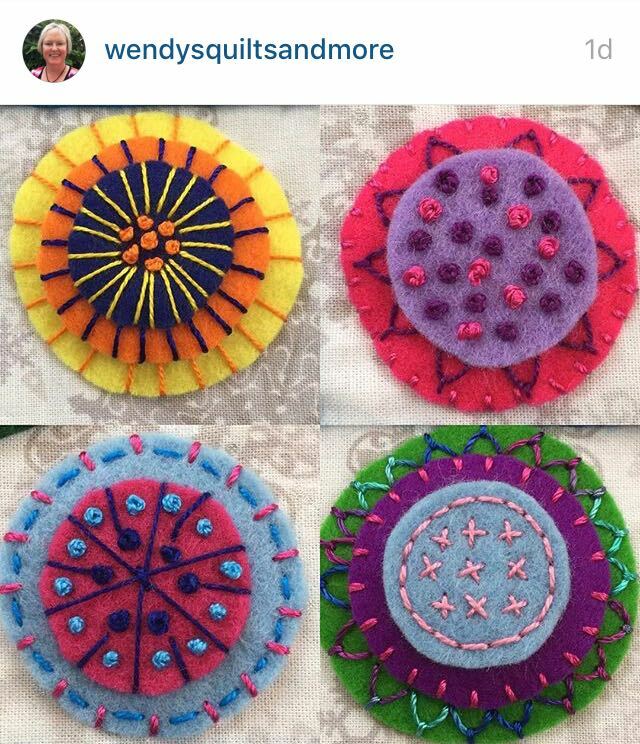 Wendy calls for wool felt. 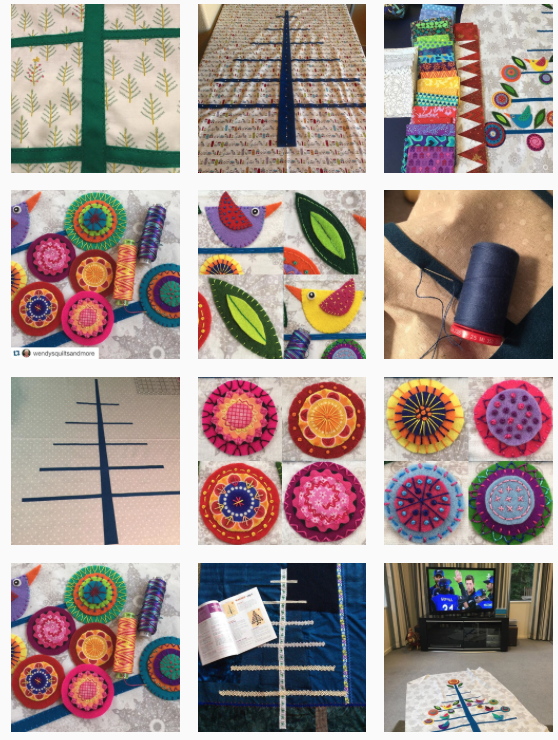 Some of my IG followers have left a lengthy series of comments on an earlier IG post about threads and wools (scroll back in the feed to find it–it says Step 1 on it, which is an oops, but it’s those Flying Monkeys again). 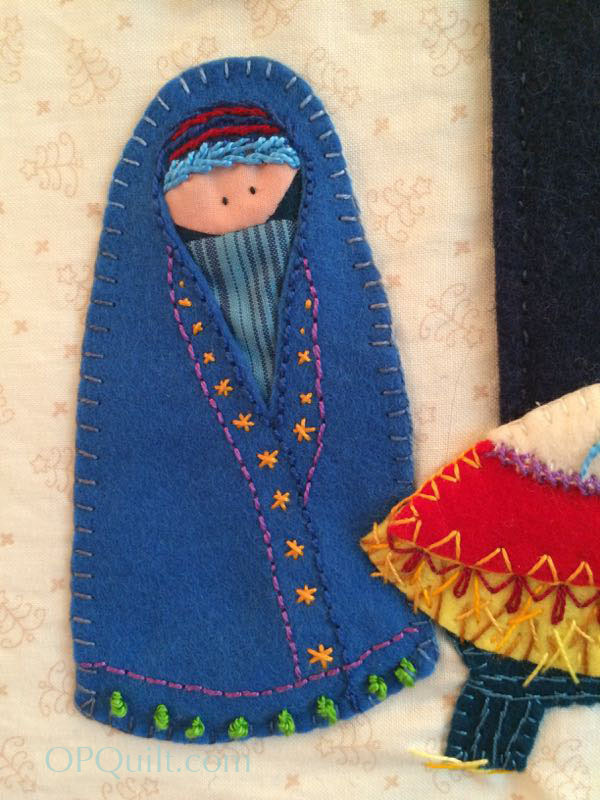 You can buy 100% wool and felt it yourself (more tips in her book or on the internet), or buy 100% wool felt. 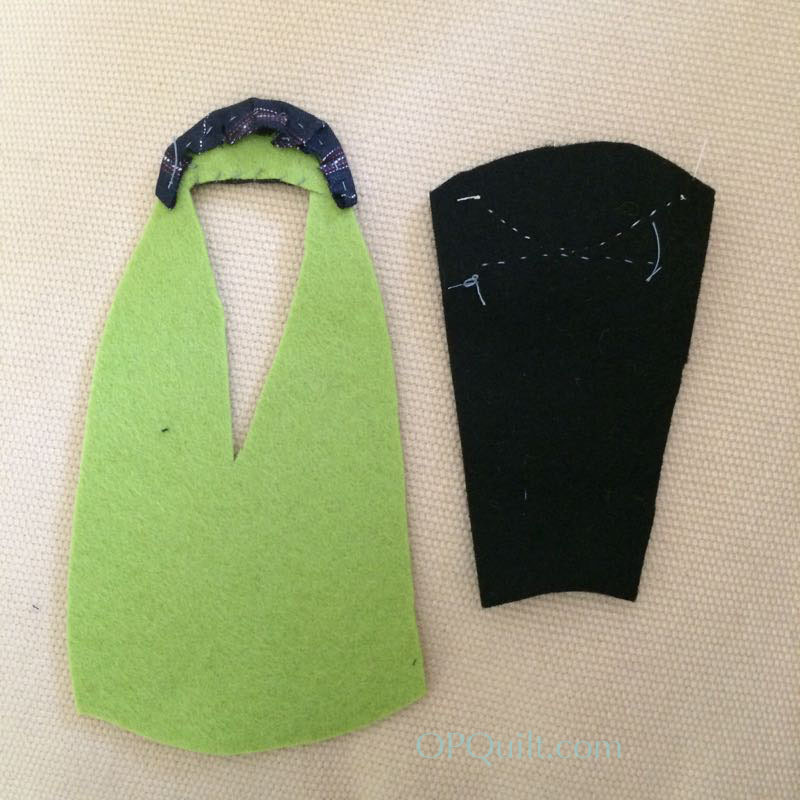 According to @yondergirlie, the preferred is the felt, as you don’t have to stitch it down as much as it doesn’t fray (sometimes the felted wools can fray). 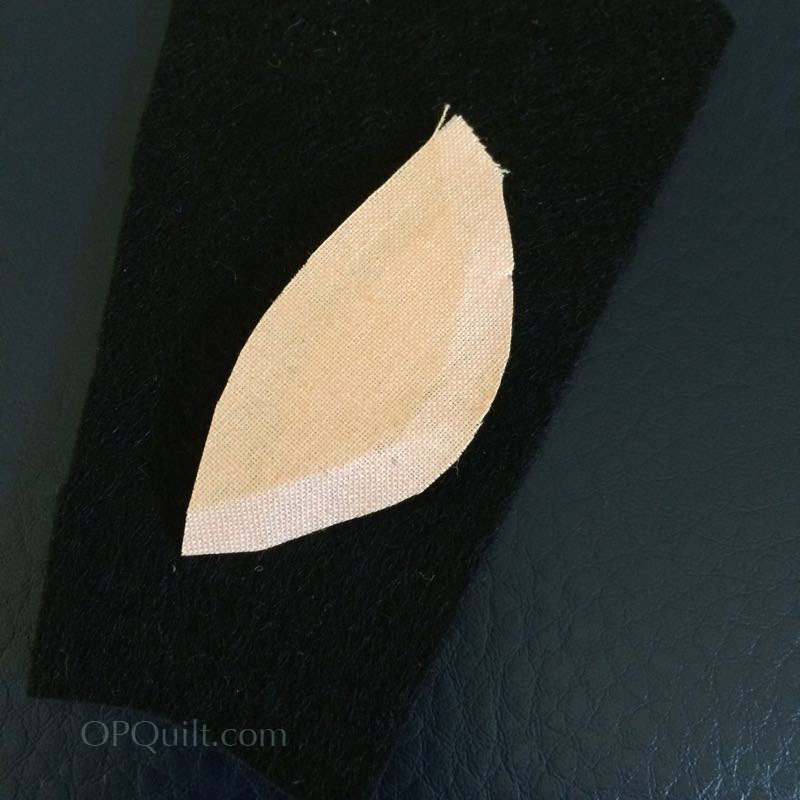 The general consensus was to use pearl cotton #8 for the embroidery. 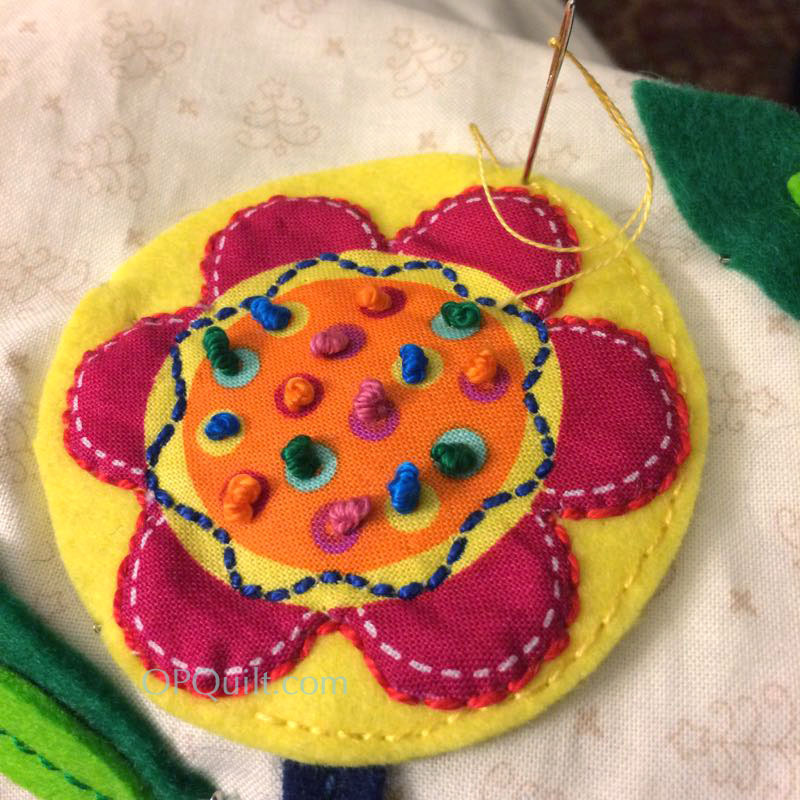 According to the pattern, you’ll also need a medallion-style piece of fabric to appliqué in the center of some of the flowers. 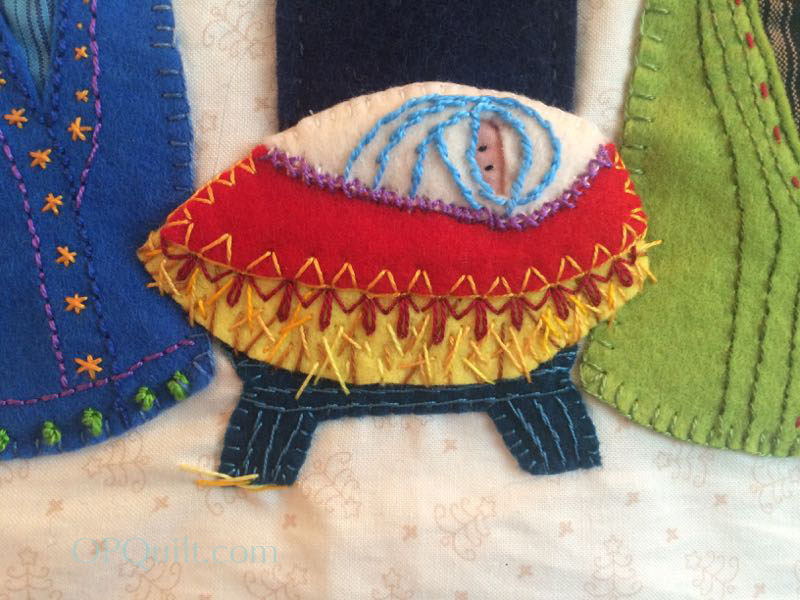 I love Wendy’s combination of wool and felt together. 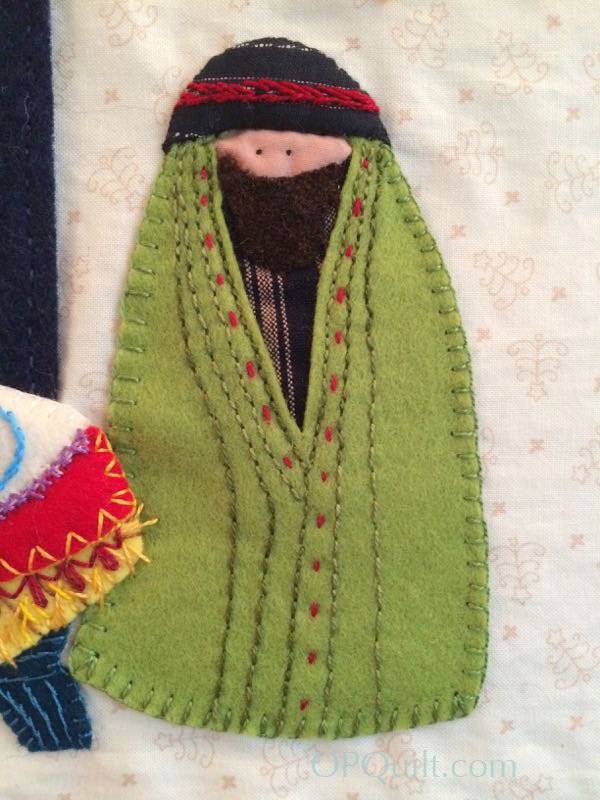 I visited with the people at a local shop today that specializes in felted wool. When using the wool they use Steam-A-Seam 2 to back their pieces, fuse them to the top, and then they handstitch around them, using pearl cotton size 12 thread. All these are options for you to try and to experiment with. 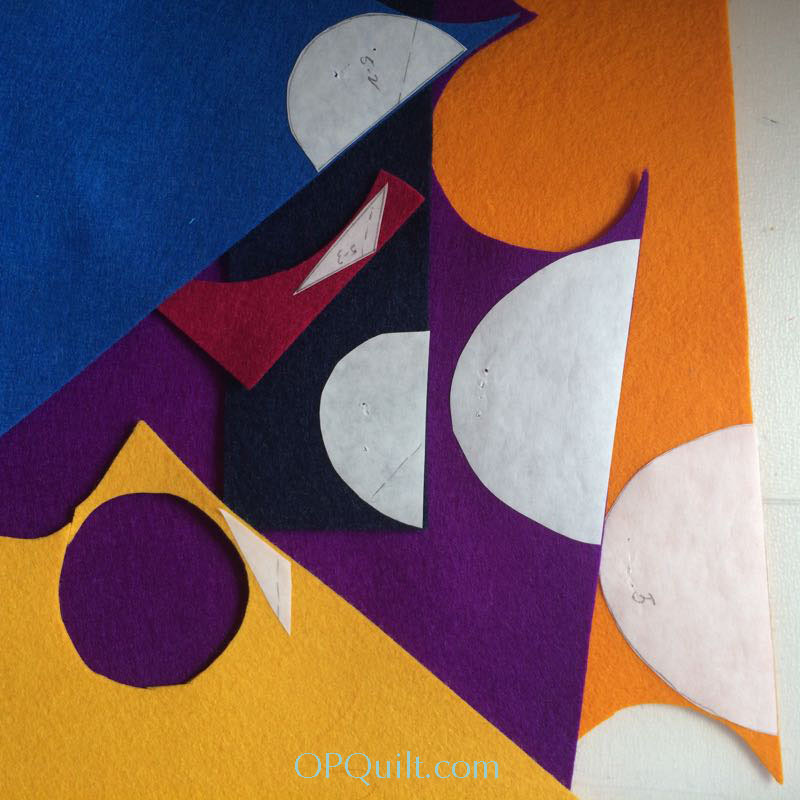 I’ll be using wool felt, plus some felted wool sweaters for accent pieces, that I recently re-discovered in my garage (let’s hear it for UFOs that deliver to your newest project). 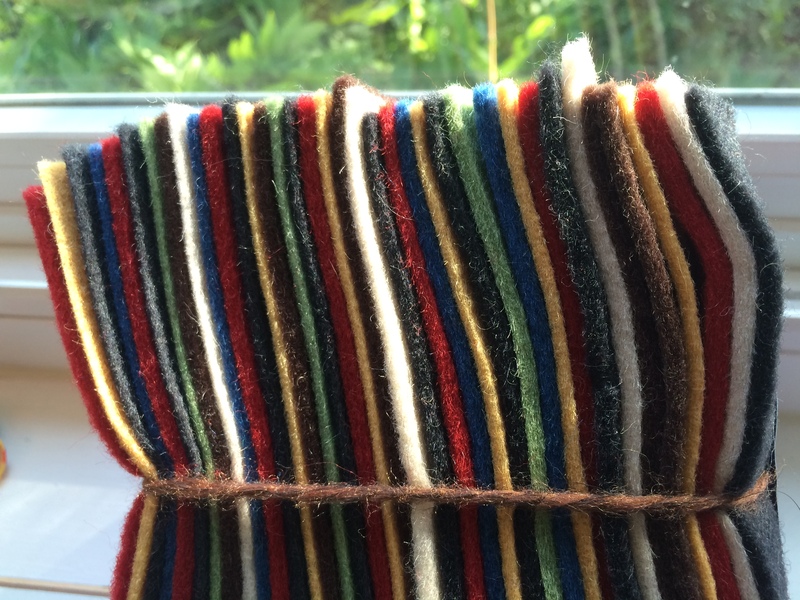 I also found a stash of wool felt that I purchased in Munich, Germany some years ago. If you want to take a trip there, I can provide the address (it’s another one of those things that I buy, hoard away, and then later find a use for, much to my delight). 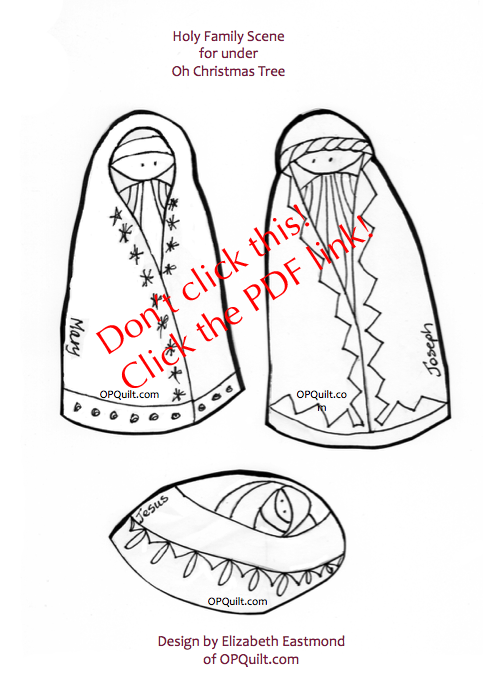 Many others mentioned an ETSY shop: https://www.etsy.com/shop/quiltingacres [copy and paste addresses into your browser address bar]. 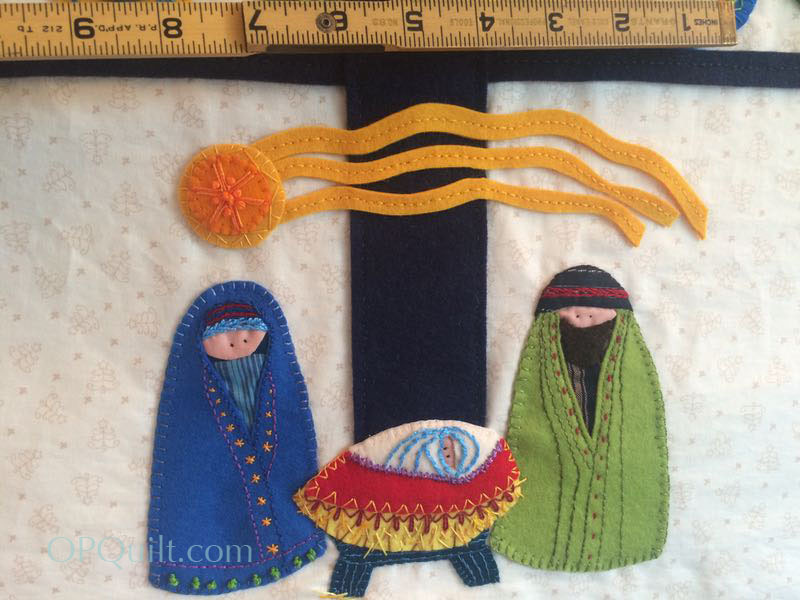 I’ve also seen Primitive Gatherings mentioned for felted wool, as well as @benziedesign on Instagram. 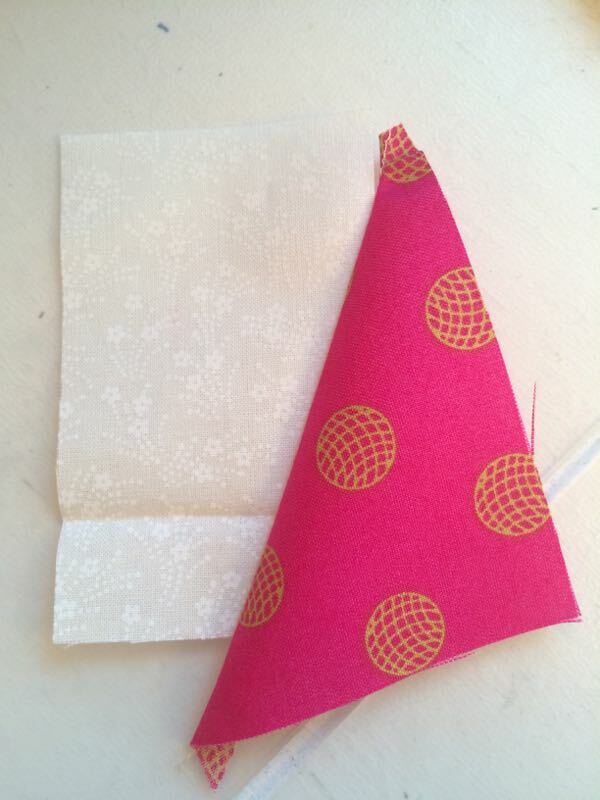 I have found lots of Christmas fabric on sale this past month to use for the wonky stars, borders and background. 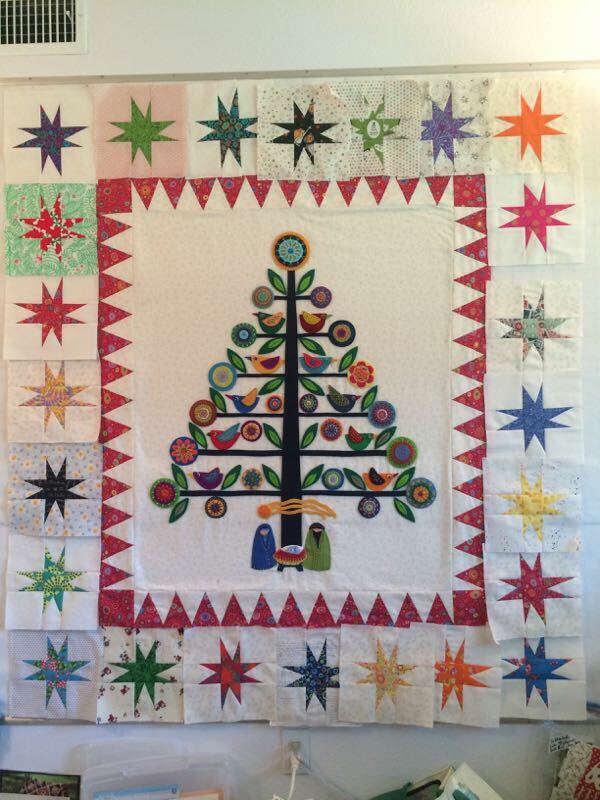 So, gather away and get ready for the Oh, Christmas Tree quilt-a-long! UPDATE (2/11/16): I’ve found two more sources for high-quality felt from companies here in the United States. 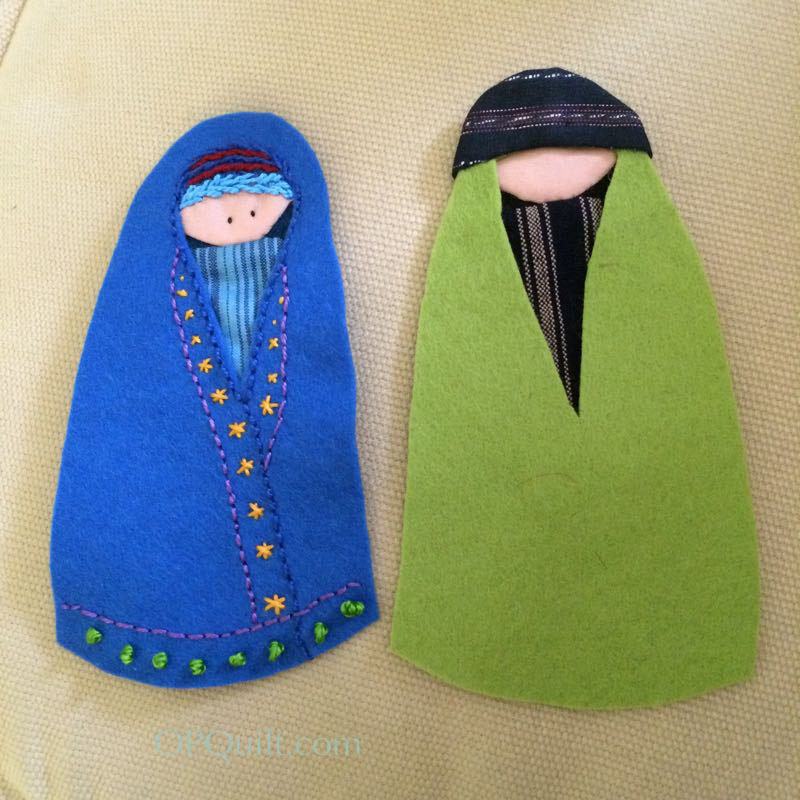 I’ve ordered from both of them and can attest to the quality of these felts (and no, they aren’t giving me anything for free). The first one is A Child’s Dream. 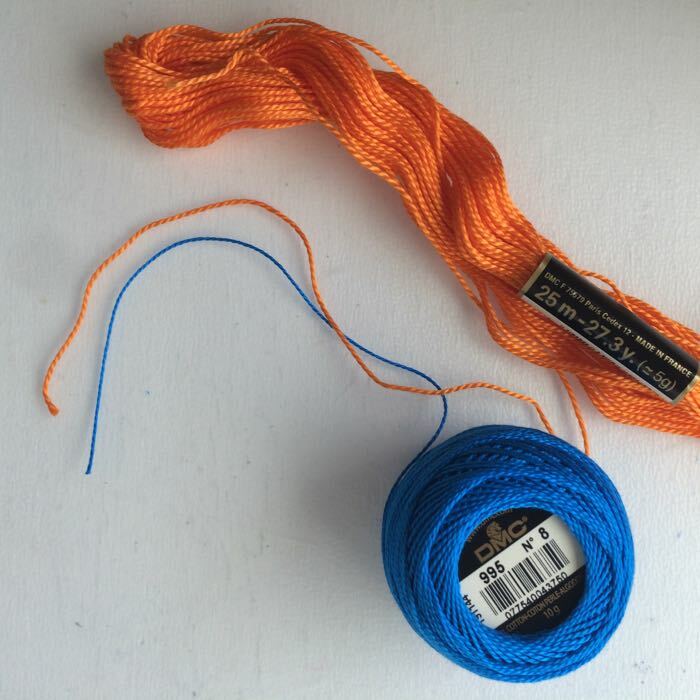 Above snapshot is from their website; they have several different thicknesses and many more colors, but I went for the “Holland wool felt” type of wool. 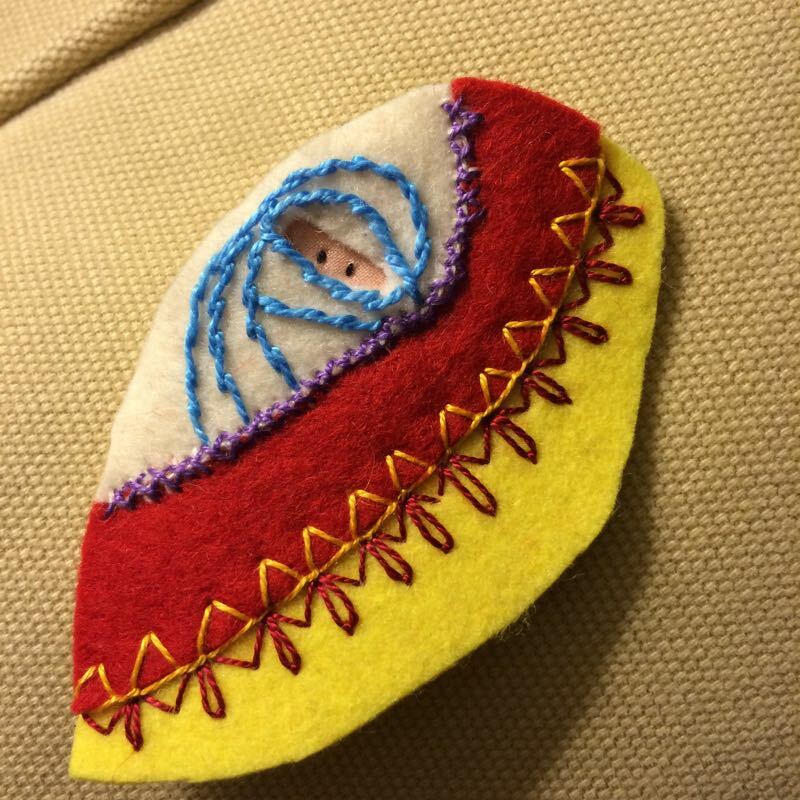 The second is The Felt Pod. 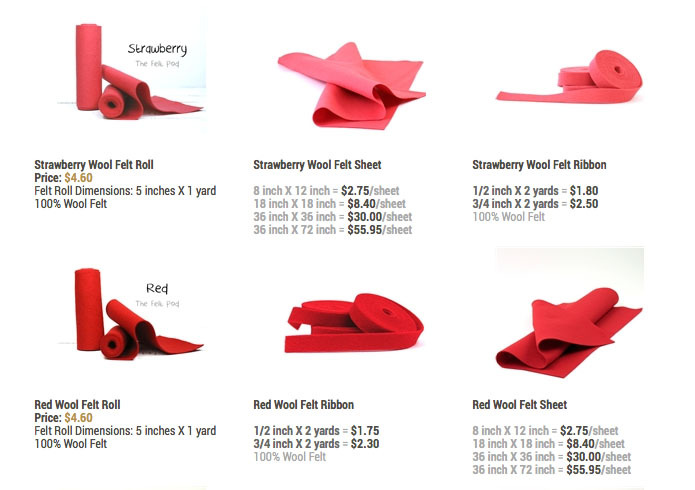 Again, a snapshot from their website shows many of their different products in their wool felt. This is the “Reds” page. Now for the giveaway (domestic only). HOWEVER! 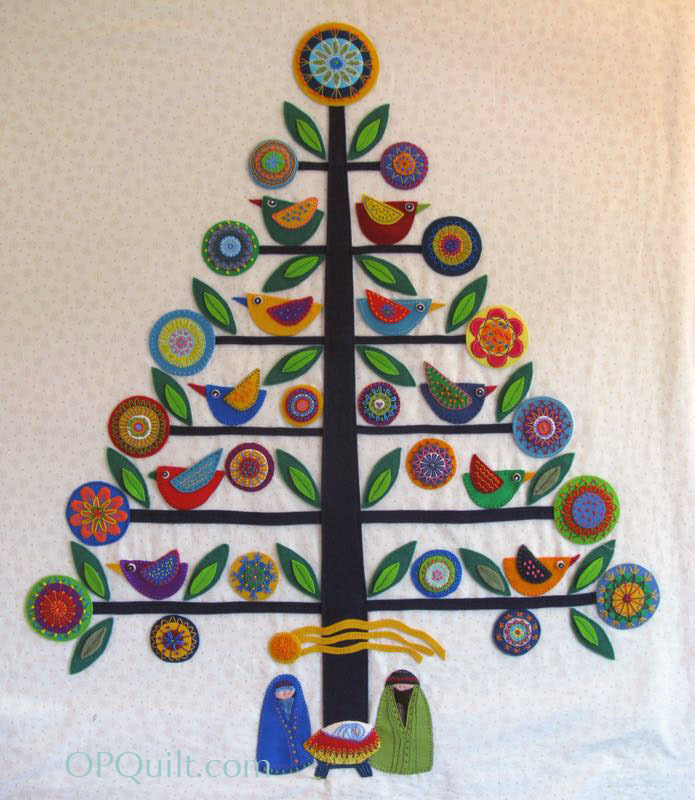 if you live in Australia, Wendy has patterns of this tree for sale on her blog (just thought you’d like to know). Since it’s my birthday tomorrow, I’d like you to leave a one-or two-line memory about your best birthday ever. I’ll randomly draw a name this weekend and get it sent off on Monday. Make sure you fill in an accurate email address as I’ll use that to contact you. 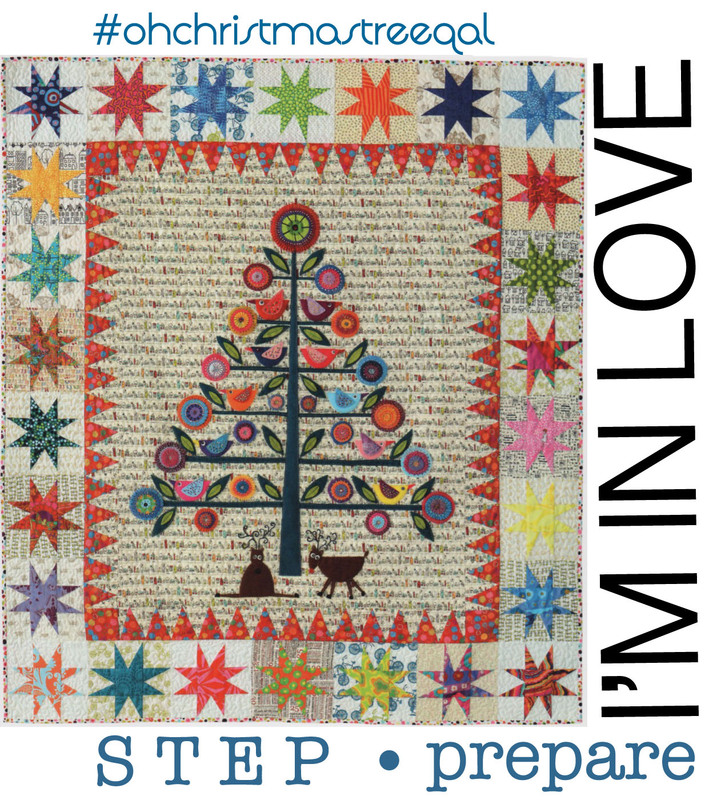 And if you throw your name in the ring for this magazine, I’ll expect to see a finished quilt this coming December, as you wouldn’t want to just hoard it away from someone who really really really wants it, would you? Leave your comments below. NOTE: Comments are now closed. Giveaway winner will be announced this afternoon (Friday, Jan. 8th).